Tiger’s Nest is the popular name of probably the most iconic monastery in Bhutan, much photographed and well known outside Bhutan as a symbol of this mountainous land. 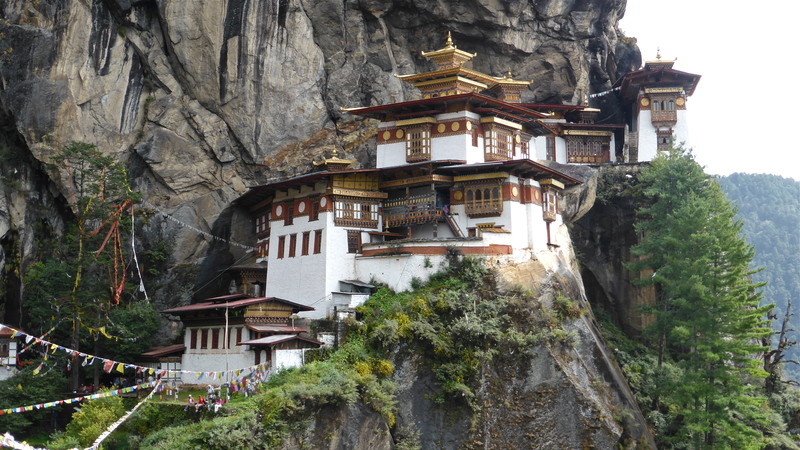 The correct Bhutanese name for this remarkable set of buildings is Taktsang Palphug Monastery. Perched on a sheer cliff some 900m (2952 ft) above the valley floor below, the present buildings occupy a site first used to build a temple complex in 1692. 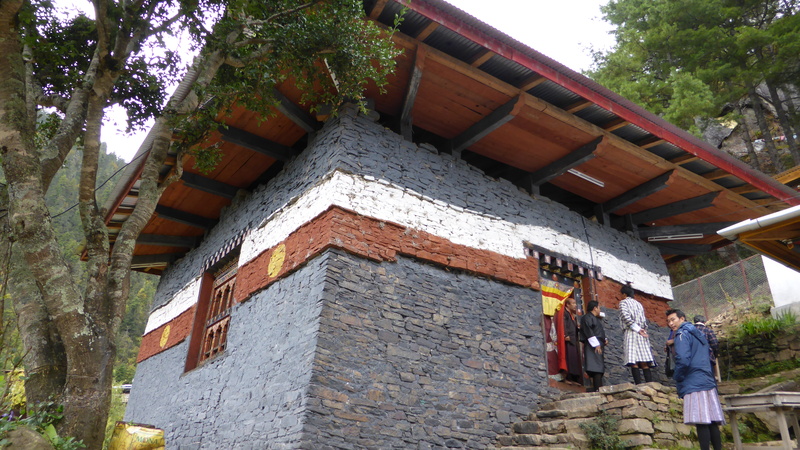 The reason for this is because there is a cave said to have been used by Guru Padmasambhava to meditate in for three years, three months, three weeks, three days and three hours, way back in the 8th Century. 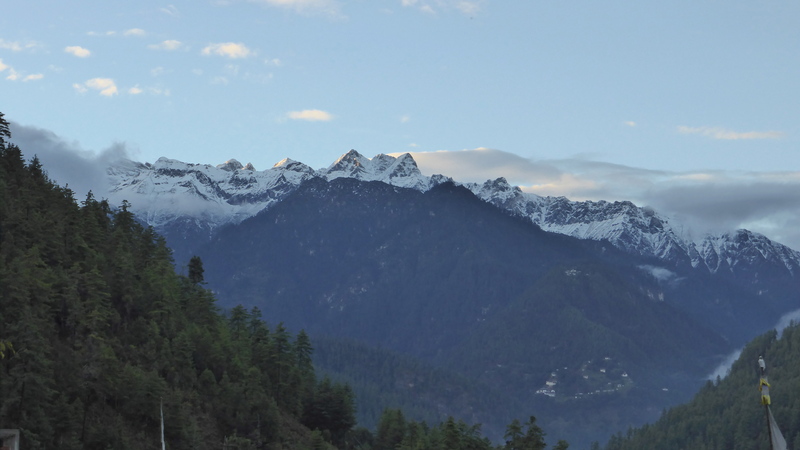 The commonly used name ‘Tiger’s Nest’ originates from the fact that it is believed that this is the site where the tiger, on whose back Padmasambhava travelled from Tibet to Bhutan, landed. 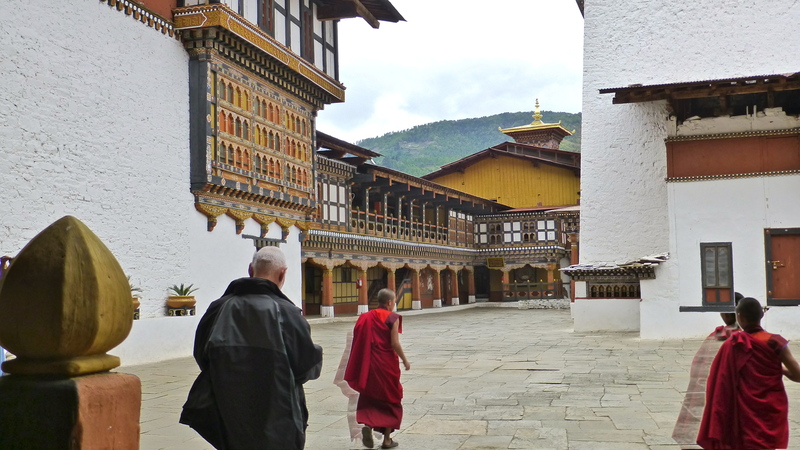 This is the place where Buddhism was introduced into Bhutan and so is highly revered. Tigers Nest viewed from the floor of the Paro Valley. The precarious position it occupies is obvious. The track that leads to the monastery from the road-head is quite wide and well formed. 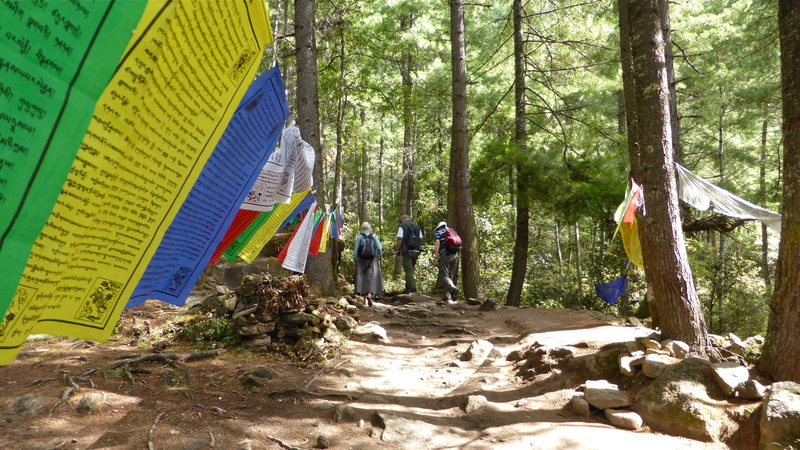 Many prayer flags are hung from the surrounding trees by pilgrims as they begin their long and strenuous climb. It’s a case of ‘watch your step’ through some of the rocky parts of the track! There are also exposed roots to trip over. 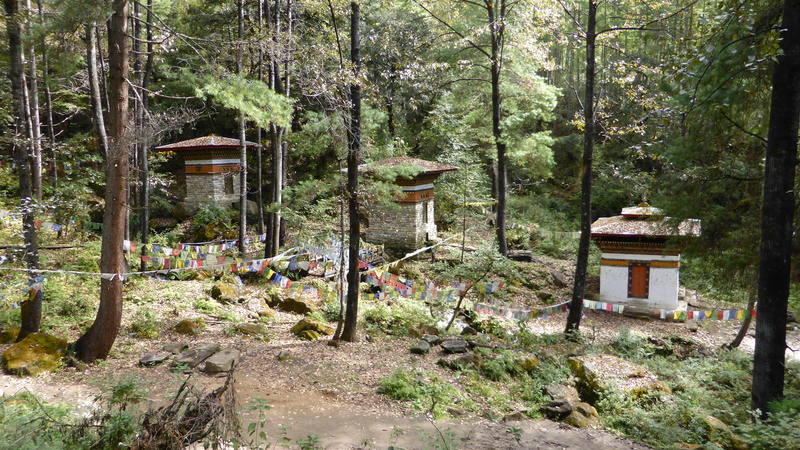 These small structures contain water-driven prayer wheels. 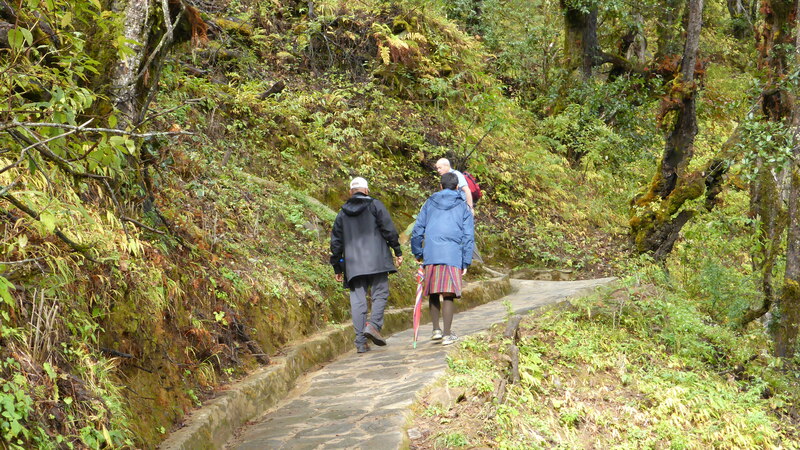 The creek that flows down this valley provides the water-power to turn the paddles attached to the prayer wheels. 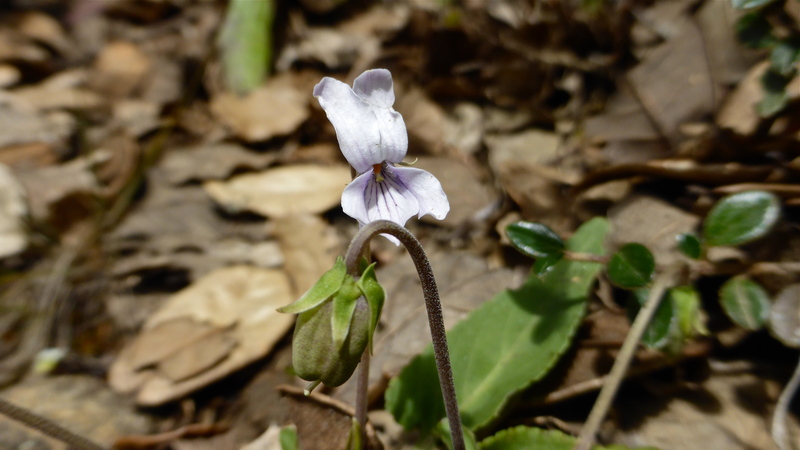 A small violet I spotted growing on the edge of the track. 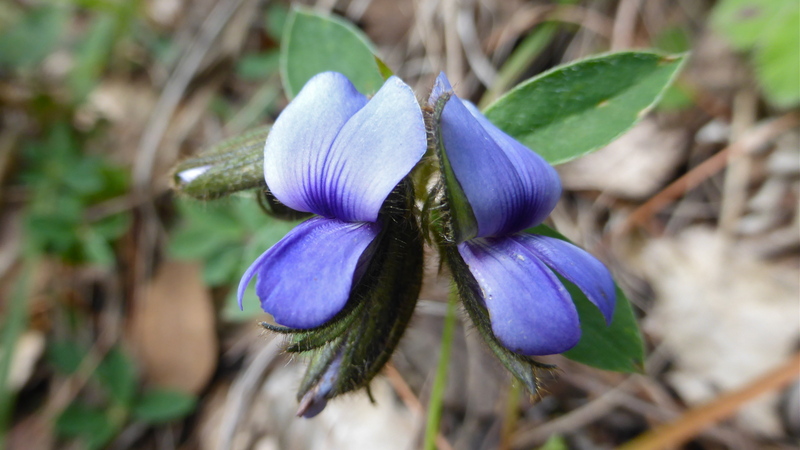 and stunning blue pea flowers. The plant hugs the ground. 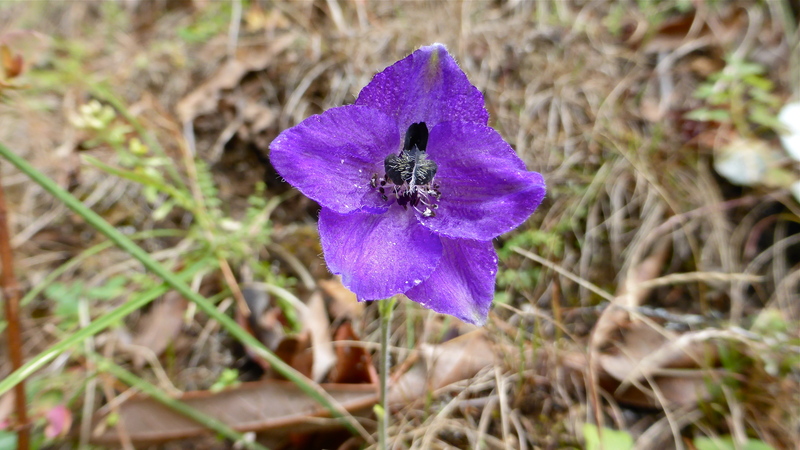 Delphinium cooperi is a spindly plant that seemed to like the disturbed soil on the banks at the side of the track. 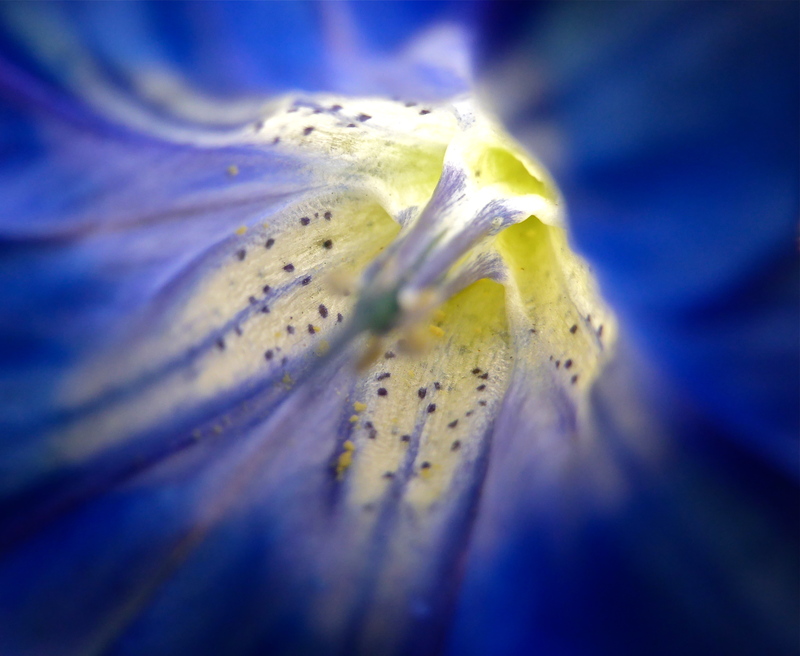 Sometimes there was just one flower on each stalk, sometimes a few more. Tiger’s Nest viewed from near the Viewpoint where there is a facility supplying food, drinks and shelter. It provides a welcome excuse to stop and rest awhile and to take in the magnificent view. 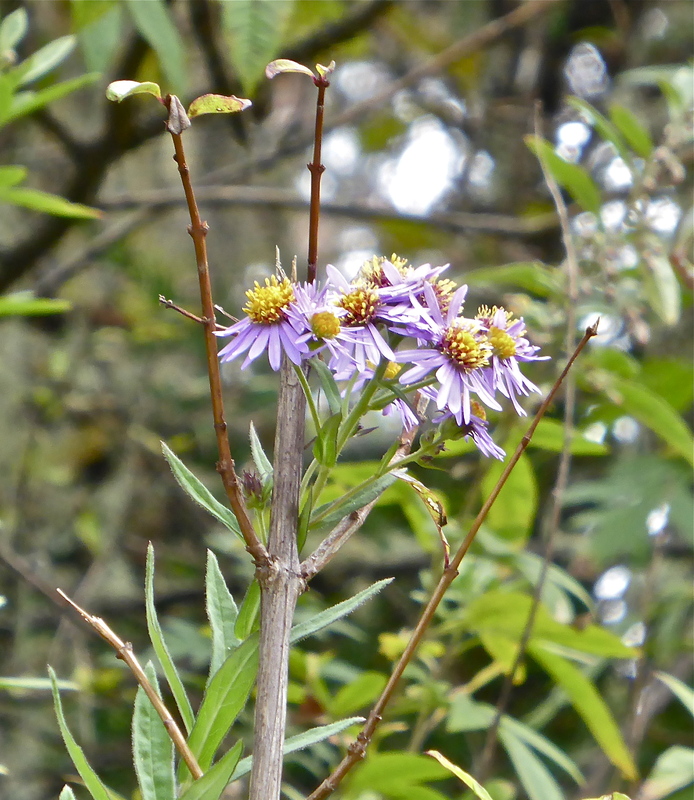 This attractive ground-hugging plant liked growing over the banks at the side of the path. 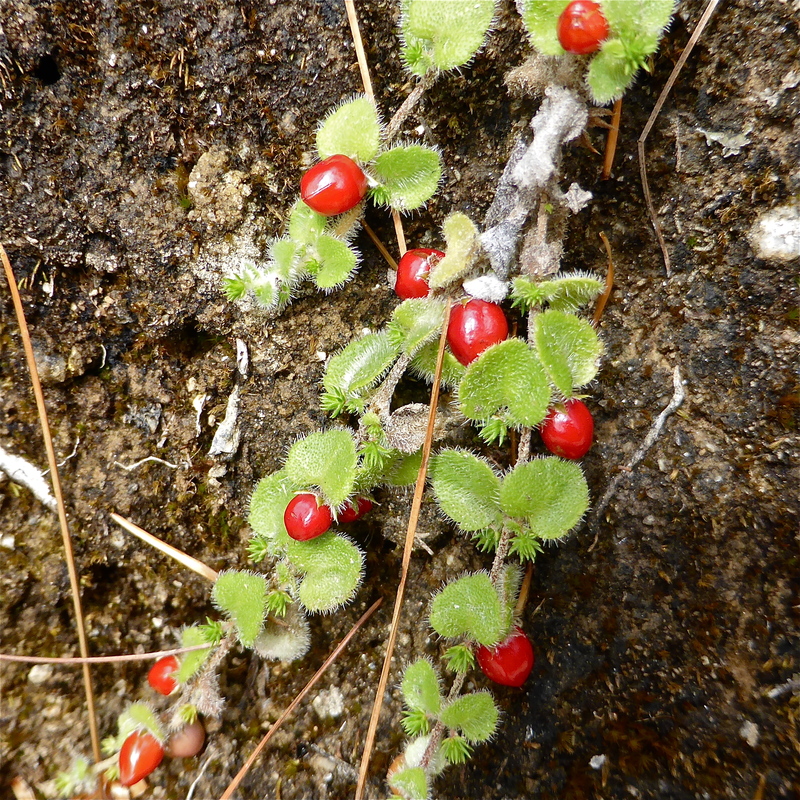 Although small in size, it was hard for the observant walker not to see the hairy leaves and bright red berries. Tiger’s Nest from the view point. There is still quite a way to go and quite a bit of going down before the final assault! 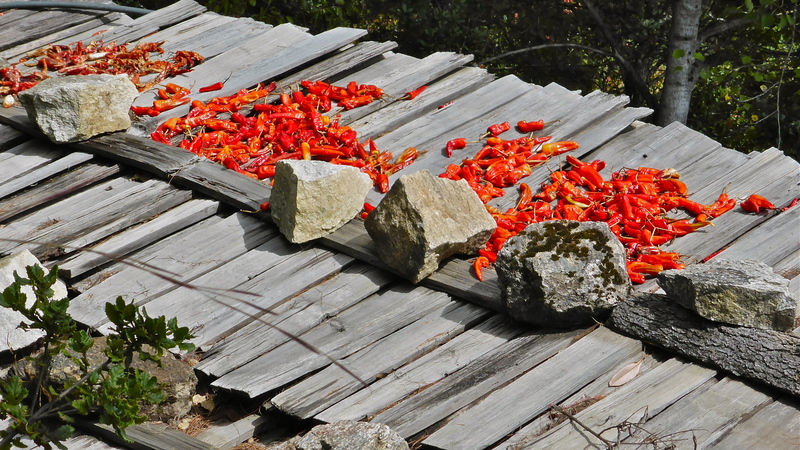 Chillies were drying on a shingle roof. Fully dried they will store well and be used to spice-up winter meals. 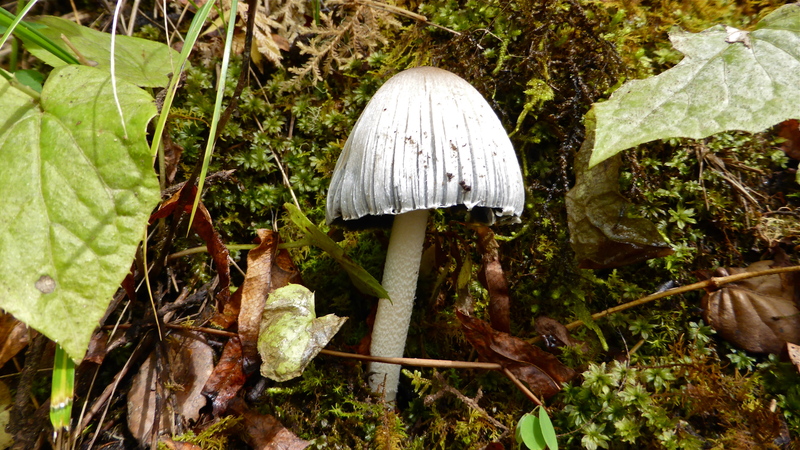 A toadstool growing in a shadier part of the track. 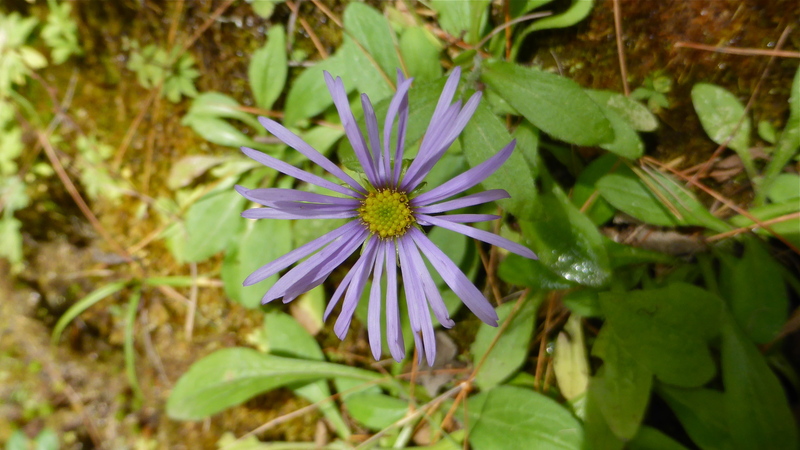 It obviously benefits from the moisture the moss and leaf litter provide. Trevor beside strings of colourful prayer flags. 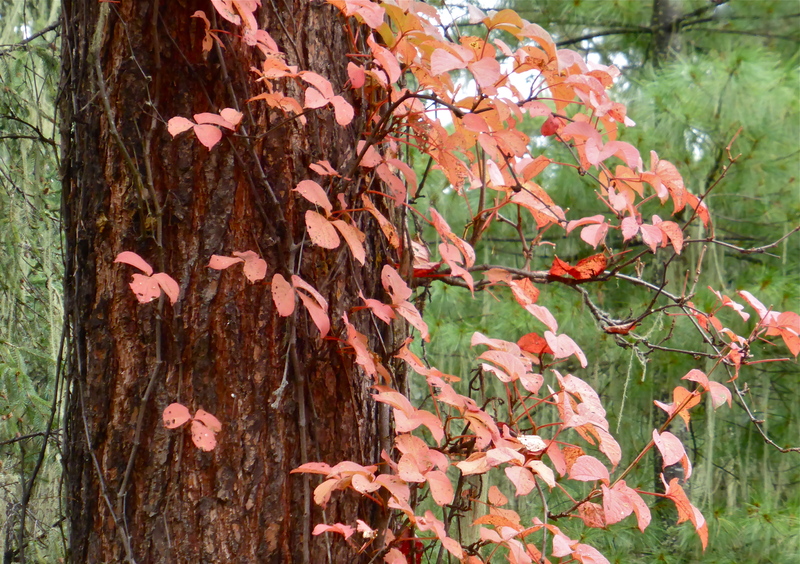 A gap in the forest allowed in a gentle breeze – the flags moved languidly. 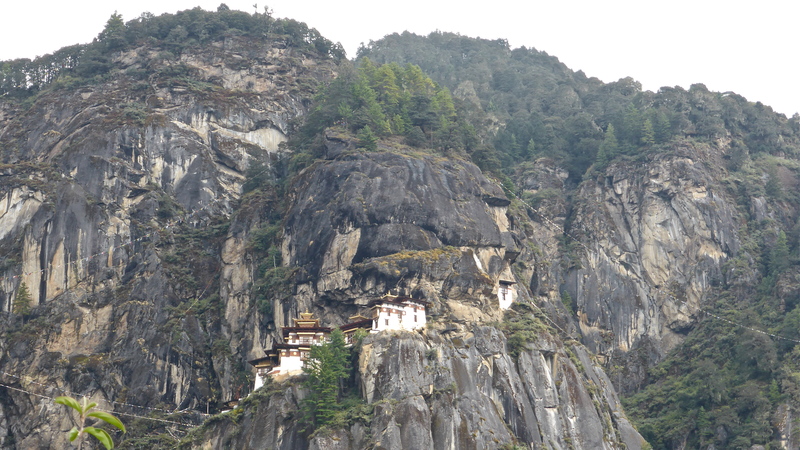 This view of Taktsang Monastery is the closest I was able to get to the monastery when I was here in 2003. Repair work to fix damage caused by a devastating fire in 1998 was not complete. It is said that a knocked over oil lamp caused the fire. From this point we noted the steep descent that we needed to take to the left to go down to a bridge which crosses a ravine. A stream tumbles the ravine to the valley floor far below. From the bridge we would have to climb back up, way up, to the precarious ledge on which the monastery sits. 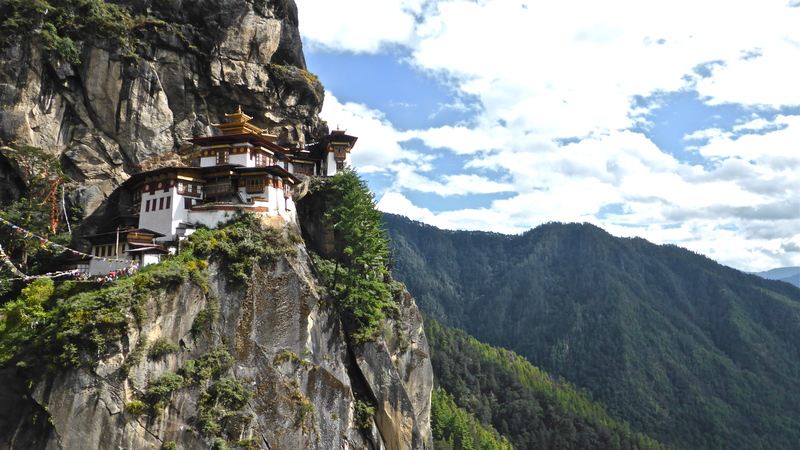 Getting closer, the Taktsang Palphug Monastery, better known as Tiger’s Nest, is an impressive sight. Visitors approach the monastery from the left. Trevor taking taking a photo of the ravine down which the watercourse tumbles. 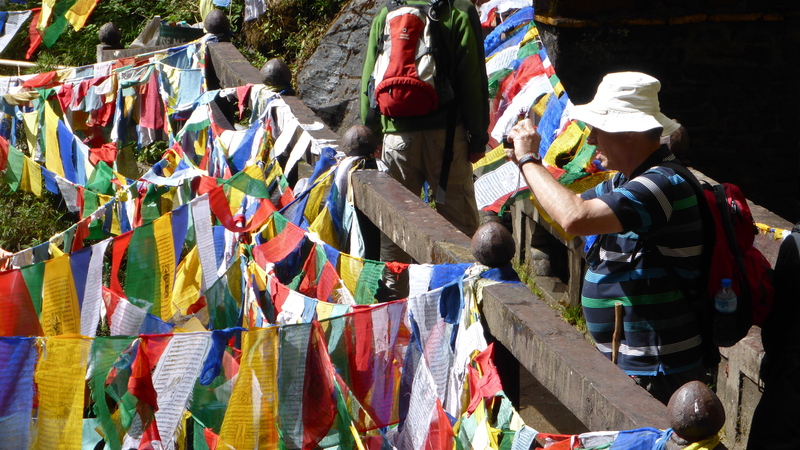 The bridge was a favourite place to tie strings of prayer flags. The bridge in the previous photo is down to the left. Having climbed down to the bridge from the viewpoint, it was an equally tough climb back up to the monastery. 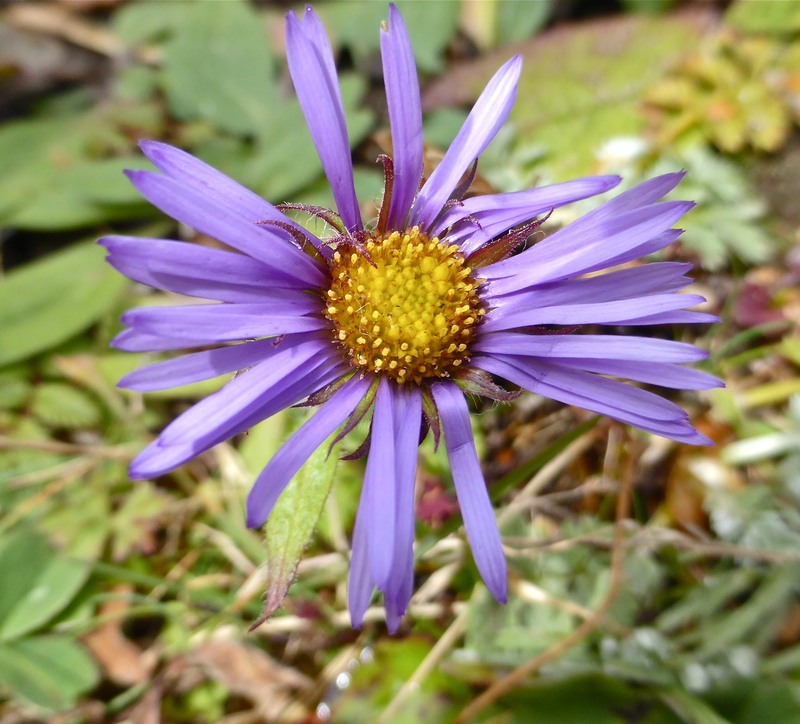 Aster alpinus is found throughout the Himalaya. 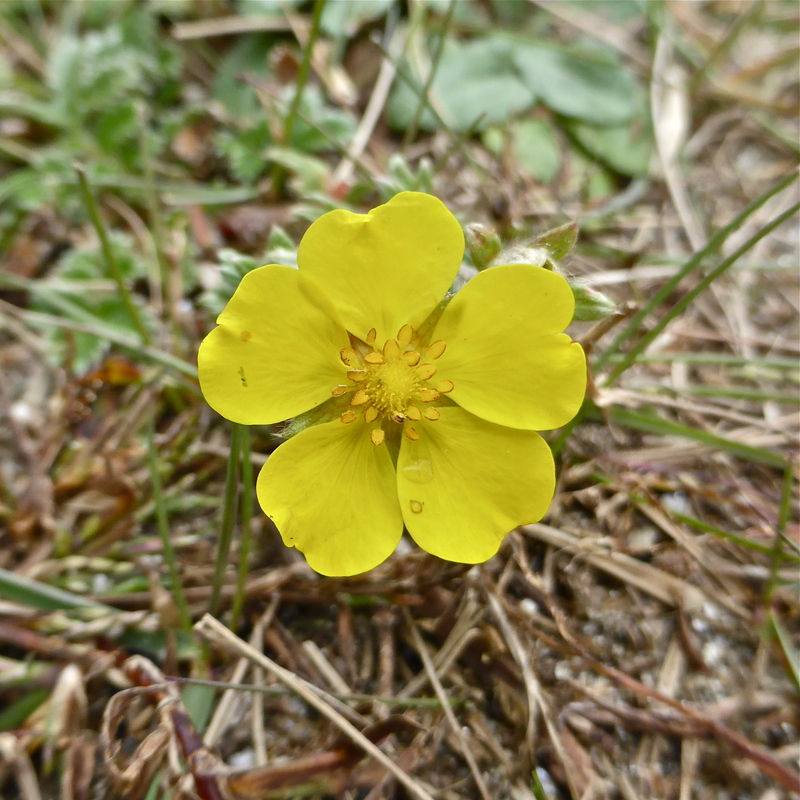 It is a small, ground-hugging plant. 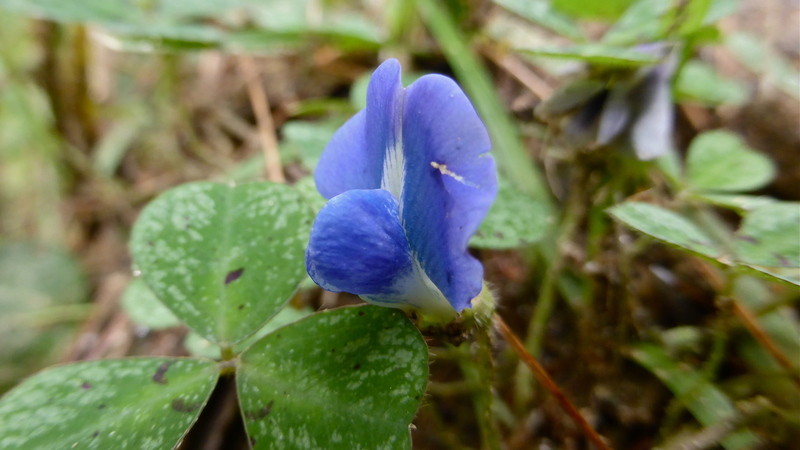 This small legume has deep blue flowers. The buds are protected by a ‘leafy’ calyx covered in masses of stiff, short, black hairs. 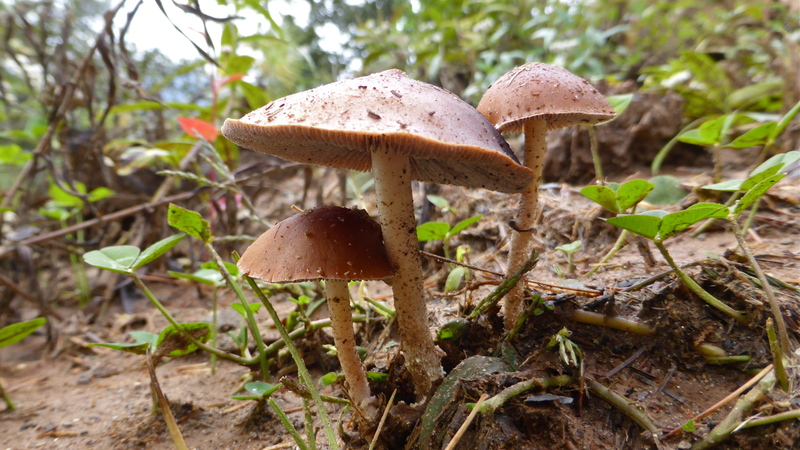 A trio of toadstools growing in disturbed soil. 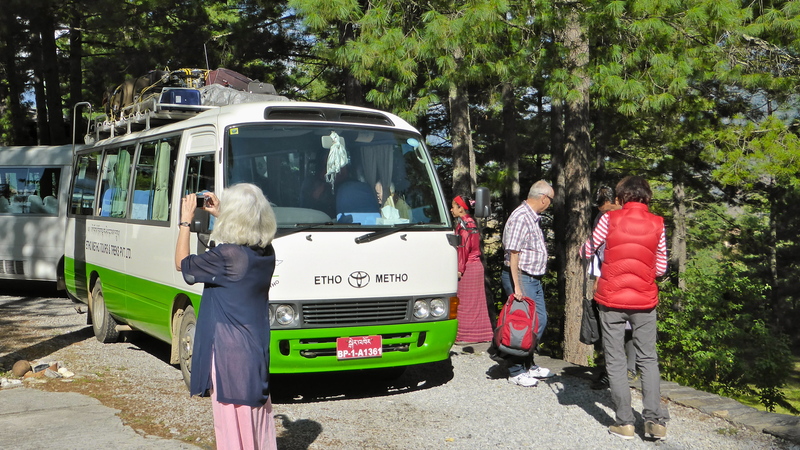 back at the car park from our hike up tyo Tiger’s Nest, our group is about to board the Etho Metho bus for the last time. We were about to leave for the Paro Airport where we wwere to board a flight to Gauhati in Assam, India. I was sad to leave Bhutan but, as my friend the Hon. 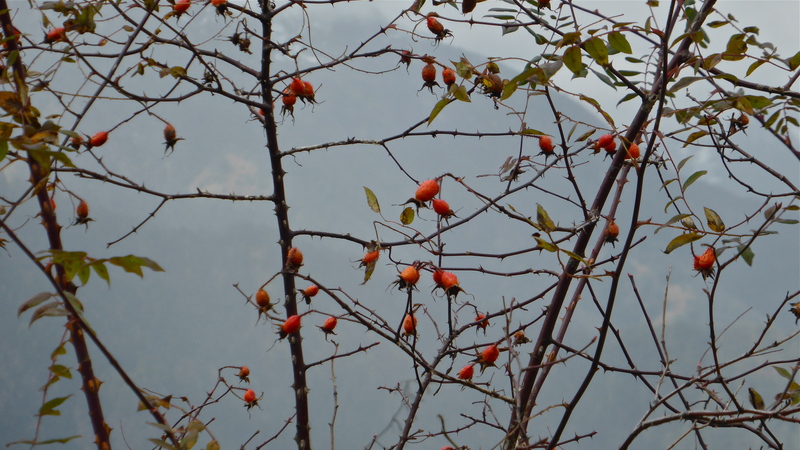 Sonam Dorji said to me on our walk back down from the Tango Moanstery – you will come back! Sad to leave but this next plane flight also heralded the next part of our adventure on the sub-Continent and our cruise down the Brahmaputra River. It was time to farewell our trusty and much respected local guide in Bhutan, Leki. 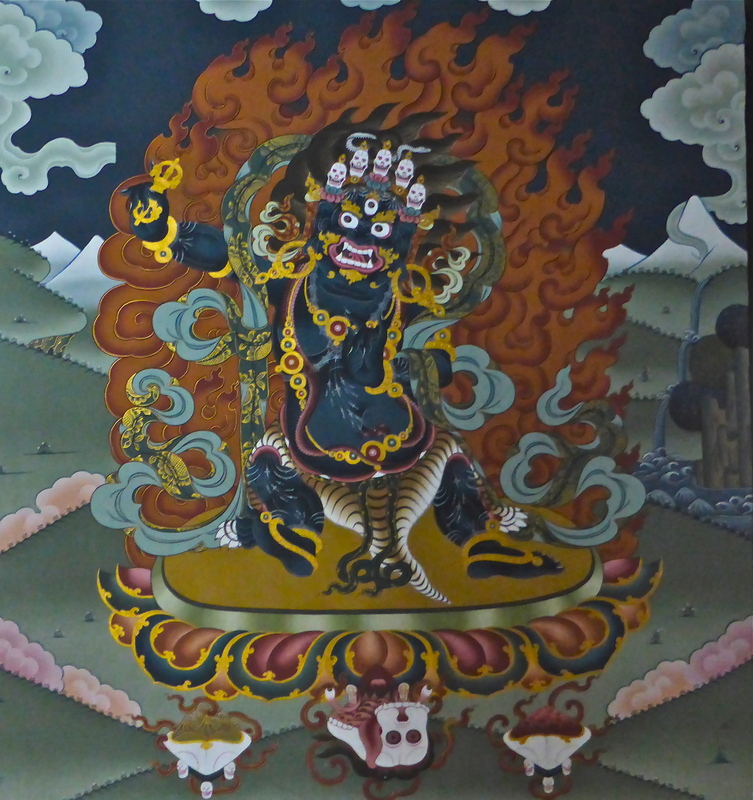 He is accompanied by his assistant, Dechen. Drukair, was until October 2013, the only airline to fly into the country. A private airline started services to Bhutan the week before we arrived. Paro Airport is at an elevation of 2225m. (7300ft.). Pilots have to fly into the valley over 4877m. (16,000ft.) high mountains. All landings are entirely by visual flight rules. Landing at Paro is quite an experience as mountains seemingly wizz past the wingtips! Drukair fly Airbus 319 and ATR 42-500 aircraft. Obviously, these aircraft have been chosen for their ability to climb and descend quickly and to take-off and land on short runways. we passed through some lovely forests. 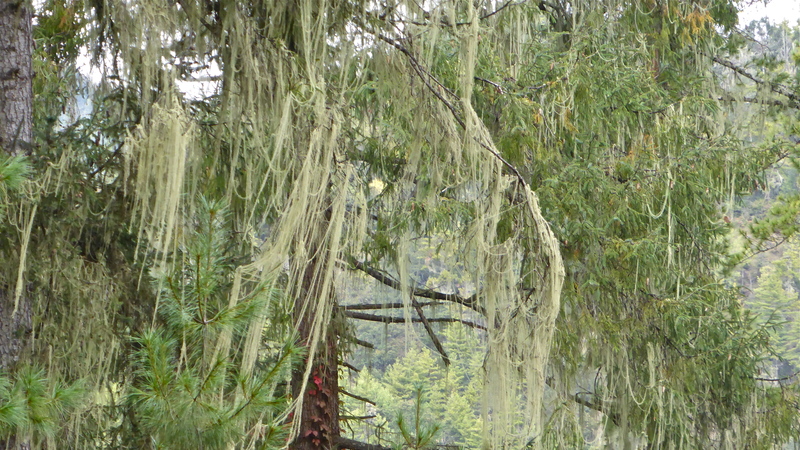 Here, long strands of lichen blow gently in the breeze. The season was already beginning to change. 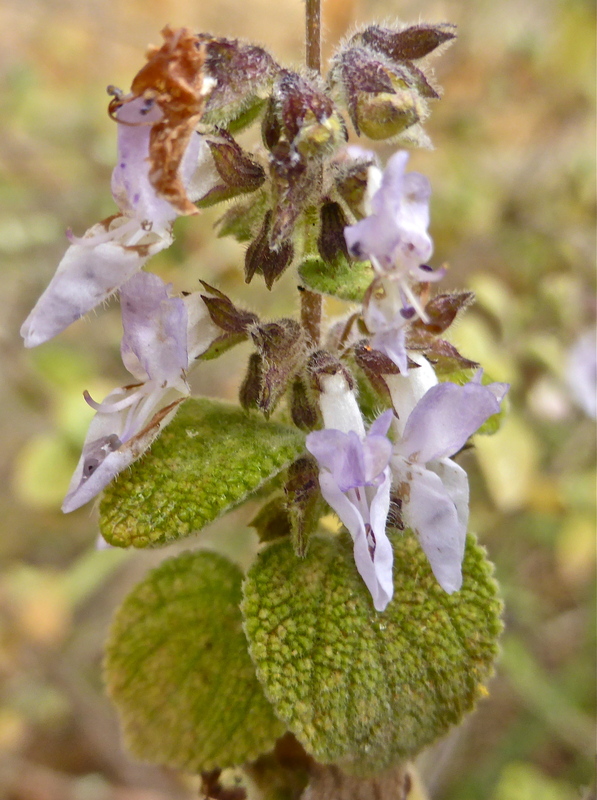 I should be able to name most of the following plants as I bought a wonderful book in Thimphu which contained hundreds of pictures and descriptions of Bhutanese plants. 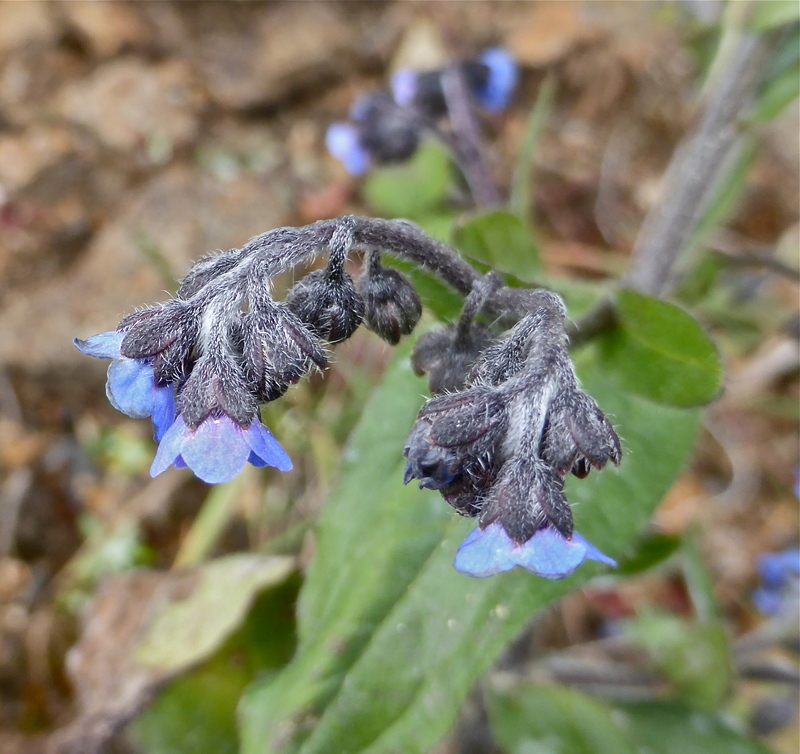 However, I left it behind in Paro, so, you and I, will just have to appreciate the pictures, mostly without names. 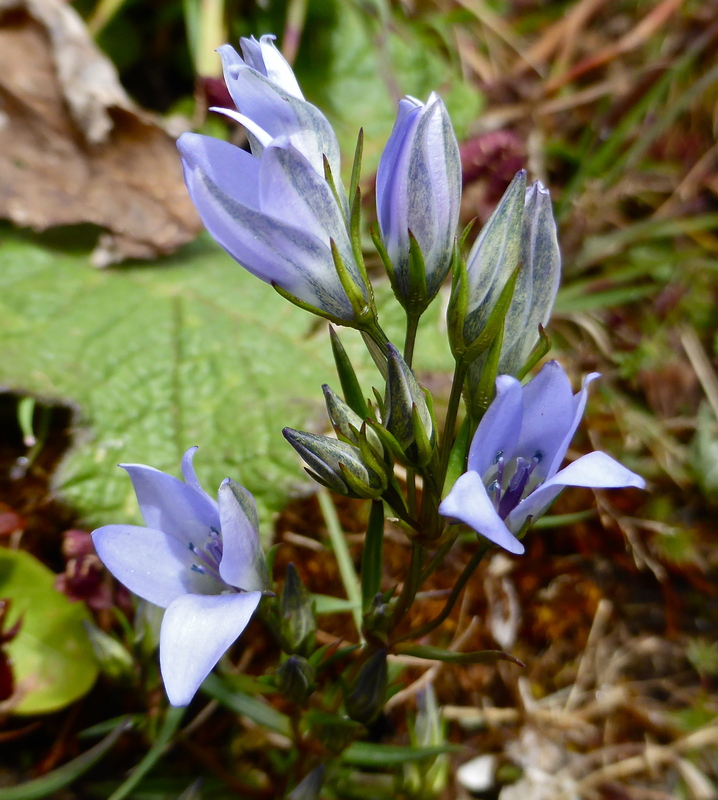 A member of the Gentian family. 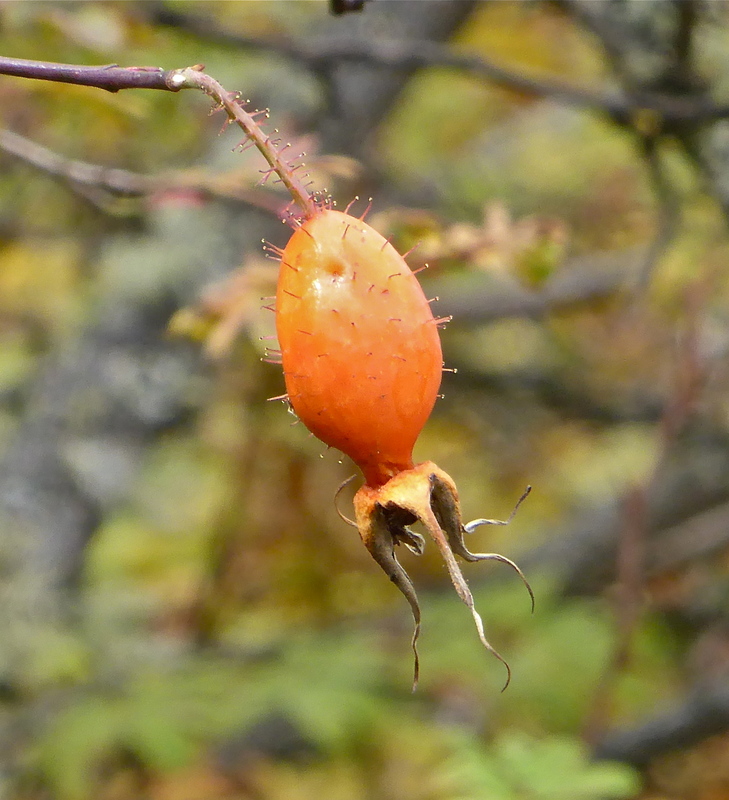 Rose hips maturing on a tall growing plant. These hips are a rich source of vitamin C.
It had been fun looking for wildflowers in these hills. 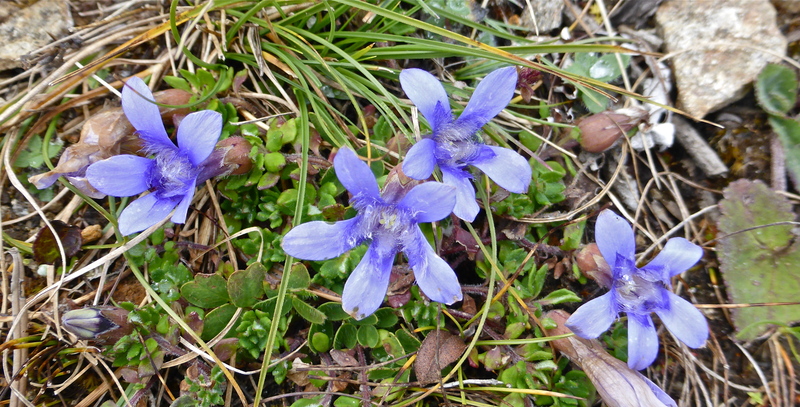 1 Comment Posted in Bhutan, For Armchair Travellers, Travel, Wildflowers Tagged Bhutan, Edelweiss, Gentiana sp., Gentianella sp., Haa Valley, Leontopodium sp., Leontopodium sp. 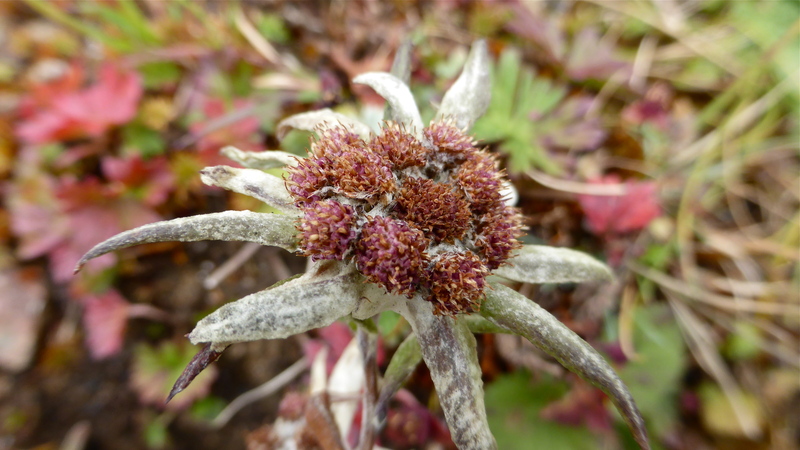 Edelweiss., rose hips, Scutellaria sp. 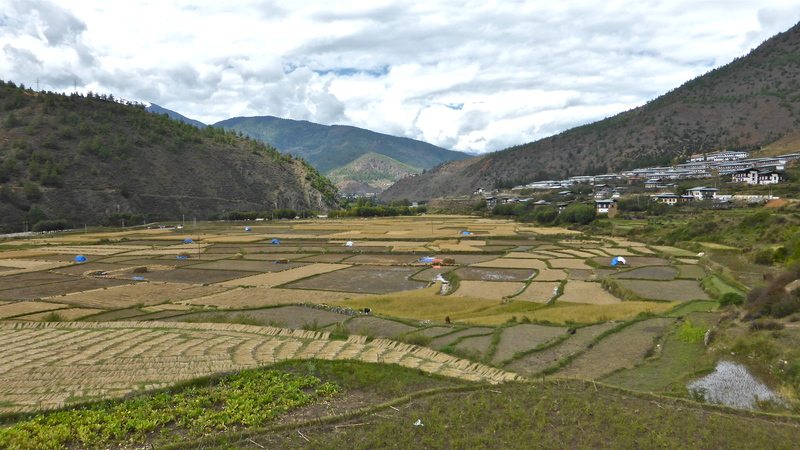 Here, in the upper reaches of the Paro Valley, the rice paddies climb further up the adjoining slopes. A lot of water can be seen in some paddies as these have yet to drain after heavy rain associated with cyclone Phailin. Terraced rice paddies are easy to flood but being so level, are slow to drain. 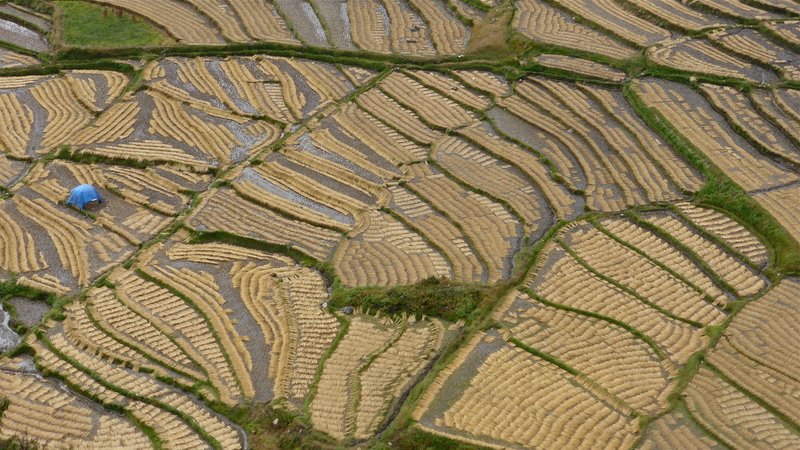 Beautiful patterns are created as the harvested rice is laid out in lines. Some attempt has been made to cover some of the crop with blue tarpaulins. 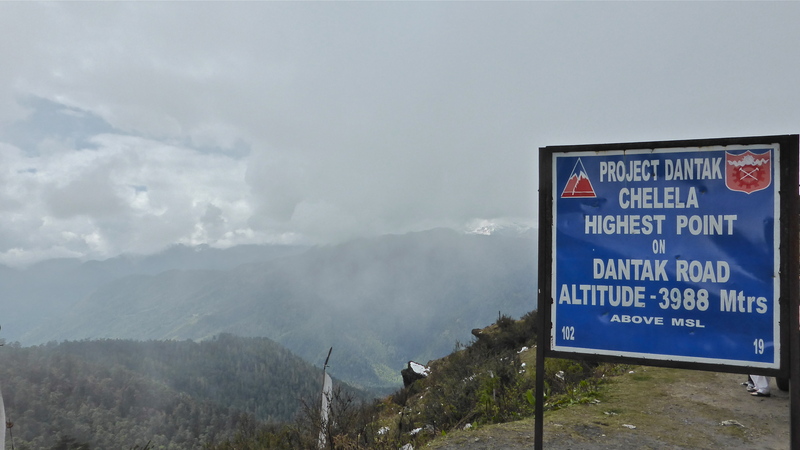 The highest point, 3988m (13,084ft), on the Paro-Dantak road. 108 is an auspicious number for Bhutanese Buddhists. 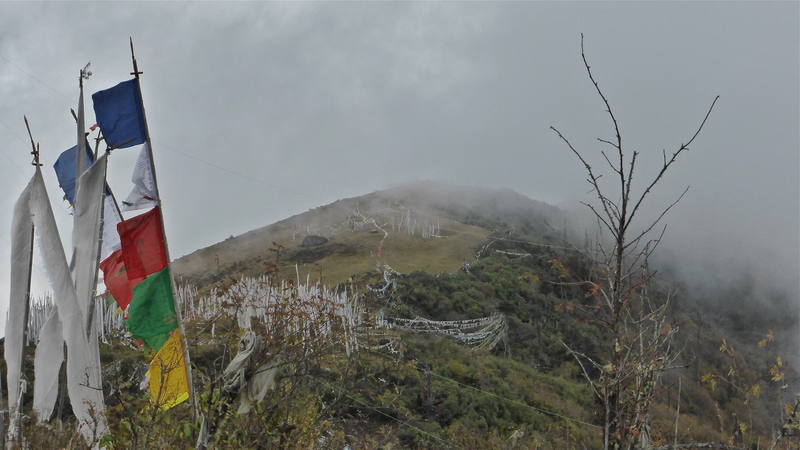 For those who can afford the expense, 108 prayer flags are erected on a high pass to commemorate the death of a family member. 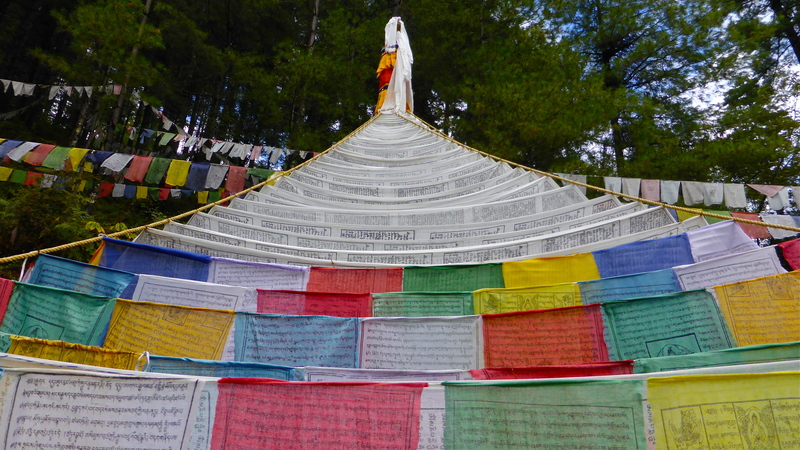 Prayer flags have mantras printed on them and come in a vertical format (above) or square. These vertical flags are called darchor. 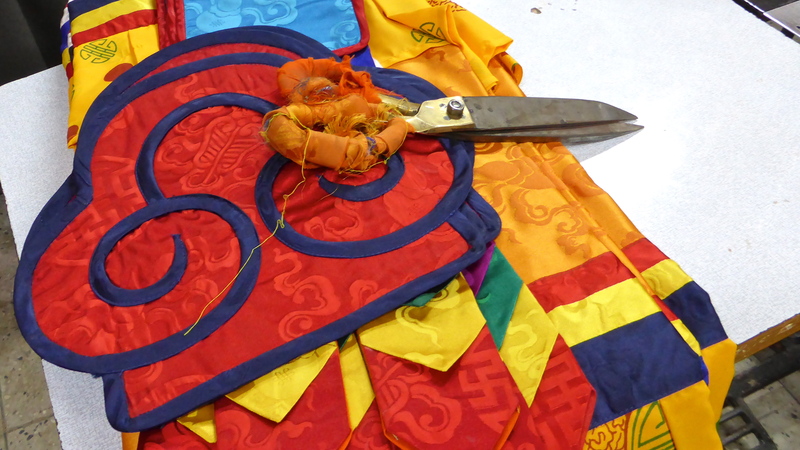 The square flags, which usually come in a string of five colours, are called lung ta. A wooden block is used to print the prayers. The view back down into the Paro Valley. 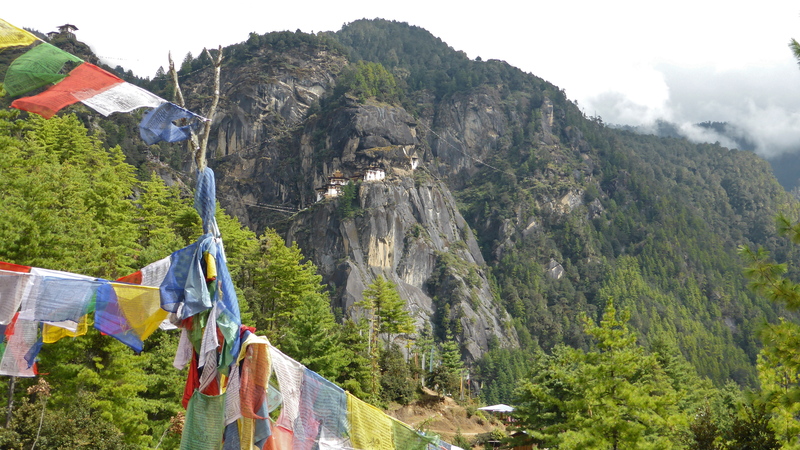 In general, high passes are favoured places to erect prayer flags. Traditionally, prayer flags are used to promote peace, compassion, strength and wisdom. It is believed that the mantras will be blown by the wind to spread good will and compassion into all pervading space, bringing benefit to all. It is further believed that these thoughts become a permanent part of the universe and as the images and words fade from exposure to the elements, this represents the cycle of life – the old being replaced by the new. Therefore new flags will be erected alongside old ones. These flags must always be treated with respect and never placed on the ground. Old flags should be burned. It is believed by some that if the flags are hung on what is deemed to be an inauspicious day, they may bring bad results for as long as they are flying. A sunny, windy morning is the best time to put up new flags. 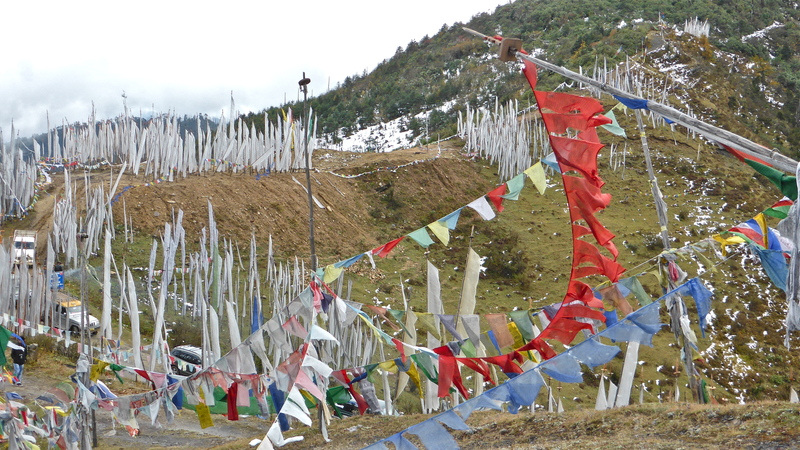 The Chele La (pass) was covered with flags of five different colours. The colours are arranged in a specific order from left to right. 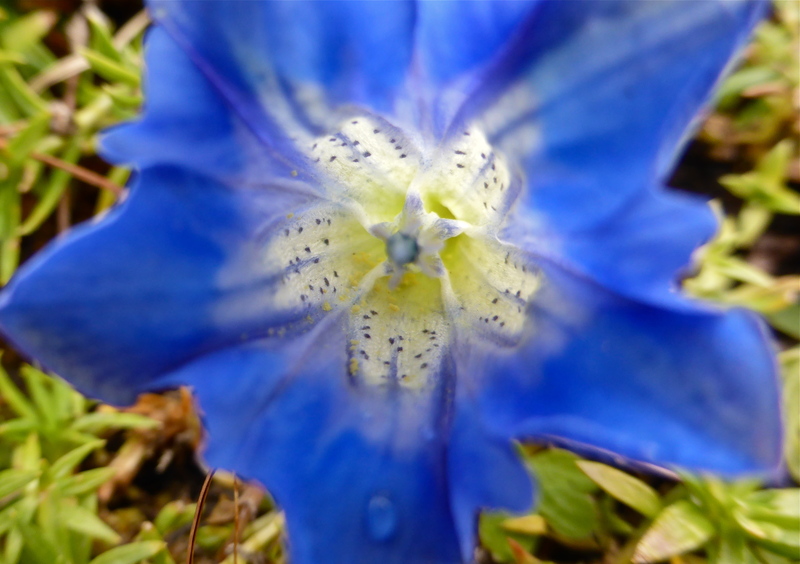 Blue symbolises the sky and space, white – air and wind, red – fire, green – water, and yellow – earth. A popular Buddhist tradition is to enshrine portion of a person’s ashes in a small reliquary known as a tsa-tsa. 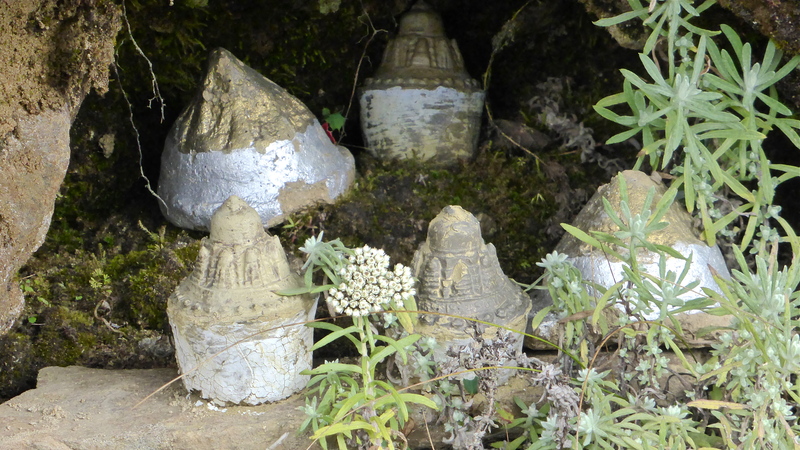 The ashes are combined with some clay, dried, sometimes painted, and left at a place of power such as near a river, stupa or in a cave. 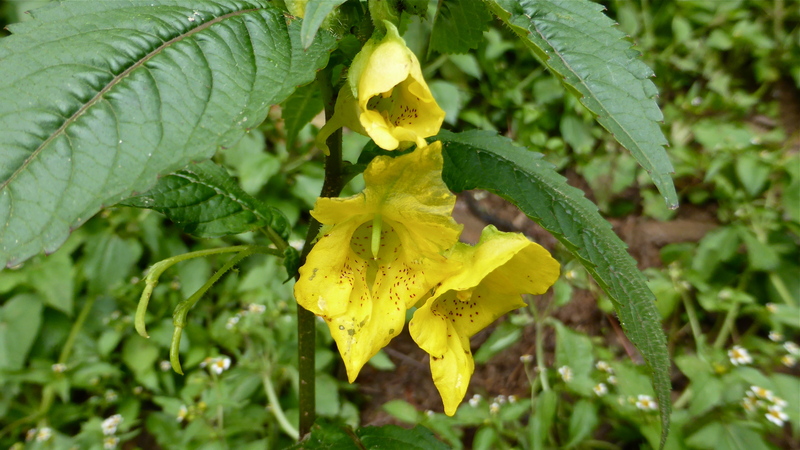 The Haa Valley is a steep-sided narrow valley in the far west of Bhutan. Wheat and barley are the main crops grown in the valley however some rice is grown in the lower parts. Apples, potatoes and chillis are cash crops grown on the terraced lower hillsides. Census statistics indicate that every household owns some animals, mostly yaks, cattle, and some chickens, pigs and horses. The flat area to the centre left contains a helipad and was the place we stopped to have our packed lunch. The valley was only opened to foreign tourism in 2002. Facilities are still scant. Traditional farmhouses dot the valley. The Haa Dzong is a military installation. 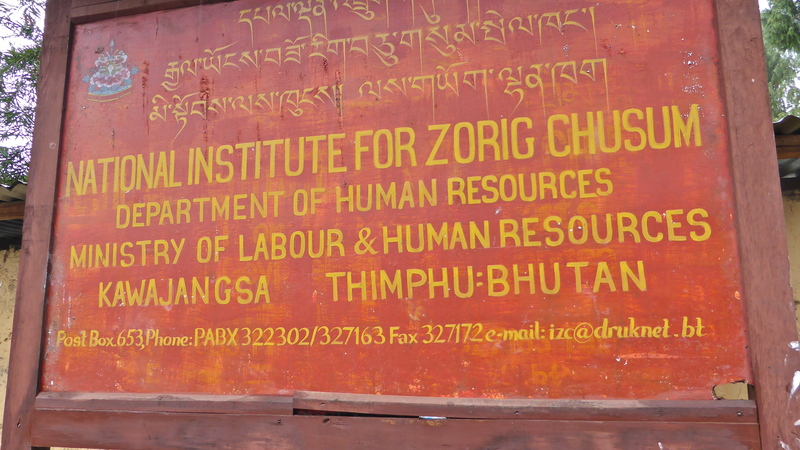 We were told that there is some agitation to have the army vacate the dzong and return it to the people. The base is maintained in the valley to guard against incursions from China. 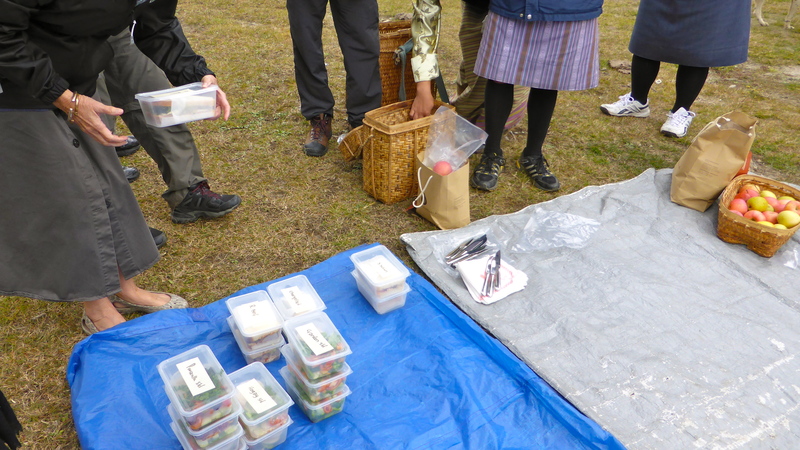 Our boxed lunches were laid out on tarpaulins on the ground. Each box was labelled with its contents. 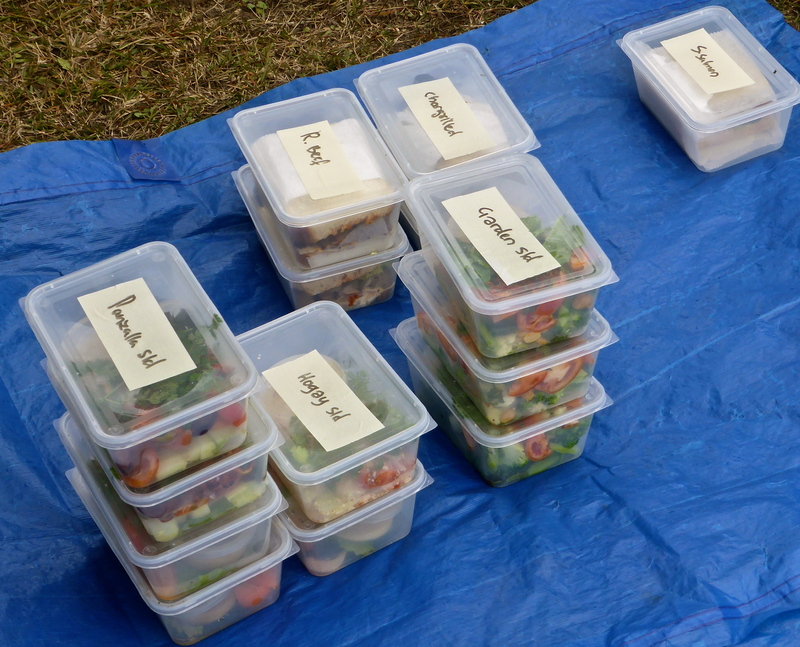 Salmon, chargrilled vegetables (my yummy choice), roast beef, garden salad, hogay salad etc. There were boiled eggs, pieces of fruit cake and fruit as well. Forestry is very important to the local economy with 78% of the district being covered in forest. A substantial part of the NE half of the Haa District is defined as the Torsa Strict Native Reserve. There is no human habitation in this reserve. These happy school kids are wearing a school uniform that is not traditional. 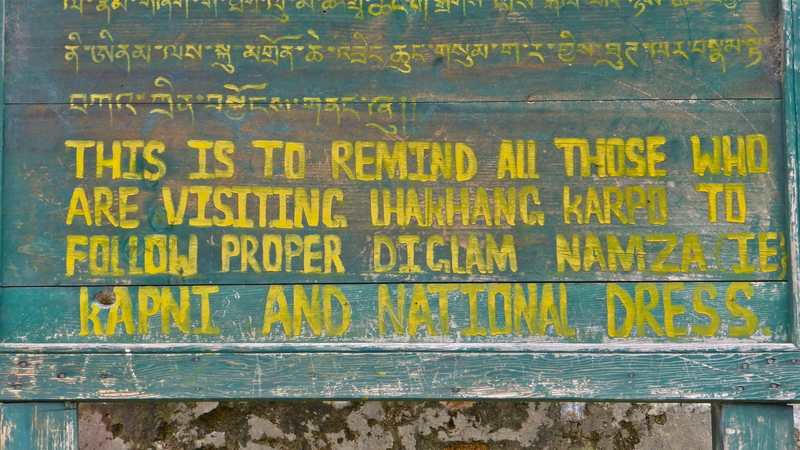 This interesting sign refers to the proper dress that must be worn when a Bhutanese visits a Dzong or other administrative centres. A “kapni”, usually spelt “kabney”, is a long scarf that is hung over the left shoulder and loosely tied on the right side at about knee level. The colour of the Kabney varies with rank. Yellow is reserved for the King and Head Abbot, orange is worn by Ministers, green by Judges, red with a narrow white stripe is worn by a District Administrator. Commoners wear white kabneys. Women wear a similar scarf, called a rachu, although colour has no significance. These are usually woven out of raw silk and richly embroidered. 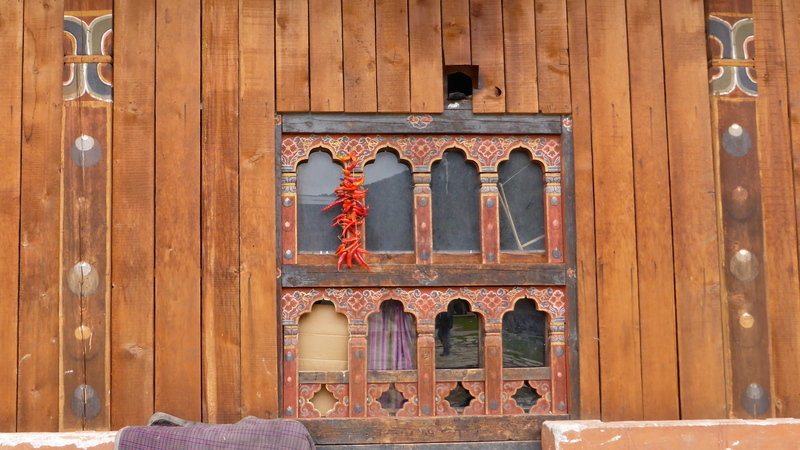 A string of chillies drying on an ornately decorated window in the Haa Valley. A traditional, ornate wooden window under construction. Local soft-wood is invariably used. The heavy construction matches the solid building techniques used to construct the rest of the building. 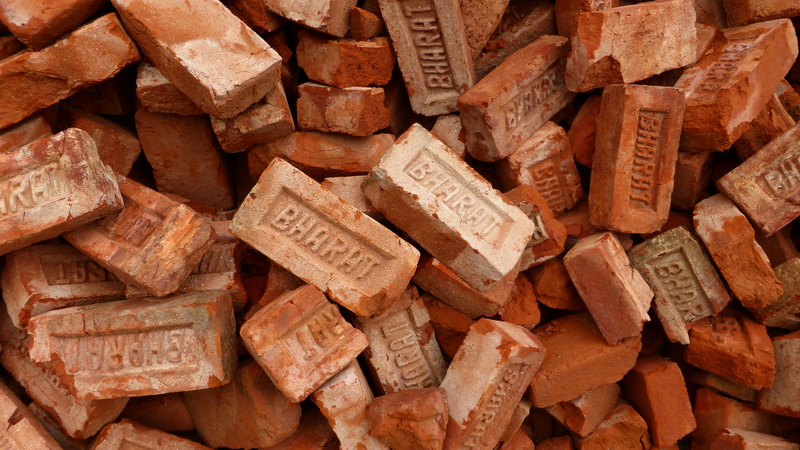 These bricks have come from India,”Bharat” being an Indian brick manufacturer. 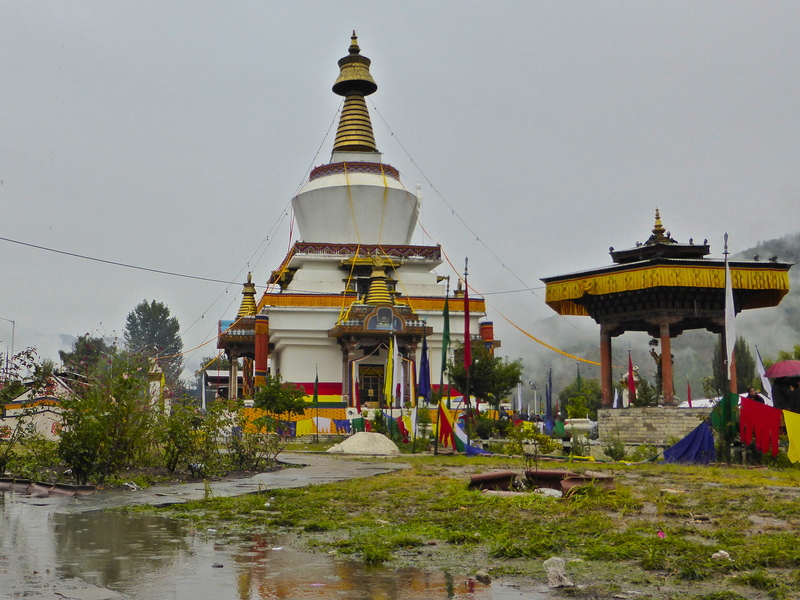 The Haa Valley is home to two important temples. The Black Temple and the White Temple were built at the same time in the 7th Century. 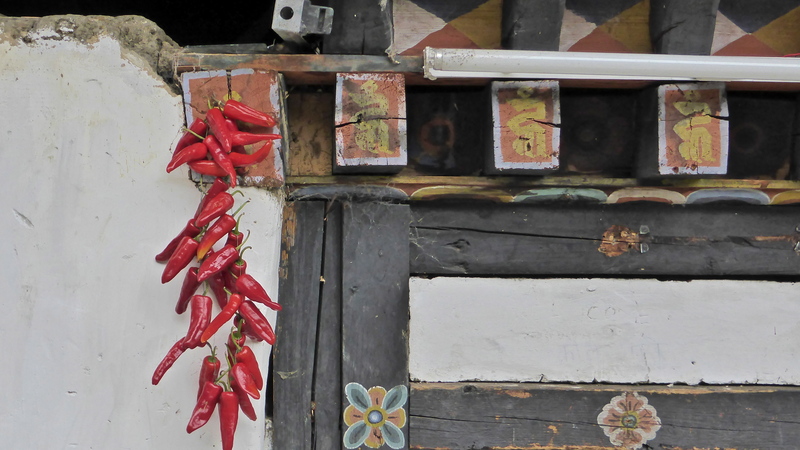 A string of freshly hung chillies being dried for later use in the winter. The White temple being renovated and restored. 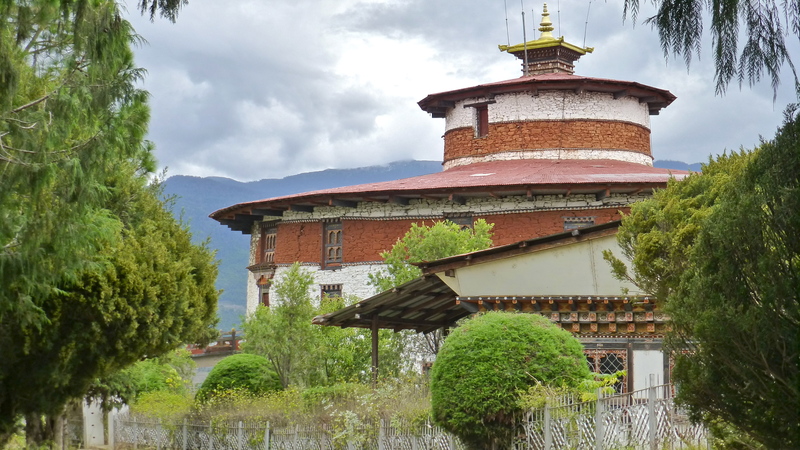 Rinpung Dzong is a fortress-monastery. The first monastery built on the site was constructed at the beginning of the 10th Century. The present monastery was built in 1644 using the old foundations, and stones instead of clay. The five story building was successful in repelling numerous invasions by Tibetans from the north. 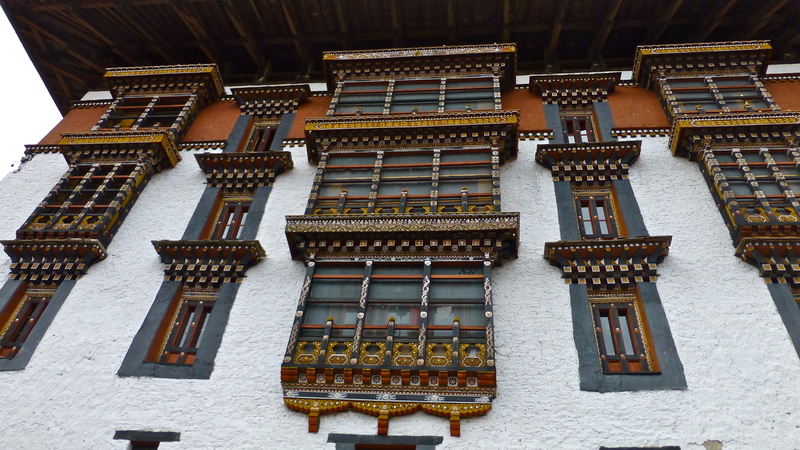 When built in 1644 it became the Rinpung Dzong which translates to “heaps of jewels”. 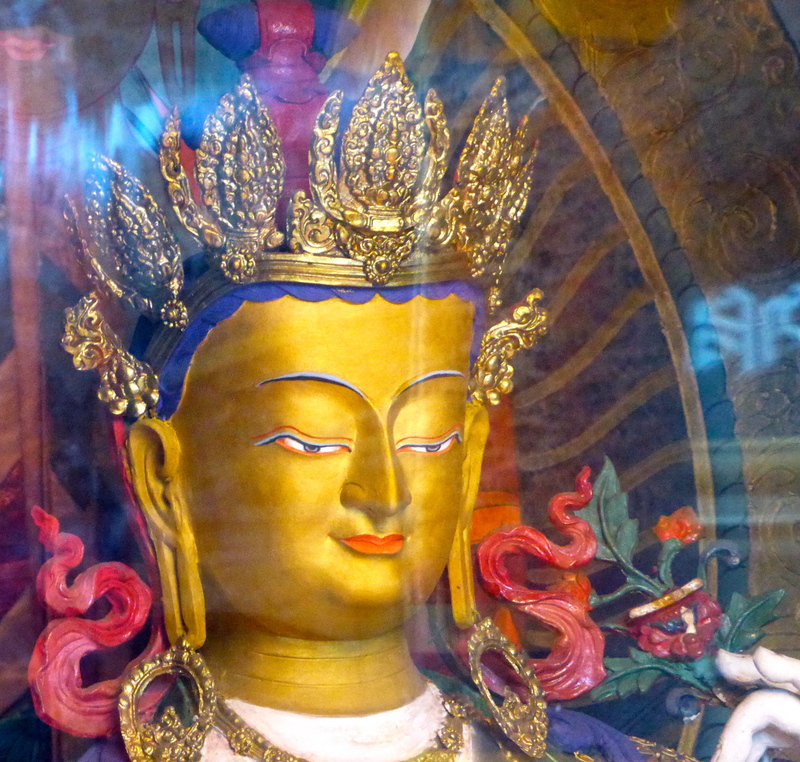 It was destroyed by fire in 1907 along with its many treasures, except one thangka, known as “Thongdel”. 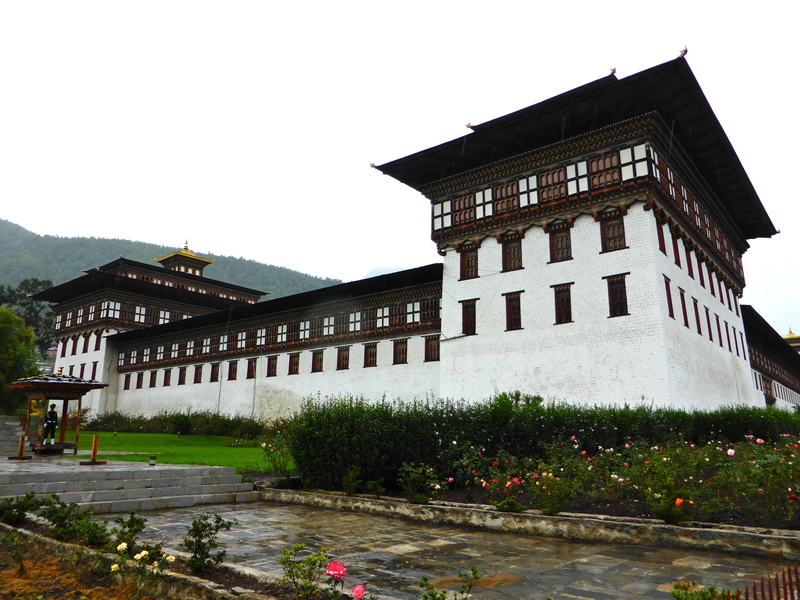 The Dzong was rebuilt after the fire and stands as we see it today. 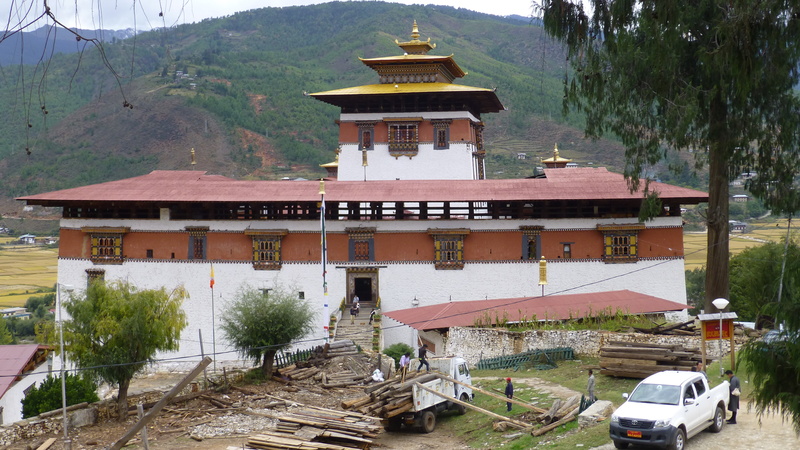 There was some construction work going on near the Dzong. In the centre foreground can be seen a truck with a couple of tree trunks propped against its side. These made the loading of heavy pieces of timber relatively easy. Two people on the truck (one was a lady) looped lengths of rope around each end the logs and pulled for all they were worth to get them from the ground to the tray of the truck. Who needs a forklift? 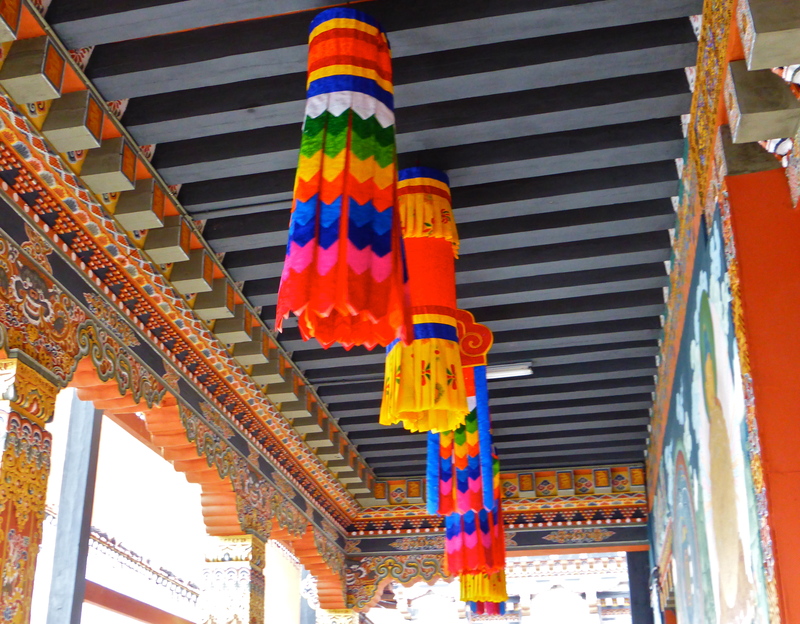 Whether large or small, roofs associated with temples are always colourfully decorated. 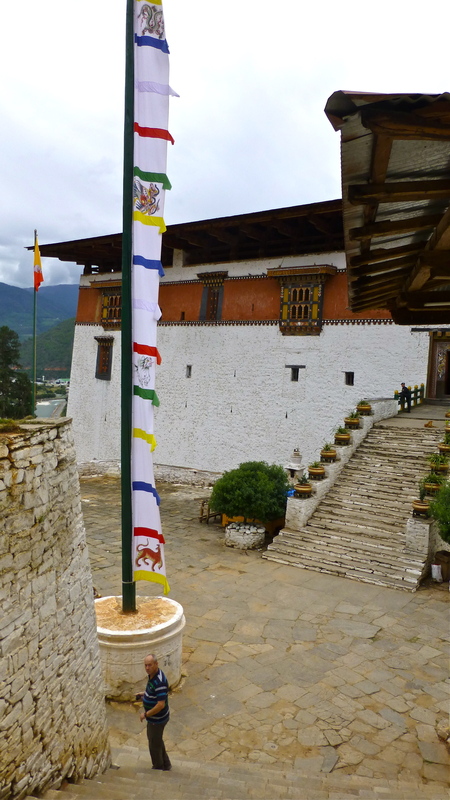 A tall flag pole stands near the entrance to Rinpung Dzong. 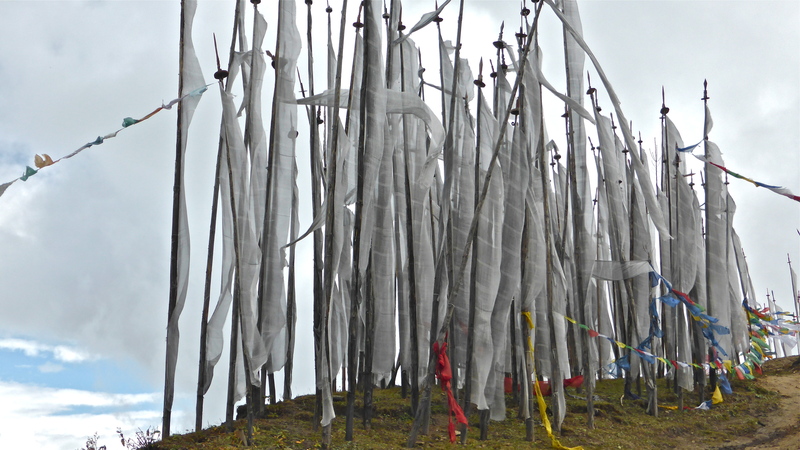 A darchor, or vertical prayer flag, flutters in the light breeze. These young monks were obviously on a break from their studies. Much animated conversation was taking place. The Buddhism in Bhutan originated in Tibet but varies from it significantly in its rituals, liturgy and monastic organisation. This form of Buddhism is called Vijrayana Buddhism and is the state religion of Bhutan. 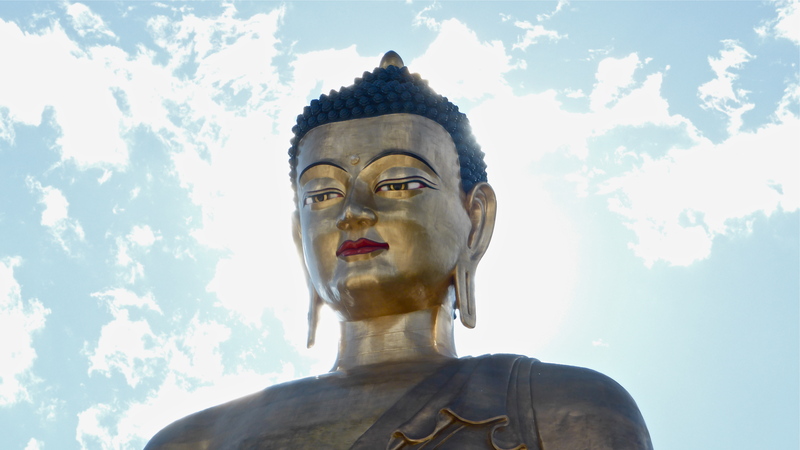 Two-thirds to three-quarters of the population are Buddhist. 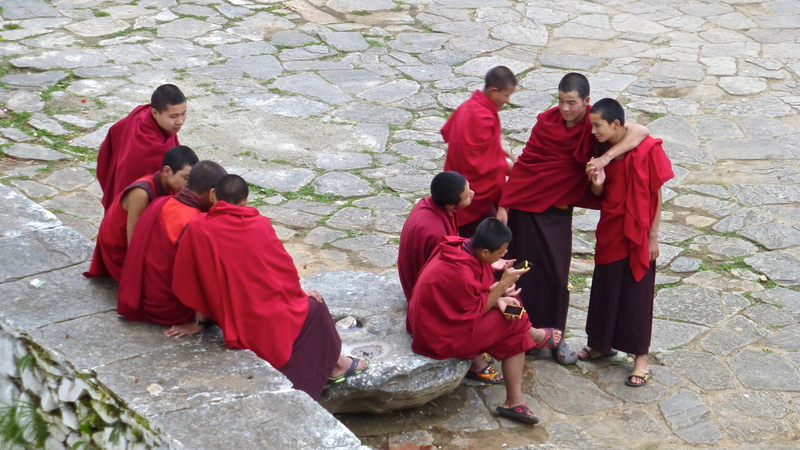 These monks were very interested in their mobile/cell phones. For a minute or two, their studies are forgotten! All the murals have a story behind them. This is the way the complexities of Buddhism is taught. Large central courtyards are a feature of Dzongs. Many have balconies overlooking the courtyards. Many thousands of people crowd into these areas during festivals and on other important occasions. 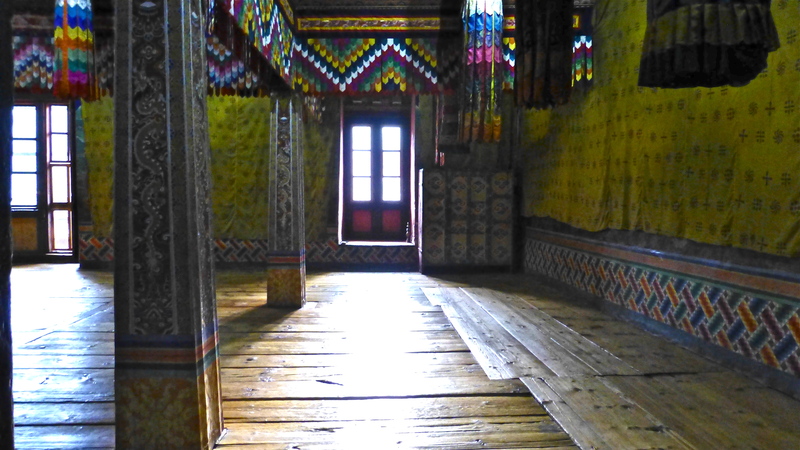 Exposed wooden features are painted in traditional patterns and colours. Although the colours used are generally not bright they shine against the grey of the courtyard flagstones and other features. 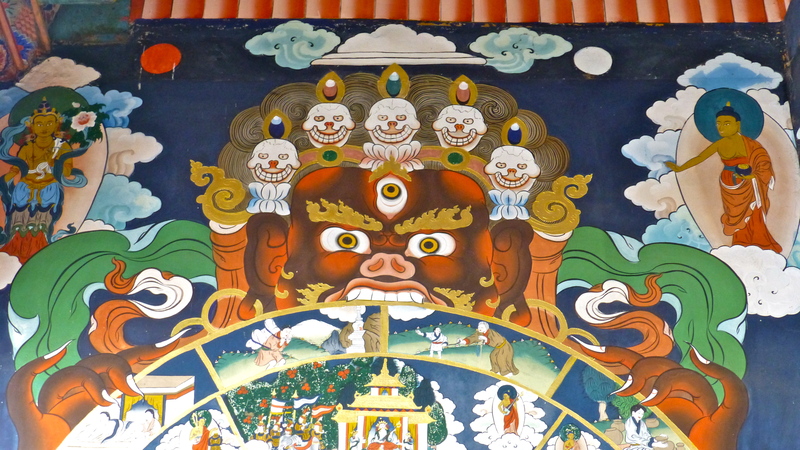 are all individually painted with signs and symbols of Bhutanese Buddhism. Window frames are treated in the same manner. Again, the charcoal grey used around the windows and for the frames of the windows themselves, goes towards highlighting the other colours. 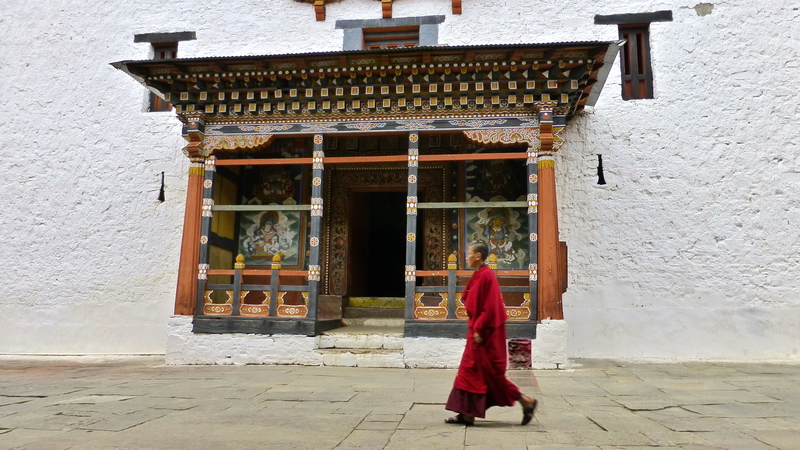 This monk walks stealthily past a decorated doorway. The walls on either side of the doorway have been used to depict another aspect of Buddhist teachings. Our guides, Leki and Dechen talk to a monk while they wait for us all to satisfy our need to take just-one-more-photo. There always seemed to be just-one-more-photo to take! And, in an environment like this, you would find them too! 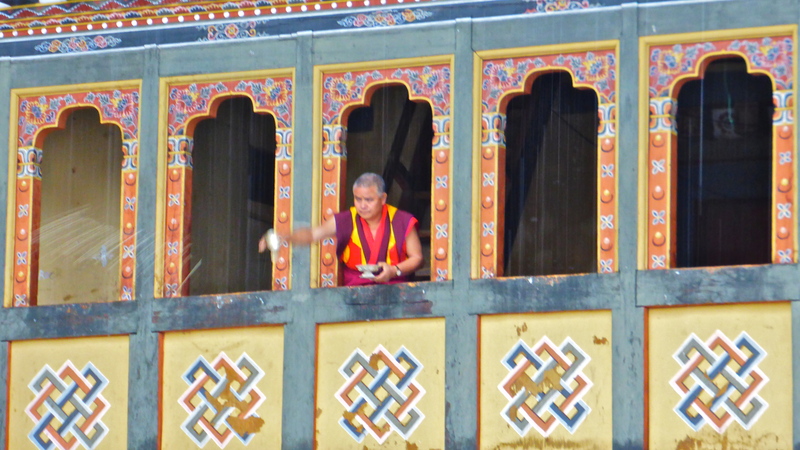 Decorated prayer wheels are recessed into the walls of the Dzong. 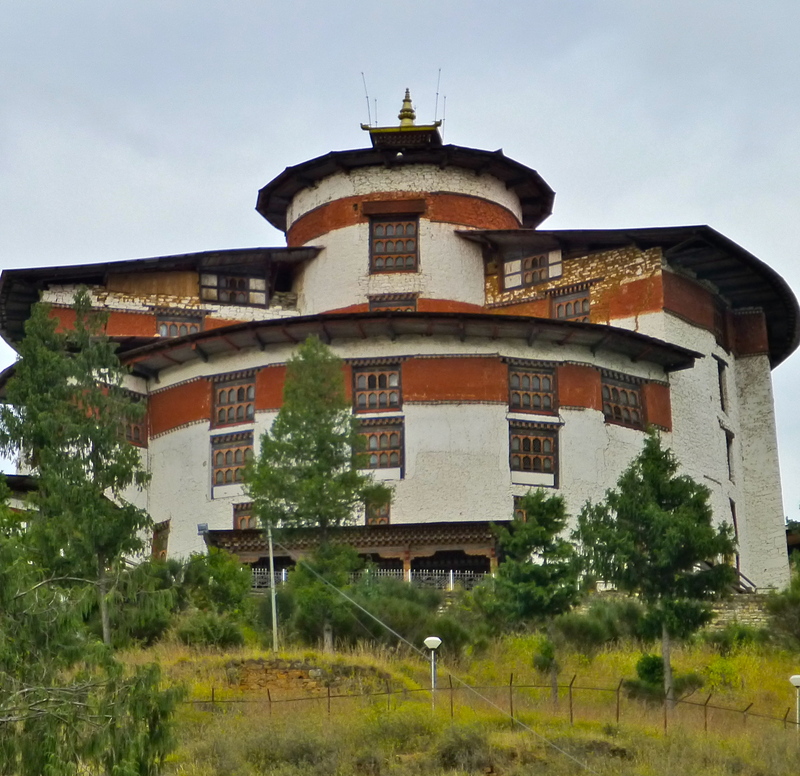 There are probably 108 wheels to spin on a single perambulation of the Dzong. Apart from the words on the outside of the wheel, the hollow centres contain scrolls of parchment with further prayers written on them. 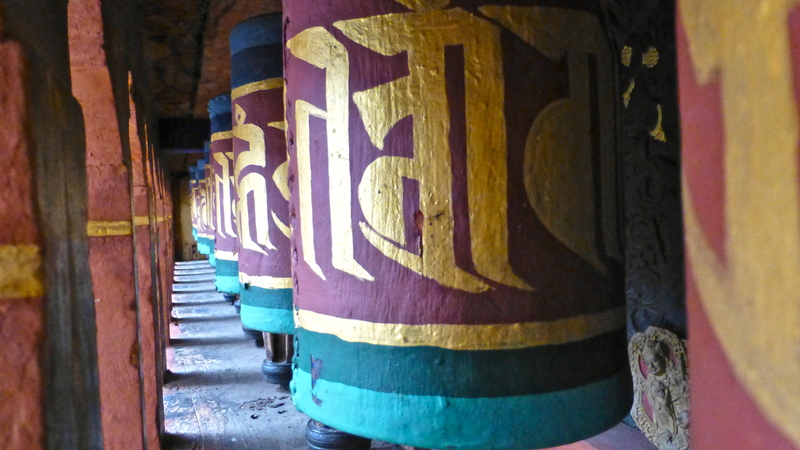 By spinning the prayer wheel, prayers are sent on their way. 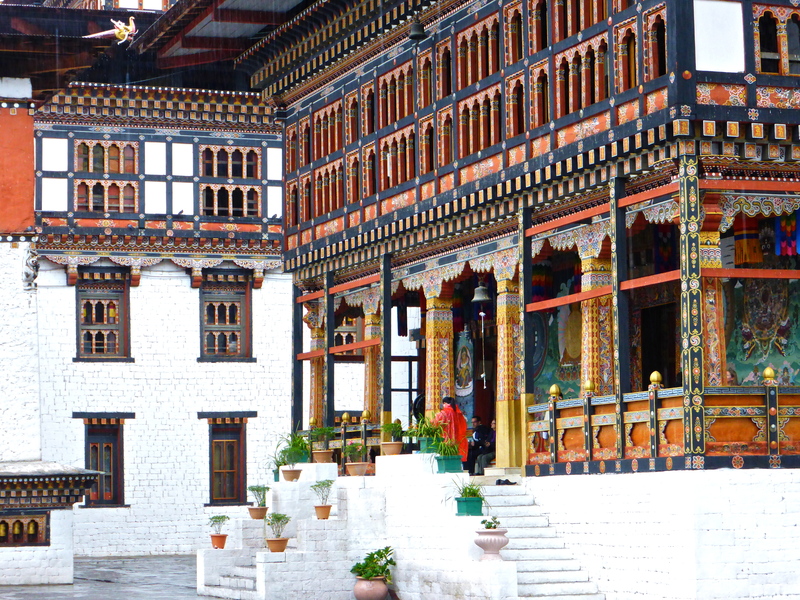 One of the magnificent courtyards of Paro Dzong. Perhaps I shouldn’t have this photo as photography was not allowed. This was because there are images of various deities within the hall. I was very careful not to violate the rule that the images must not be photographed. The walls are draped with material to protect the ancient murals beneath. 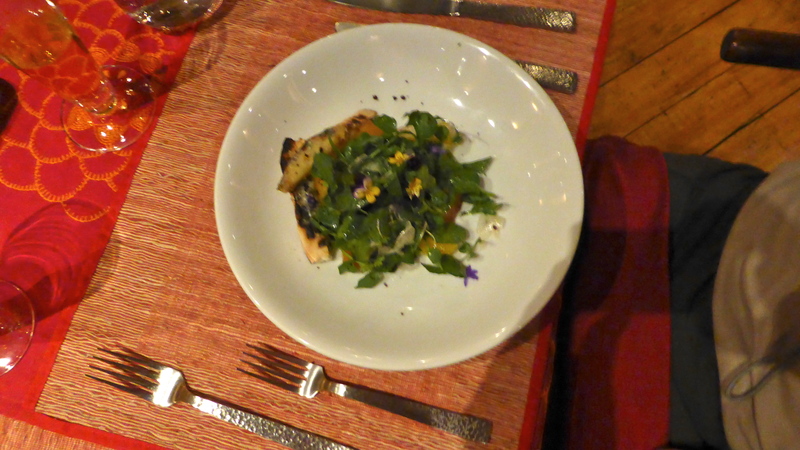 The floor was made from wide pine planks. 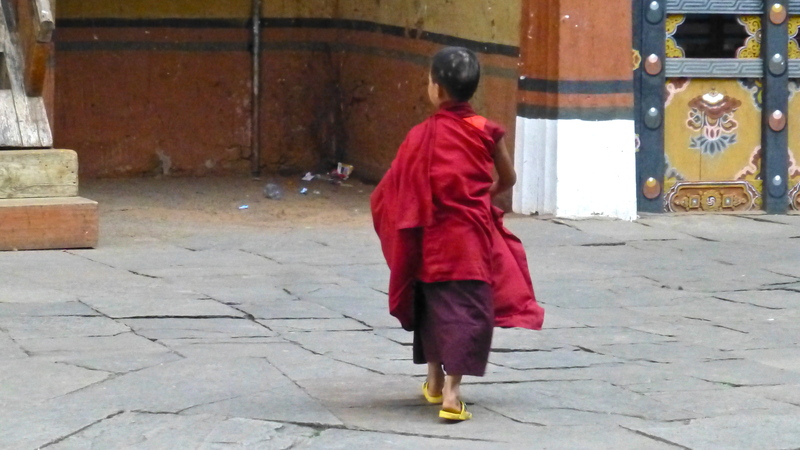 A young monk with a job in mind. 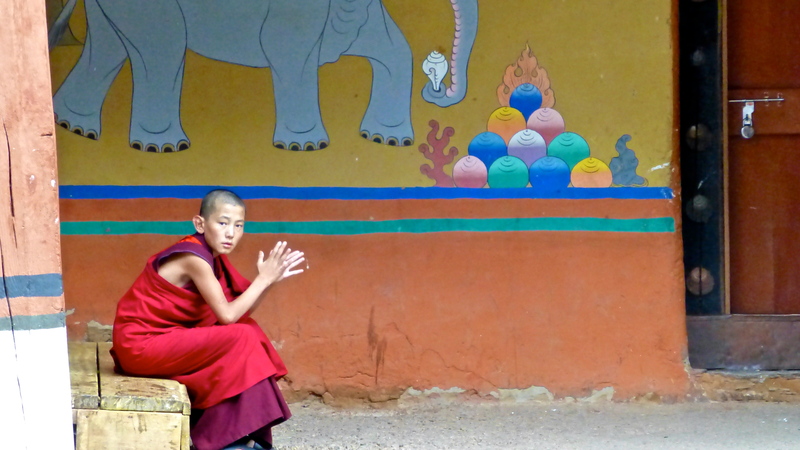 Contemplation in front of a mural depicting an elephant holding a conch shell. The conch shell has a number of uses. It is used to call together religious assemblies, much like a bell in a church steeple. It is also used during the rituals as a container for holy water and as a musical instrument. Naturally, conch shells can twist in a clockwise direction (a rarity) or commonly, in an anti-clockwise direction. The clockwise twist is considered especially sacred and is seen to replicate the celestial movement of the sun, moon and planets. The twirls of hair on Buddha’s head follow this direction as does the long curl of hair on his forehead, not to mention the conch-like swirl of his navel! 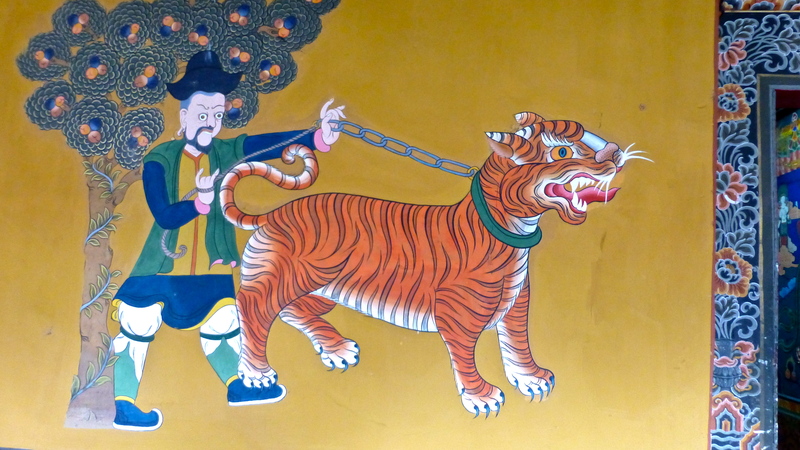 Detail of one of the murals depicting a story from one of the Buddhist stories. Detail of a wall mural. 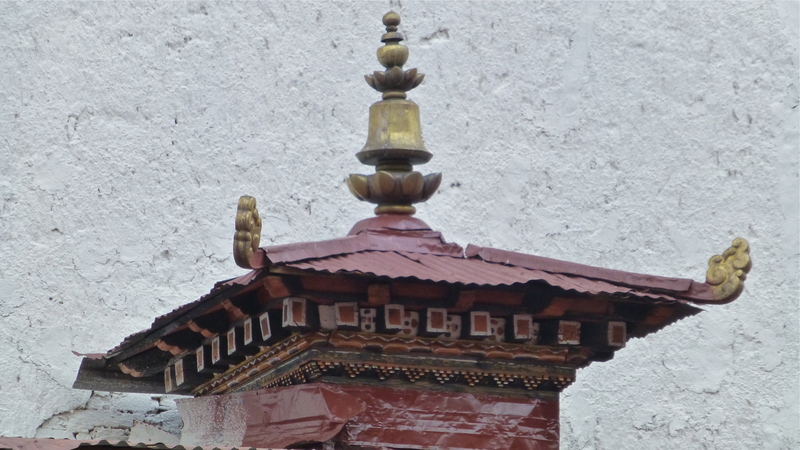 Visiting a Bhutanese Dzong is always an interseting experience. The Paro Valley lies in the NE of the country. 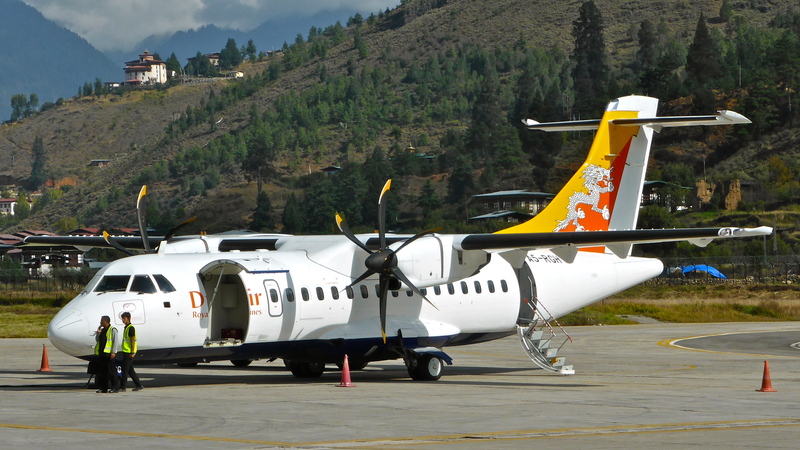 Bhutan’s only international airport is in the valley and is serviced by Druk Air and from October 2013 by a second, and private airline. The valley has a population of around 20,000. 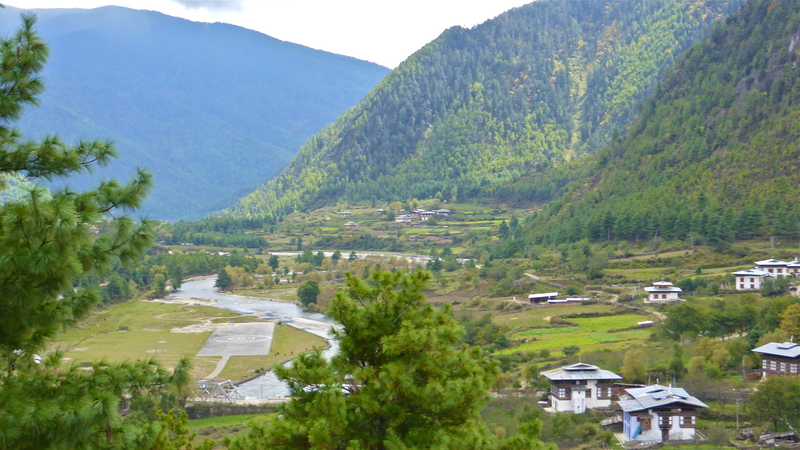 The Paro Valley is bordered on both sides by mountain ranges. 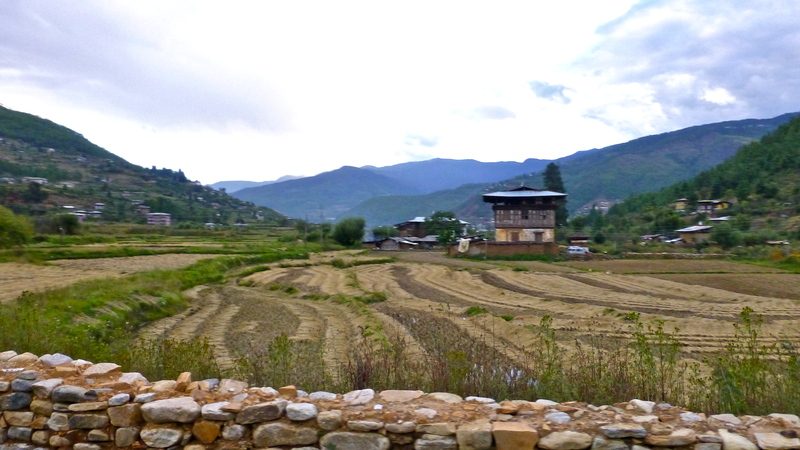 The valley floor is full of rich alluvial soil which is ideal for growing the red rice favoured by the Bhutanese. Heavy, flooding rains occurred the week before we arrived and considerable damage was done to the already harvested and still standing crops. Looking down the valley, the rice crop was in various stages of readiness for harvest. Generally, nothing is built on the valley floor as the land is too valuable for agriculture. Dwellings are built on the surrounding slopes. 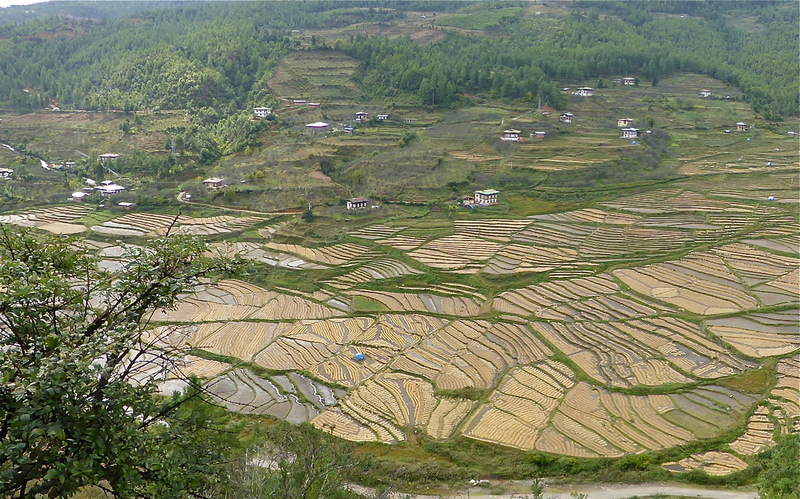 The red rice favoured by the Bhutanese has been grown in the Paro Valley for thousands of years. 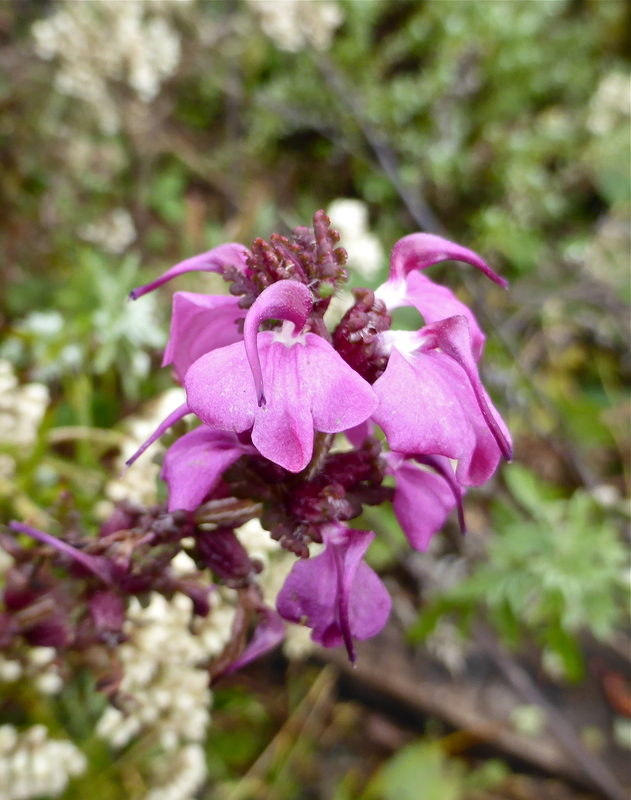 It is well suited to the 2438m (8000ft) elevation of the valley. 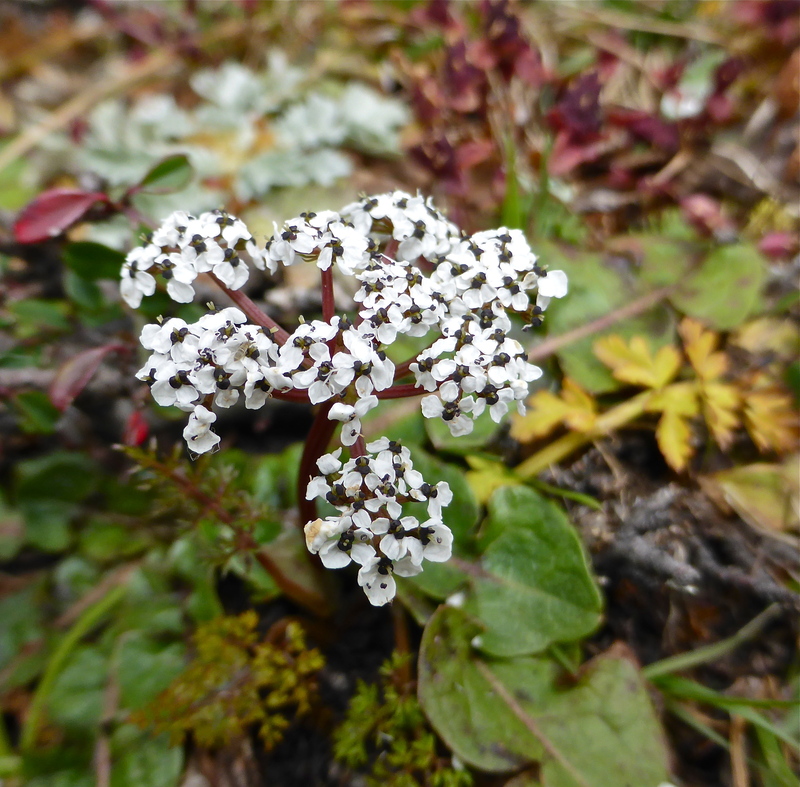 It is irrigated with glacial water rich in potassium and magnesium. The rice has a russet colour and possesses a complex nutty and earthy flavour. The harvested rice is laid down in rows and left to dry before threshing. Some residual water from the flooding a week before our visit can be seen in the lower left of the photo. The rice in this field will probably be ruined as a result of drying too slowly. A black fungus will spoil the rice as it takes advantage of the wet conditions. 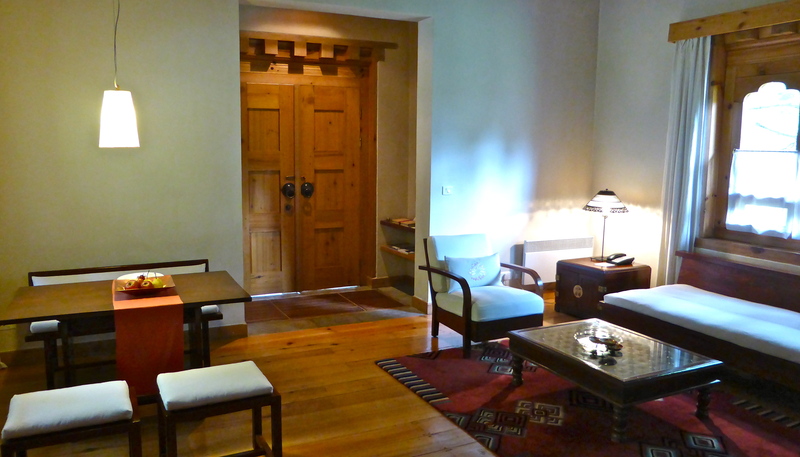 On our return to Paro we stayed in Villa 19 at the Uma Paro Hotel. It was quite some villa. 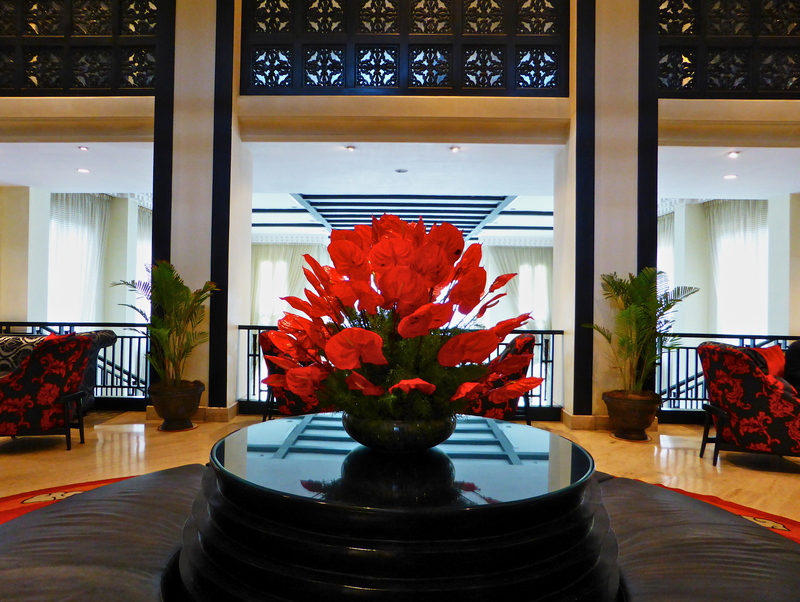 Inside the front door, this spacious scene greeted us. 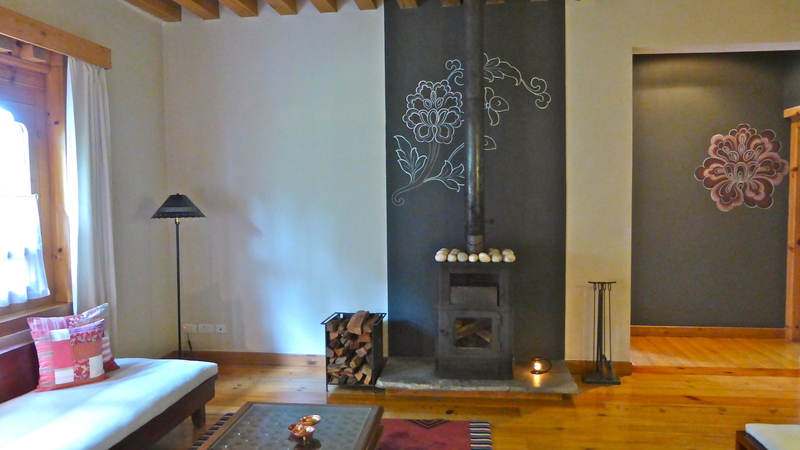 The wood-burning heater and passageway leading to the two bedrooms. 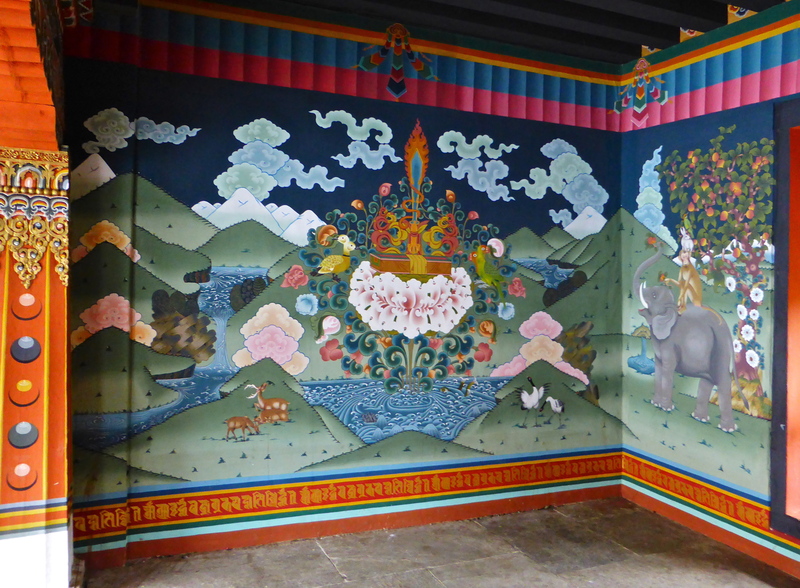 Painted murals are a common feature of both inside and outside walls in Bhutan. Apart from this room there was another smaller room with a bed and massage table. It also had a wood-burning heater. Another small room belonged to the butler! It had a ¾ size fridge, sink and a range of glasses, plates and cutlery. We were able to use these facilities, and did, when we invited our fellow passengers for pre-dinner drinks one evening. over the various trails and roads which link villages to the larger towns. Rice ready to be harvested. It was high summer and the drainage ditches should have been dry, but were wet as a result of the recent rain associated with Very Severe Cyclone Phailin which caused considerable damage in eastern India in October 2013. Phailin was the second strongest cyclone to ever make landfall in India. An estimated 12 million people were effected with 550,000 people being evacuated to safer locations. 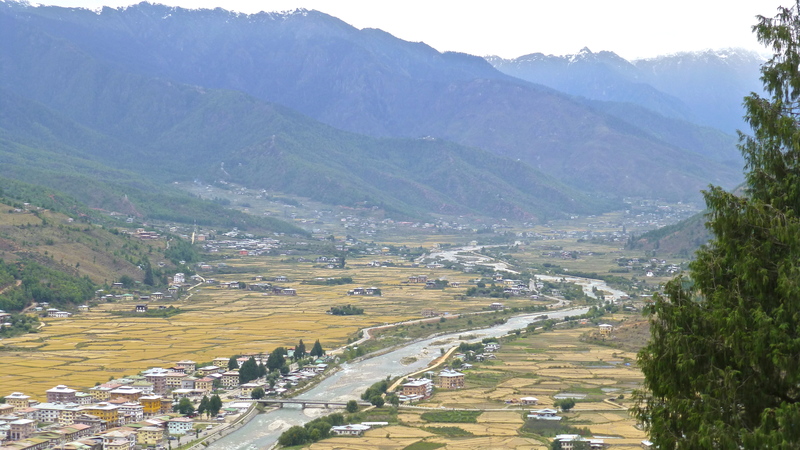 The Paro Valley is surrounded by the Himalaya. These are the mountains Druk Air pilots have to negotiate to land safely in this valley. 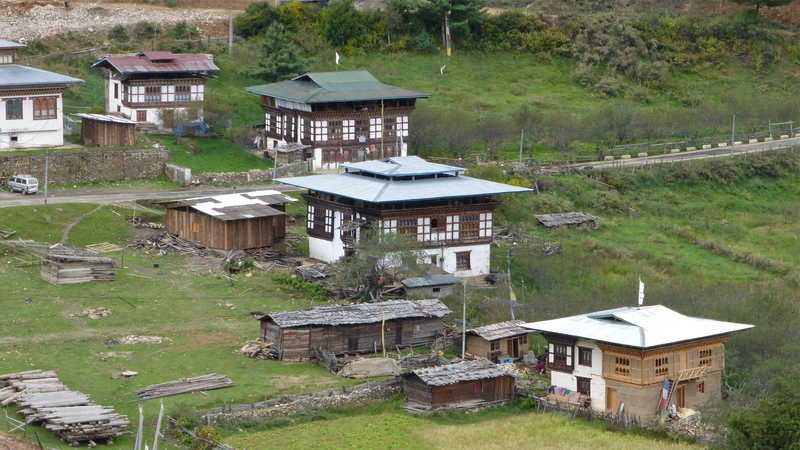 The colourful, low-rise buildings of the city of Paro. 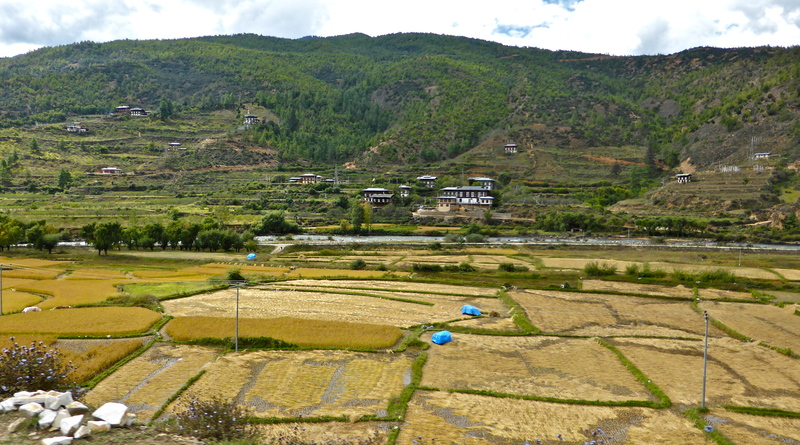 The rice fields are irrigated by water from the Paro Chhu which flows along the valley floor. 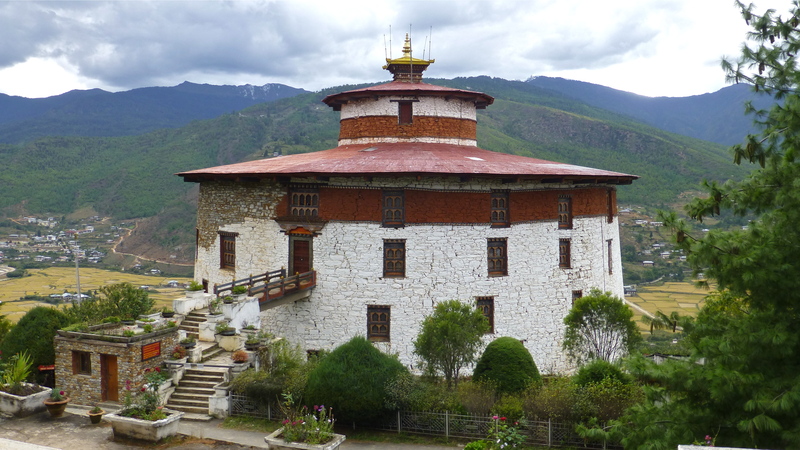 Ta Dzong, built between 1649 and 1651, stands on a hill above the Rinpung fortress-monastery. It overlooks the valley and was used to watch for invading Tibetans. In 1968 it was opened as the National Museum. 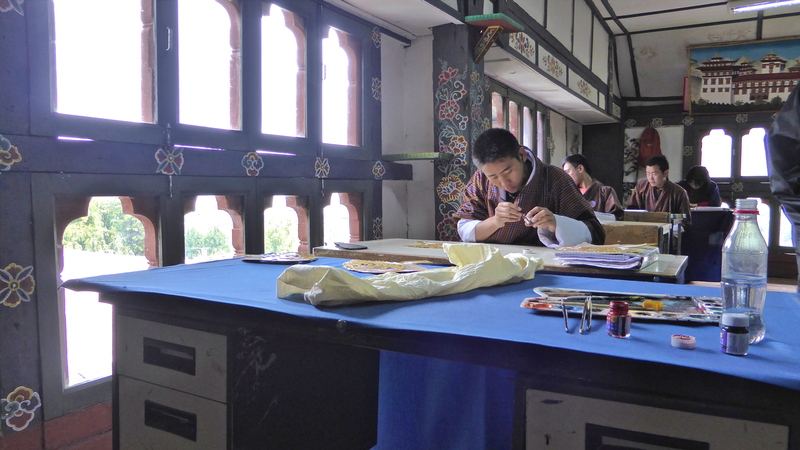 It has in its possession over 3000 works of art covering more than 1500 years of Bhutanese cultural heritage. At present it is closed to the public for repairs after major structural damage occurred during an earthquake in 2011. New stone work can be seen at the top left of the photo. 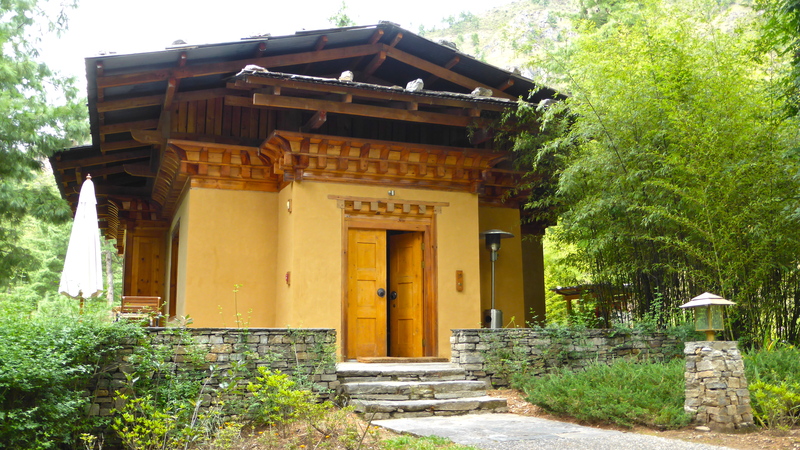 A nearby temporary building now houses some of the treasures of Bhutan. Restoration of the old building is expected to be completed by 2015. When the National Museum re-opens in 2015, it will be equipped with modern facilities such as CCTV and metal detectors. 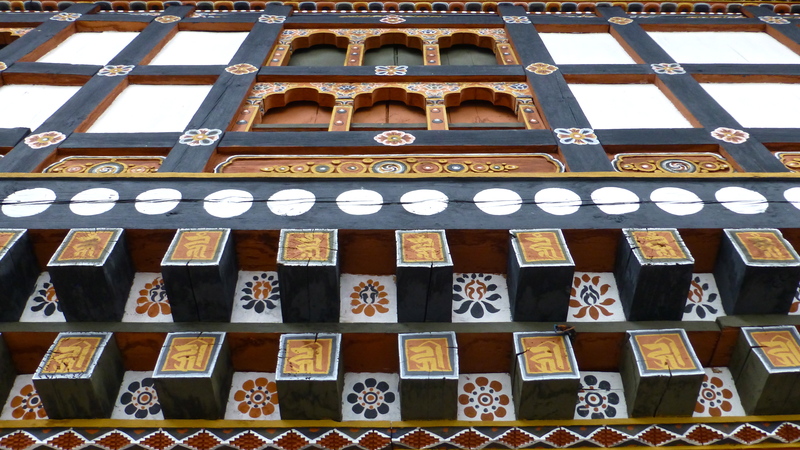 The Ta Dzong is an art work in itself. More new stone restoration work can be seen. 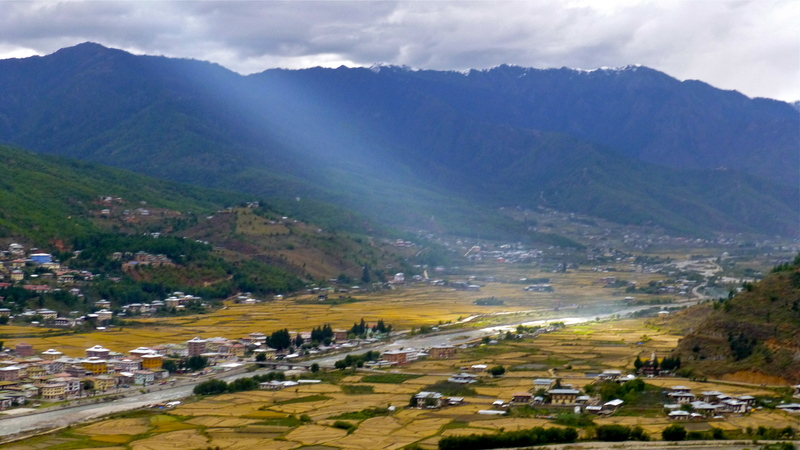 A gap in the clouds let a shaft of sunlight beam down into the Paro Valley in the late afternoon. 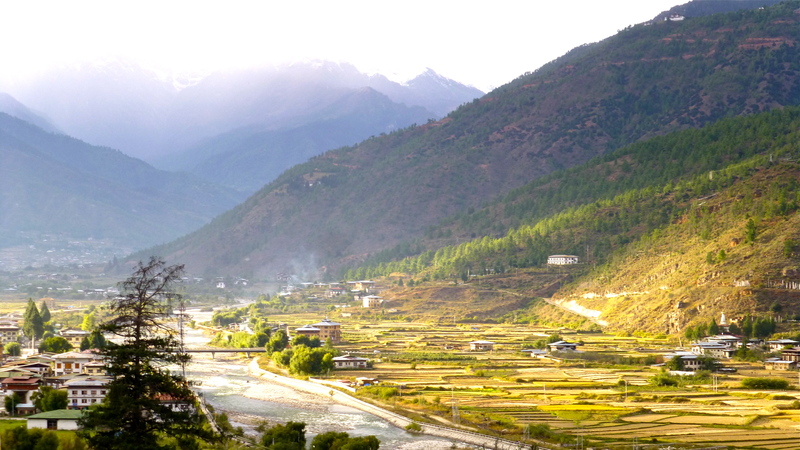 The Paro Valley, bathed in late afternoon sunlight. 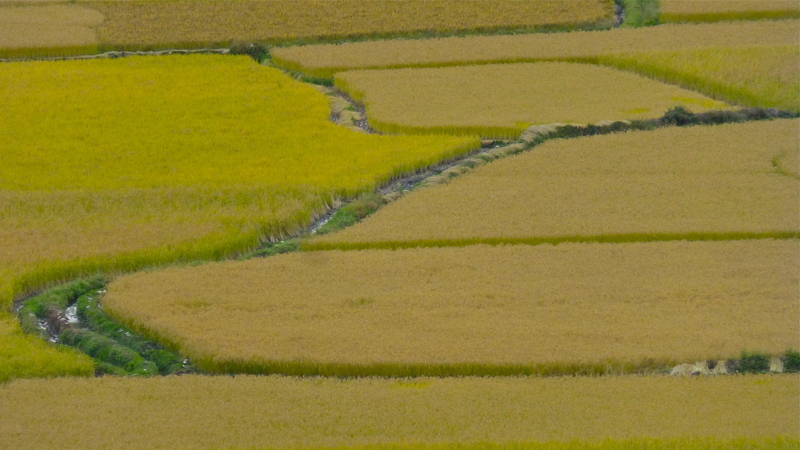 Golden yellow rice crops ready to be harvested. 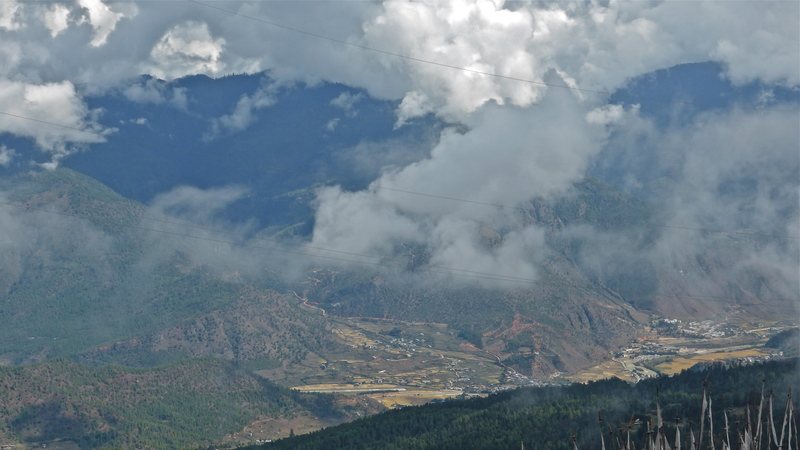 The green roof in the centre left of the photo belongs to one of the hangers at Paro airport. 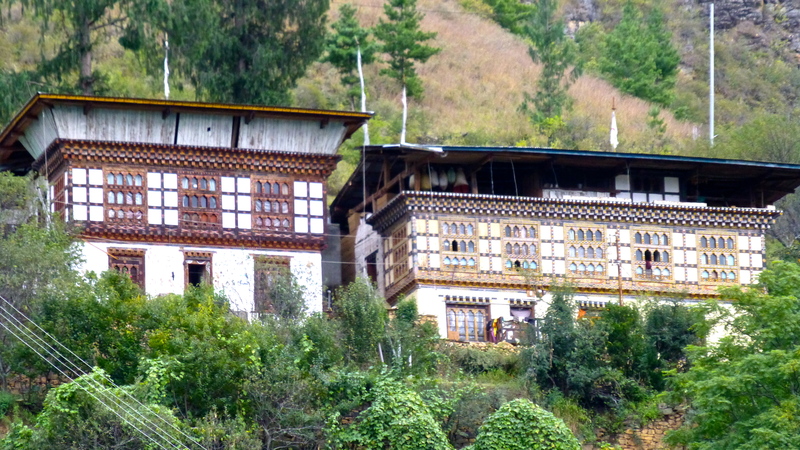 Typical, traditional Bhutanese houses in the Paro Valley. Already harvested rice was laid out in neat rows. Surface water can be seen which will most probably render this rice unusable. 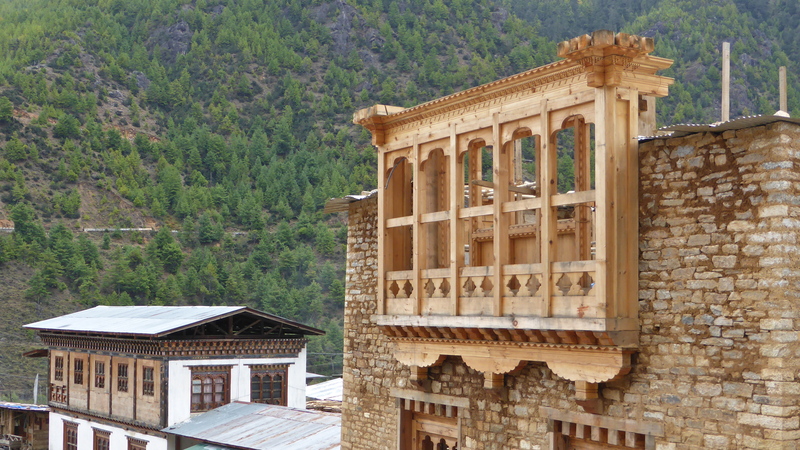 Traditional buildings line Paro’s main street. 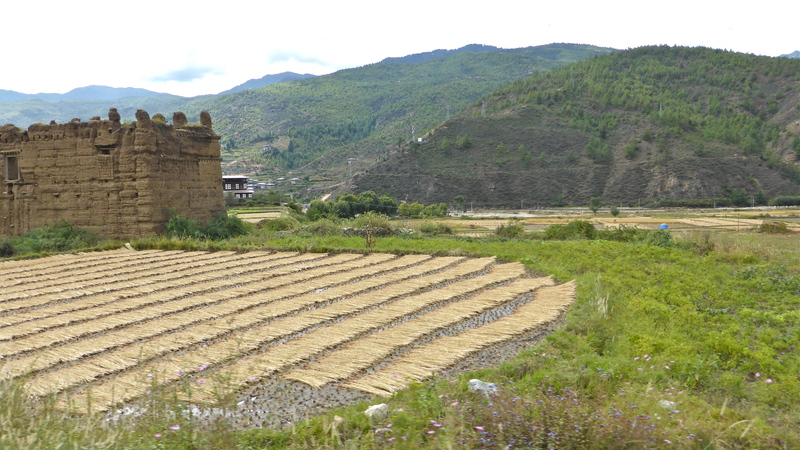 Rinpung Dzong is in the background. The National Museum is just out of sight, up and behind the Dzong. 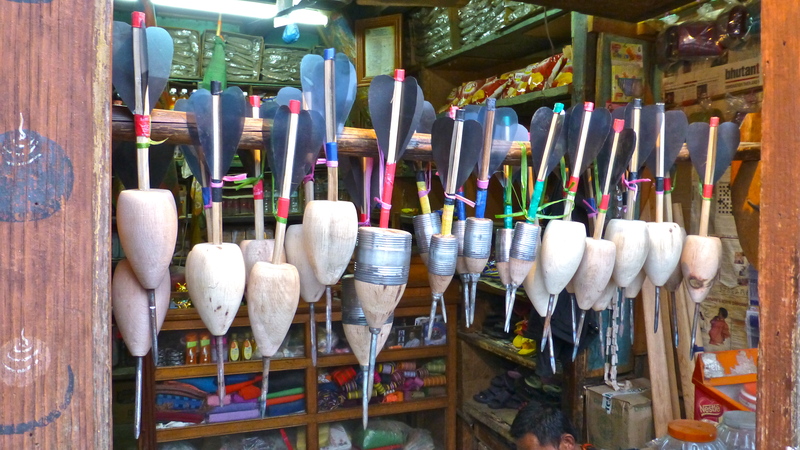 Khuru darts for sale in a shop in Paro. These large heavy darts are thrown in an outdoor game. The target is between 20 to 30 metres from the thrower. 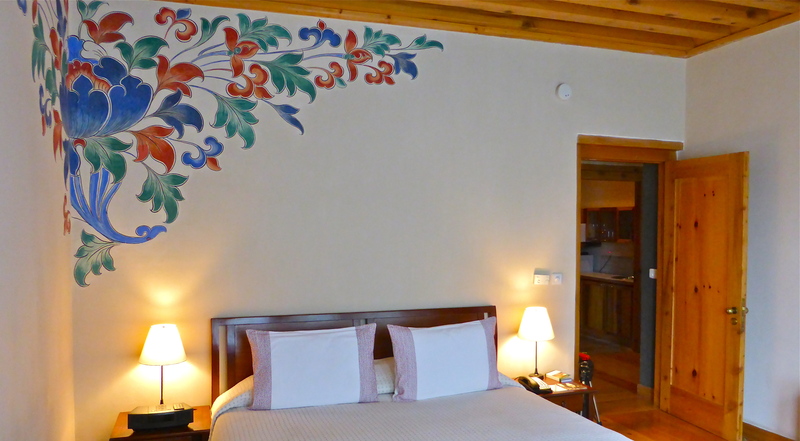 After a day’s sightseeing we went back to Villa 19 at Uma Paro Hotel. Dinner followed shortly afterwards. The Dinner Menu offering a selection of Bhutanese dishes. Western tastes were catered for as well. ‘Jasha dhang yesey pega hentsey’ or Grilled chicken curry with coriander & mustard greens. Yum – more please! 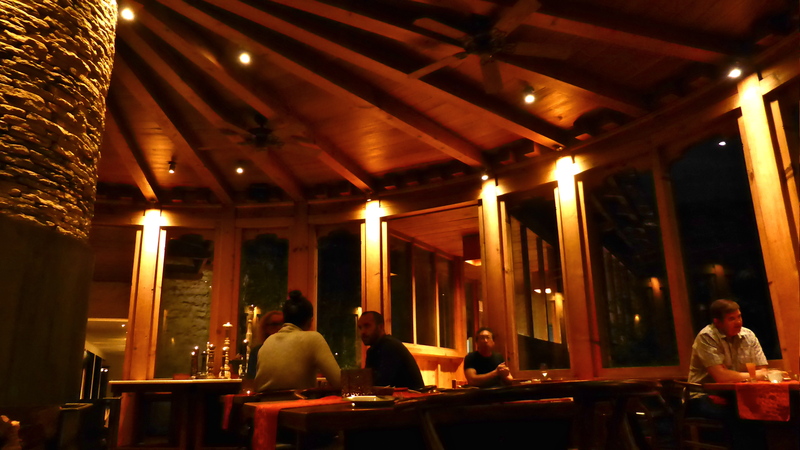 In the circular dining room at Uma Paro Hotel, a central wood burning stove keeps diners warm on chilly nights and mornings. 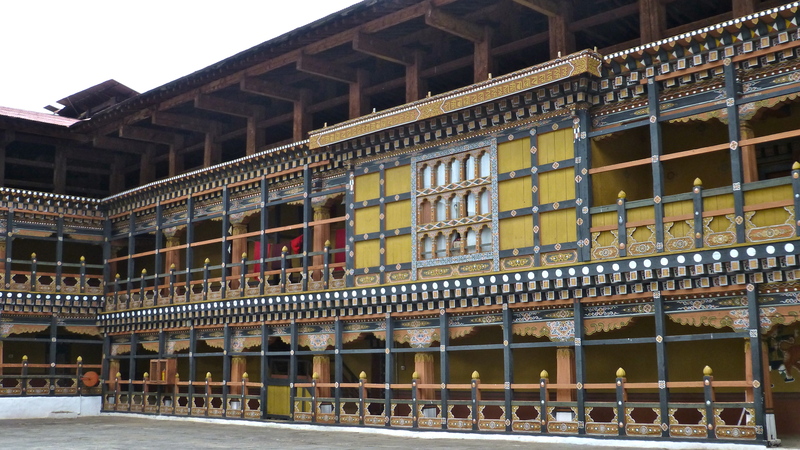 As is typical with most traditional buildings in Bhutan, varnished timber and stone predominate as building materials. Dinner here, was a great way to finish a good day in the Paro and Haa Valleys. As early as 1914, the first king of Bhutan, Ugyen Wangchuck, built two schools to help prepare for the unavoidable contact with the outside world that Bhutan was inevitably going to experience. By the 1920’s a few more schools opened offering modern education along the lines of that taught in the British India school system. 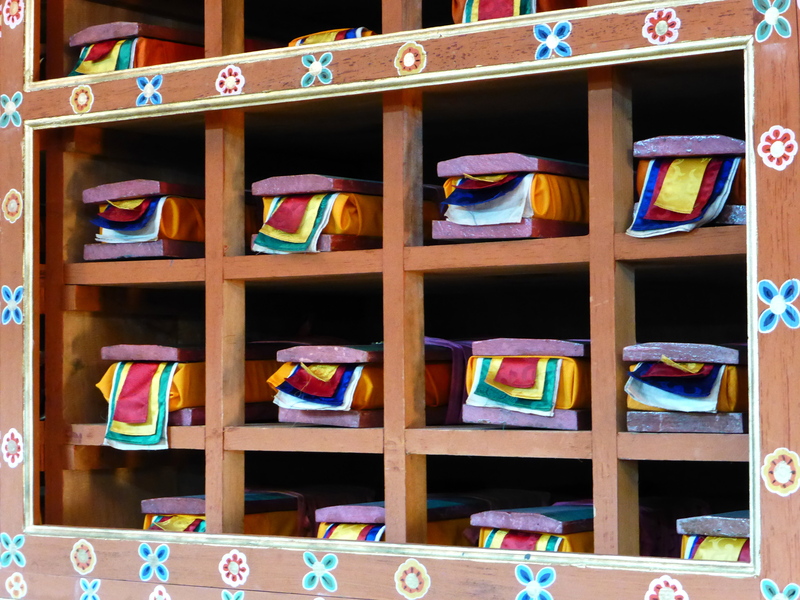 Until the late 1950’s, however, most schooling was handled by the Buddhist monasteries. Nowadays, most children in urban centres go to school whereas those in rural areas are less likely to. 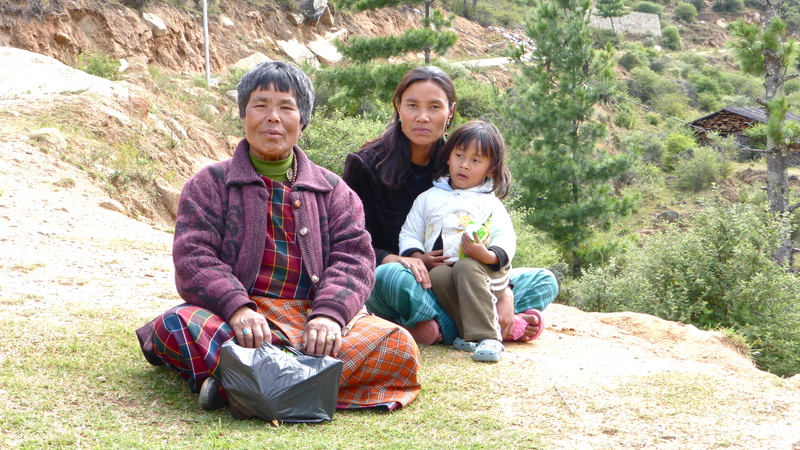 The 2008-2012 adult literacy rate stands at 52.8% (UNICEF – Bhutan – Statistics). 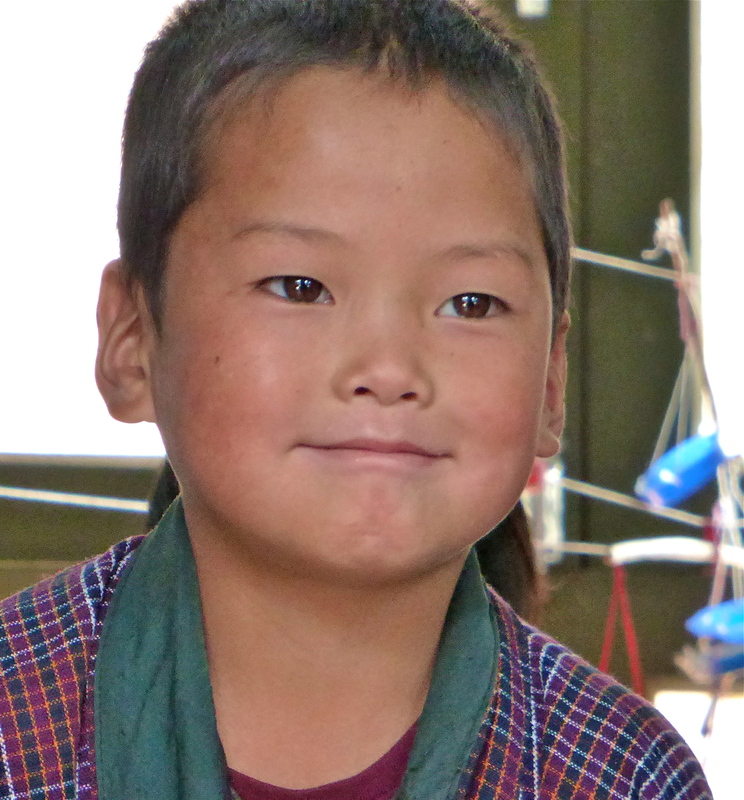 The Sisina Primary School is not far from Thimphu. With this sign post that welcomes visitors and points the way, you’re not likely to get lost here! The school is of simple construction consisting of a couple of long buildings containing classrooms side by side. It is just one room wide, a very neat and tidy place and is in good repair. Inside, the children work at tables learning the usual subjects primary-aged children learn. 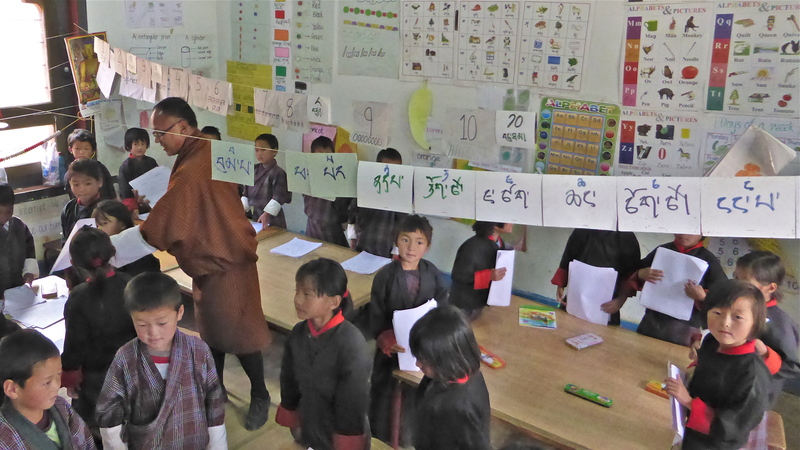 All subjects are taught in English with the exception of their own Dzongkha language. The boys and girls wear school uniform – a variation of the national costume. The teachers wear the national costume as well, as do all government employees. There appears to be no resentment to this rule as everybody wears the apparel with pride. Younger people are seen wearing Western dress in the larger cities but on all formal occasions they happily revert to the national costume. These two lads are resplendent in their well cared for uniform. The loose fitting, knee-length garment is called a gho. 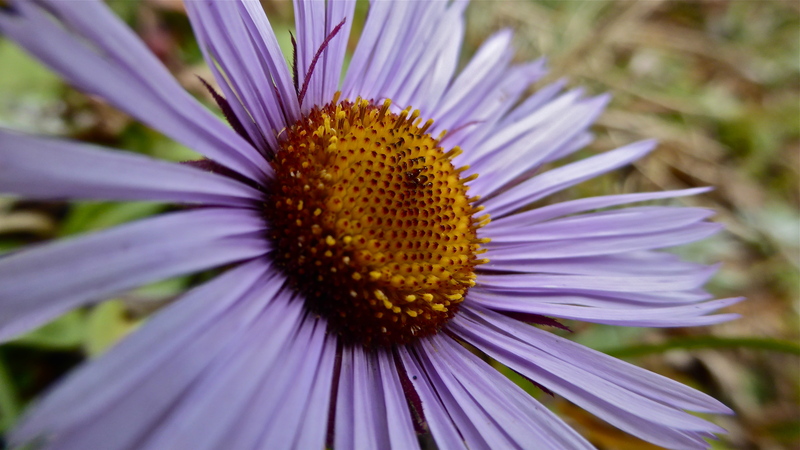 It was introduced in the 17th Century by Shabdrung Ngawang Namgyel to give the Bhutanese a more distinctive identity. It is tied at the waist with a cloth belt called a kera. Girls wear an ankle-length dress made from woven fabric. The rectangular piece of cloth (kira) is wrapped and folded around the body and pinned on both shoulders, often with a broach. The dress is tied at the waist with a long belt. The kira is usually worn with a long-sleeved blouse (wonju) underneath and a short jacket (toego) over the top. perhaps he was enjoying the break in lessons due to our visit! even the youngest children are happy to chat to visitors in English. Many of us had taken school-room necessities with us as a donation for the school. All kinds of pencils, crayons, paper and pens were handed over to the teachers for distribution to the children. Friendly smiles and appreciative waves were offered on our departure. These women were sitting by the side of the road near our waiting bus. Maybe they were waiting for their sons and daughters to finish their classes? 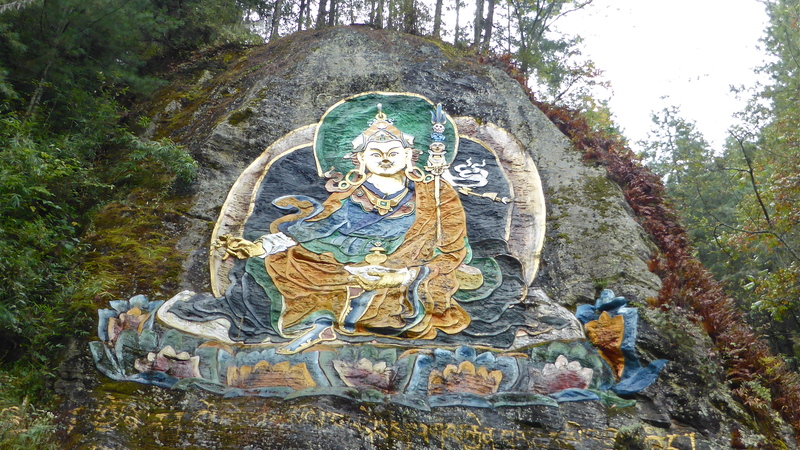 A stop on the way to the Tango monastery was made at this mural painted on a large sheer rock face. 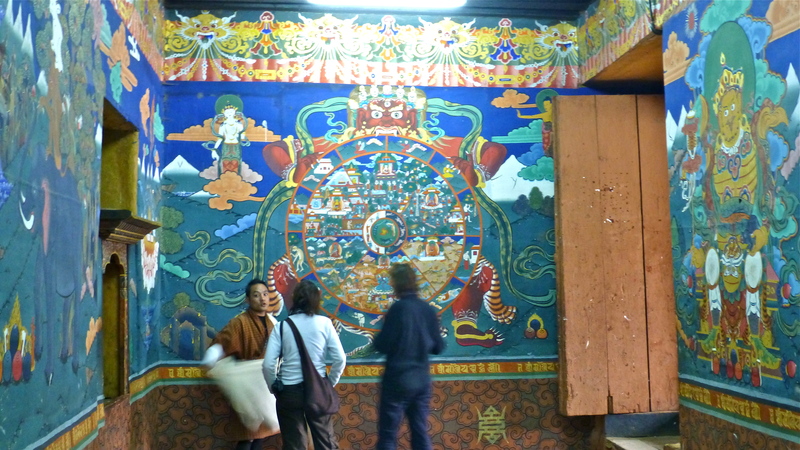 Near the mural was a small building with a water driven prayer wheel. 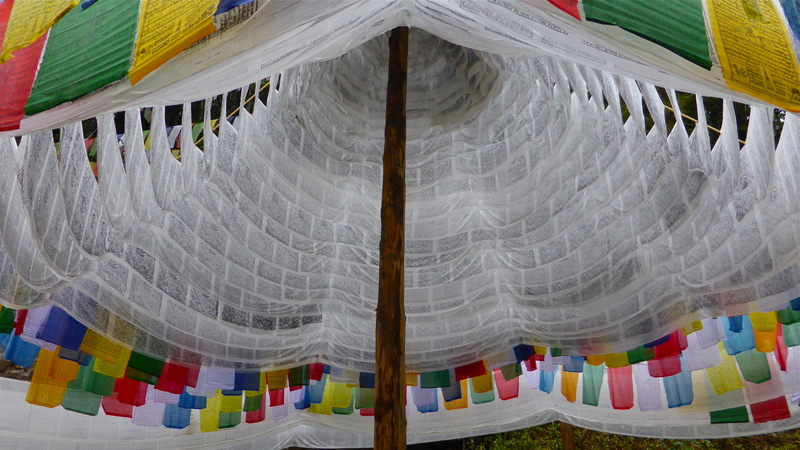 To one side was an open structure created by prayer flags. I’m not sure what it was all about but it was very photogenic. 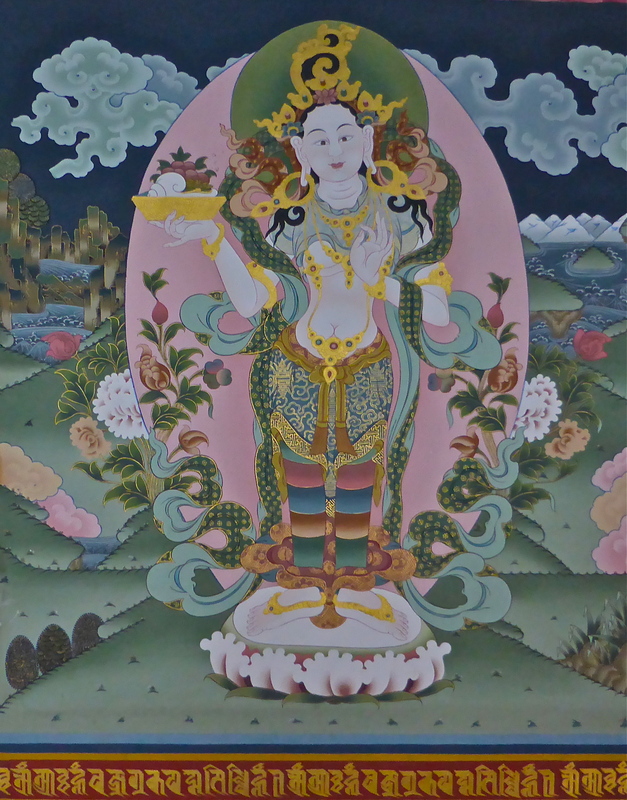 The colourful mural of Buddha. The whole structure was most impressive. 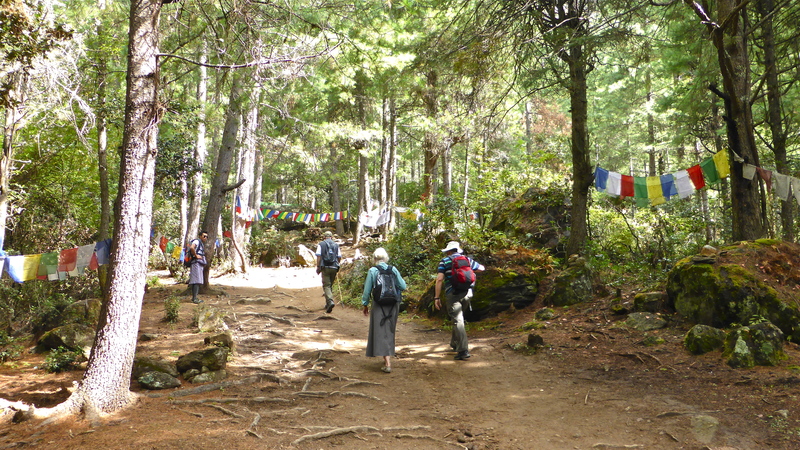 Tango Monastery is about 14 kilometres north of Thimpu. Its a steepish hike up to the this site which was founded in the 13th Century as a place of meditation in caves in the mountain side. The monastery was built over the caves in 1688. 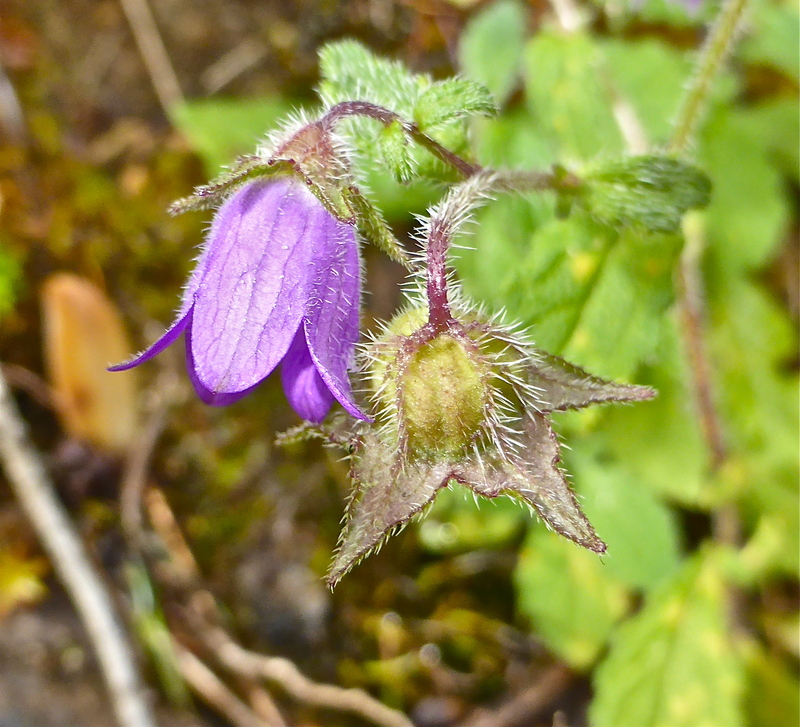 Campanula sp. 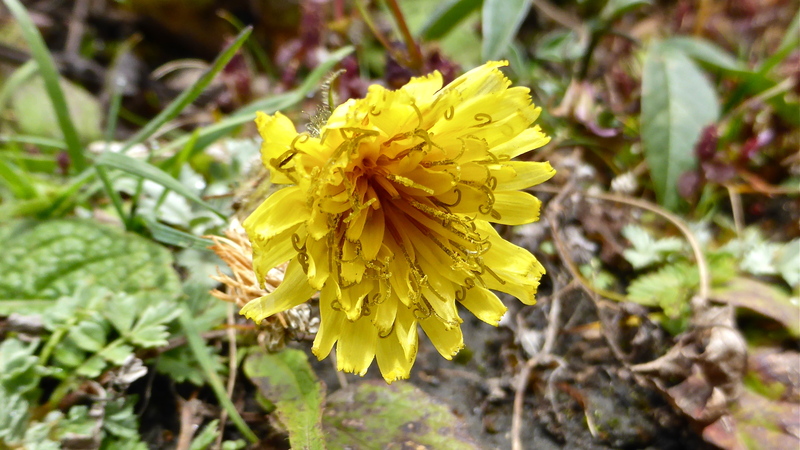 with very bristly stems and calyx. 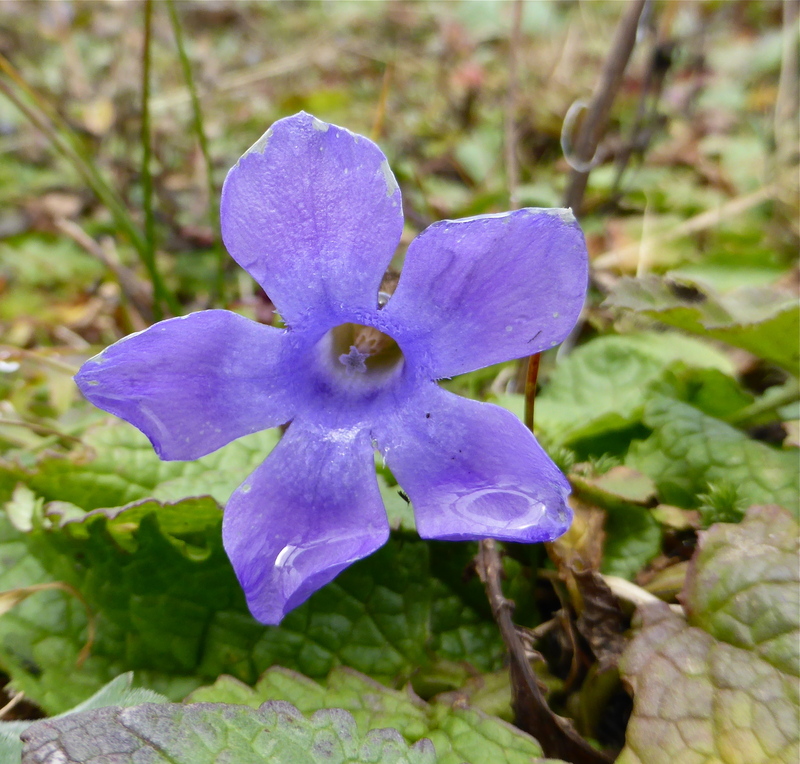 As usual on these walks, I found flowers of interest to photograph. 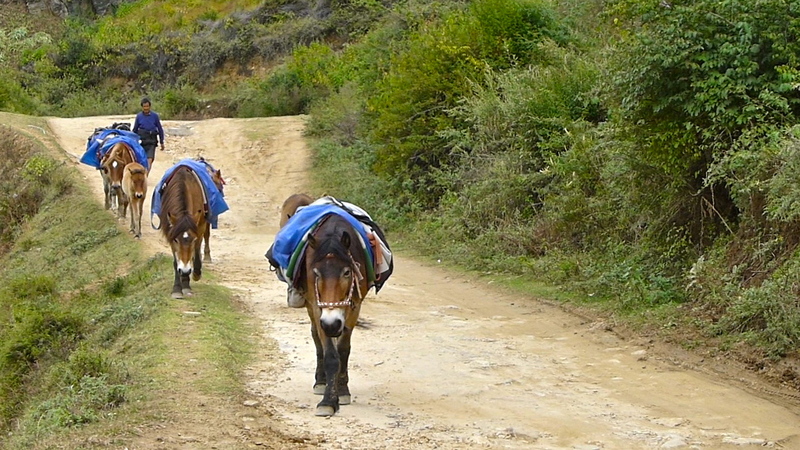 In Bhutanese, the name Tango means horse’s head. 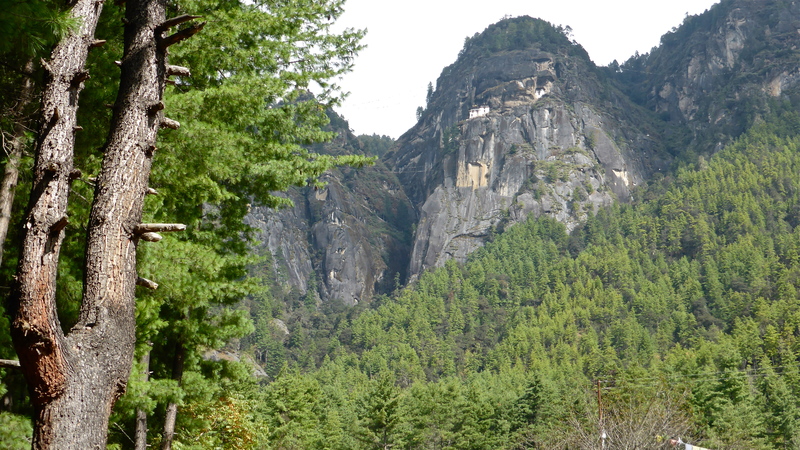 The rock face on the mountain here is identified as the ‘Horse head’ or ‘Hayagriva’, the name of the deity worshiped here. 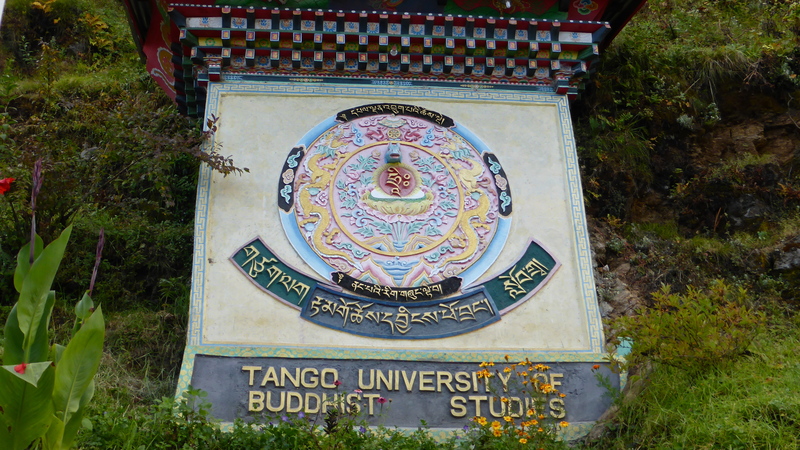 Tango Monastery is renowned in Bhutan as a University of Buddhist teaching. Below the monastery, a new university is being built that will take overseas students who want to learn more about Buddhism. Tango is also an important summer retreat for monks. This retreat, known as The Yarney, is held here in August/September. ‘Yar’ means “Summer” and ‘Ney’ means “to stay” and Yarney is a time when monks come to the monastery and stay within its precincts for the entire period while they observe strict monastic discipline, say special chants and prayers and avoid any type of entertainment. During this time the monks wear yellow robes, going back to the usual red robes when they return home after the Yarney is over. 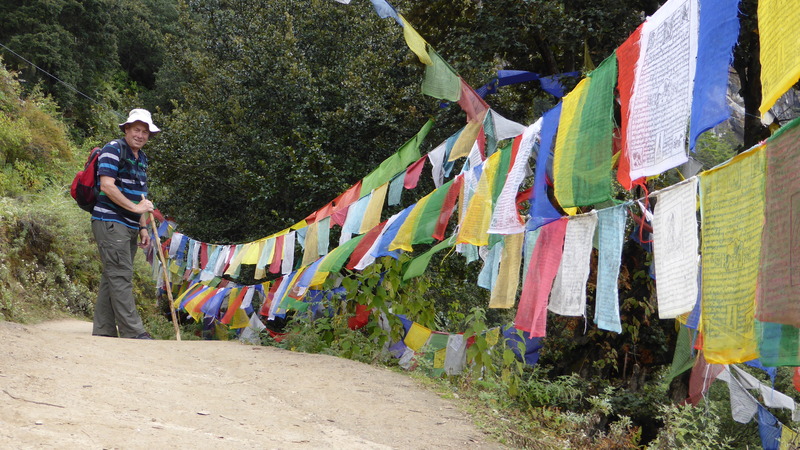 On the day we visited Tango, many bright, new prayer flags were in evidence. We learned that an important graduation ceremony had taken place just before our arrival. Monks graduate after 3 years, 3 months and 3 days meditation. Many family members and friends attended the graduation and were still around when we were there. 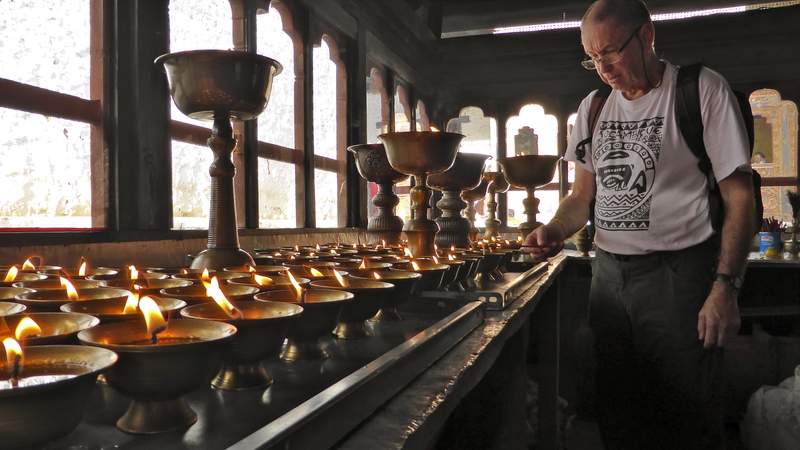 Butter lamps are an important part of Bhutanese Buddhanism. 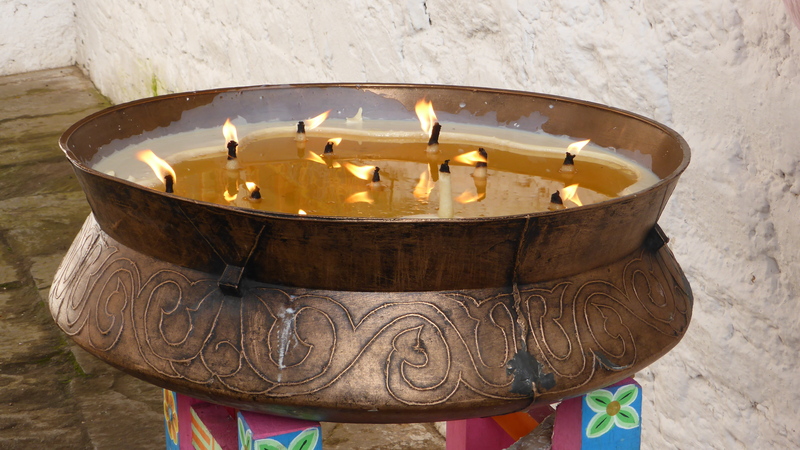 Traditionally these lamps burn clarified yak butter but more often these days ghee or vegetable oil is used. The small lamps seen here burn for about one day. The lamps are managed by the monks of the monastery as extreme care must be taken to avoid fire. Many a monastery has been burnt to the ground by a misplaced or knocked over lamp. The famous Tiger’s Nest Monastery was all but burnt to the ground in 1998 by a reported butter lamp being knoched over. 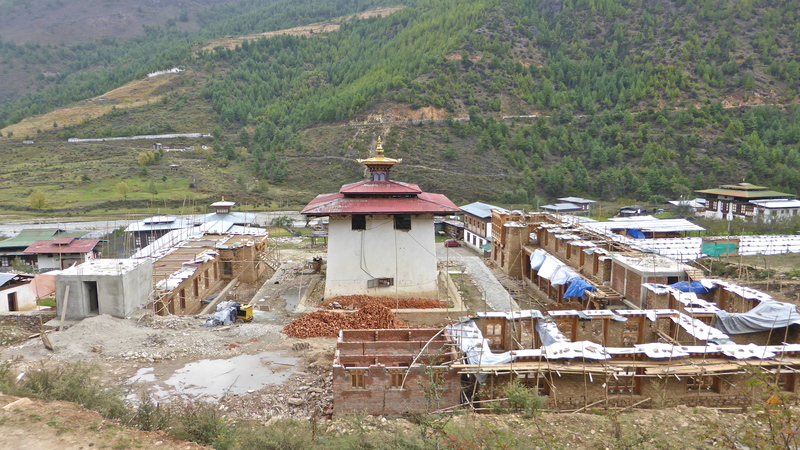 To help avoid total destruction of a monastery, separate outside buildings are now common. I was privileged to be allowed into this pavilion at Tango Monastery to light a lamp. It was in a stone forecourt with a stone flagged floor, so obviously much care had been taken with this lamp area. This large butter lamp holds 75kg (165lb) of ghee. It will burn for one month. 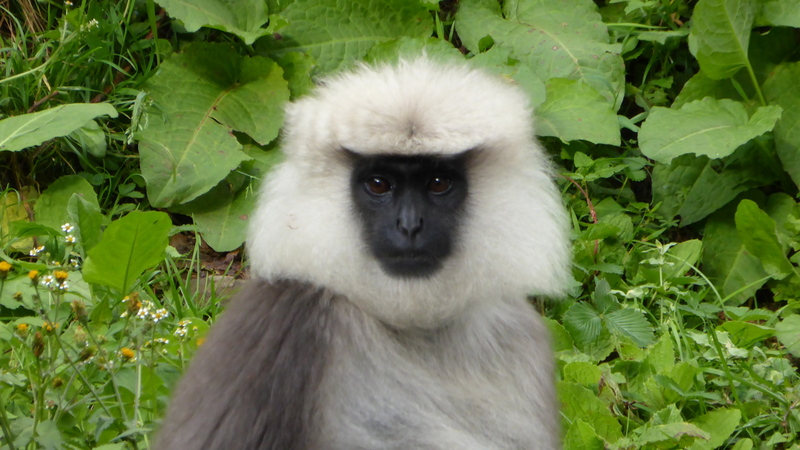 Black face langur at Tango monastery. A grand view of the Himalaya mountains from Tango monastery. 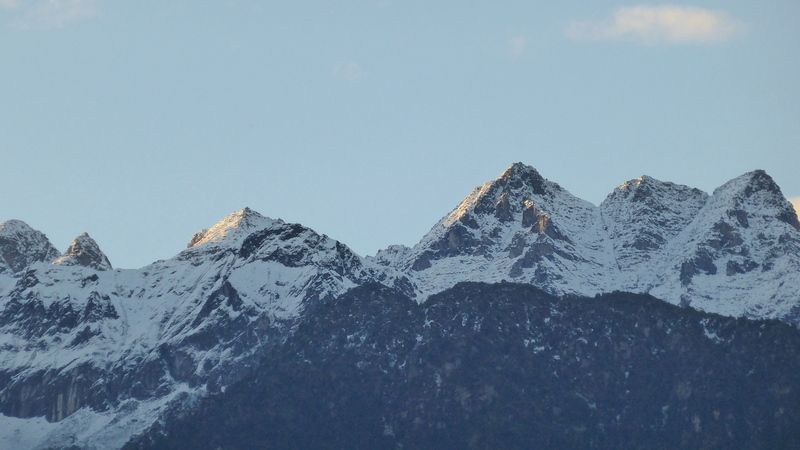 As we left, the last of the day’s sun clipped the Himalayas. A majestic sight! 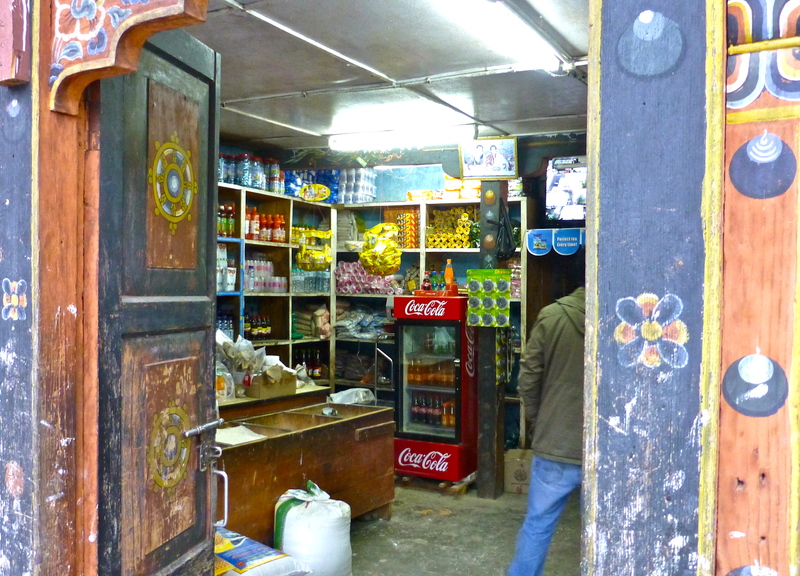 On the walk back down to the car park I got talking with a local who asked me if this was my first visit to Bhutan. I said that I’d had the privilege of visiting some ten years before. This gentleman immediately said that I would visit his country a third time. I do hope so! He asked me what differences I noticed between the two visits and what I liked most about his country. On parting as we reached the carpark, I asked him what his name was. 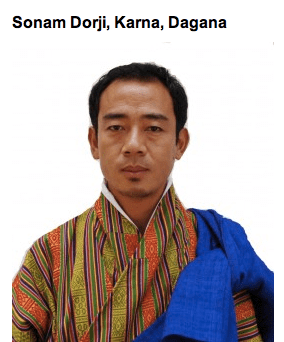 It turns out that he’s one of the 20 elected members of the National Council of Bhutan. I found this photo of The Hon. Sonam Dorji on the Web at <nationalcouncil.bk> He’s wearing the blue kabney worn by Ministers of the National Council when visiting a monastery. Meeting him was a real bonus for me for the day. Our further exploration of Thimphu took us to the The National Memorial Choeten before going into the busy shopping centre where there is a ‘dancing policeman’ instead of traffic lights. 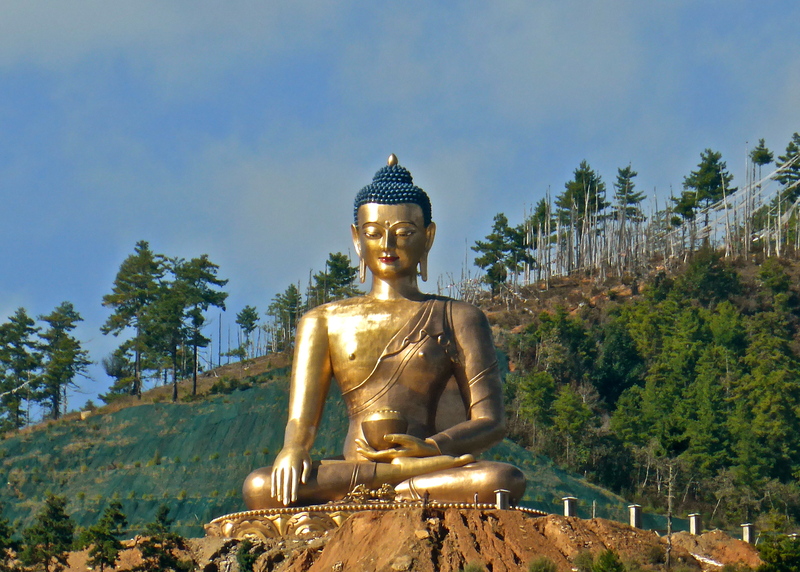 We then drove up onto a hill where a huge, golden statue of Buddha, the Buddha Dordenma, is being built. The National Memorial Choeten was built in 1974 by Her Majesty Queen Phuntsho Choden Wangchuck in memory of her son, King Jigme Dorji Wangchuck. 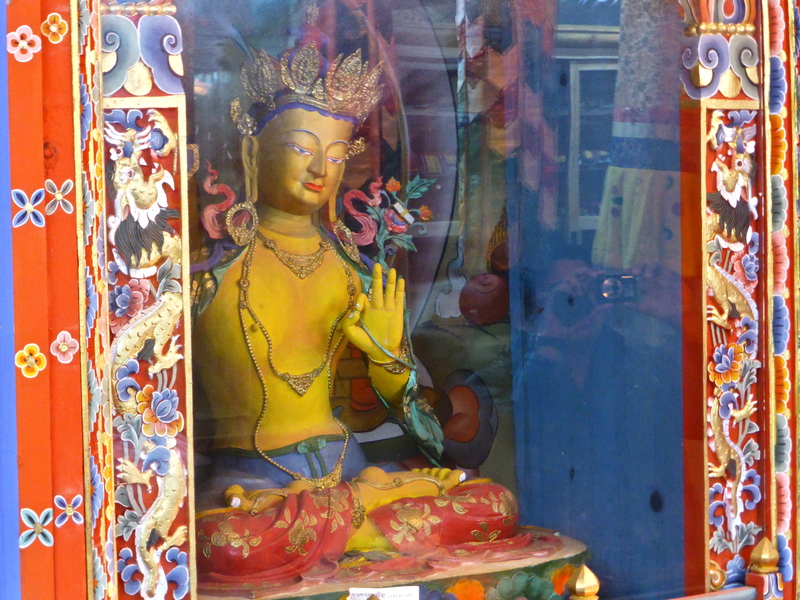 It stands in the centre of Thimphu. The day before our visit, an important commemoration took place and workers were still cleaning up after the event. It was very wet. 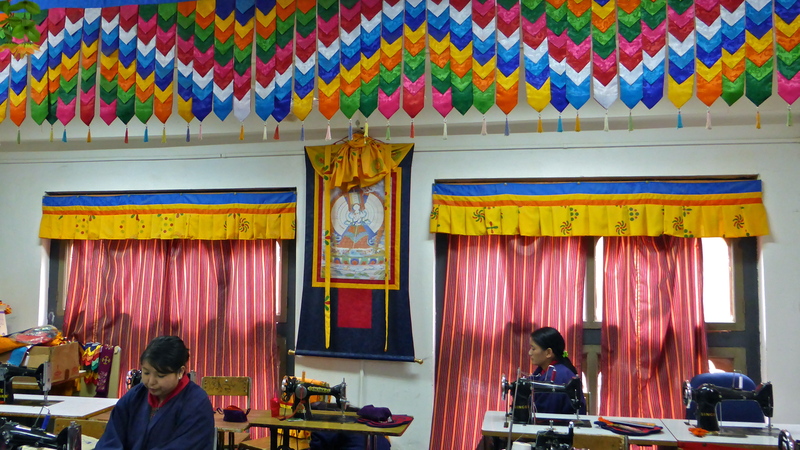 The choeten was decorated with new hangings, maybe made by the students in the Zorig Chusun School of Traditional Arts. Brooms, switches, shovels and rubbish bins being used in the clean-up after the festivities of the day before. 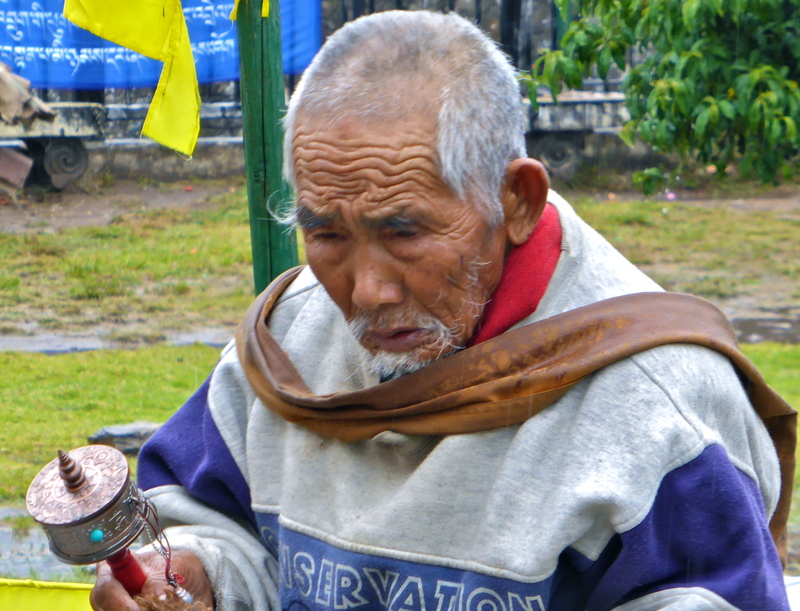 This old man with his trusty prayer wheel was circu-ambulating the choeten – always in a clockwise direction. 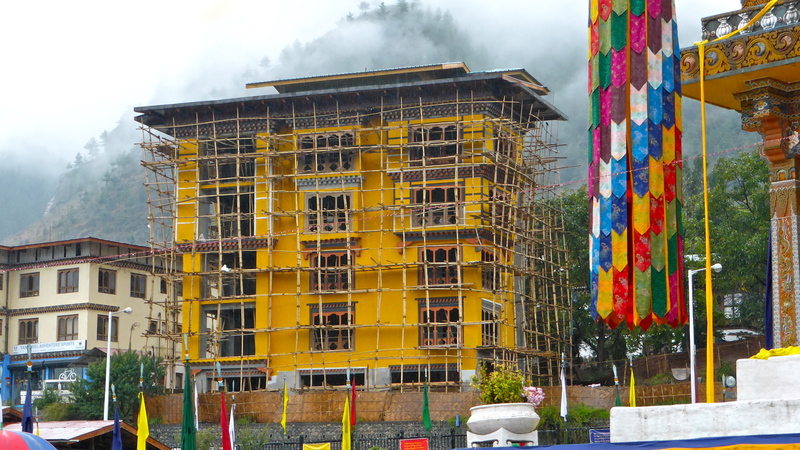 Bamboo scaffolding surrounded this new building in downtown Thimphu. 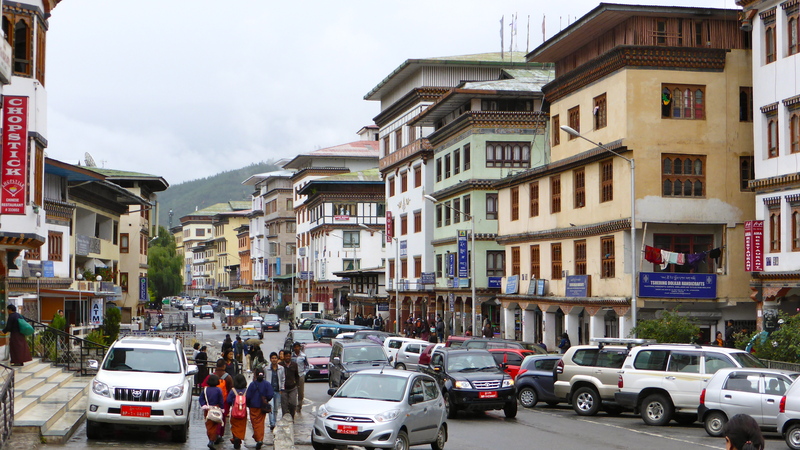 One of the main streets of Thimphu busy with motor traffic and people – a bit like any other city except for the architectural style. 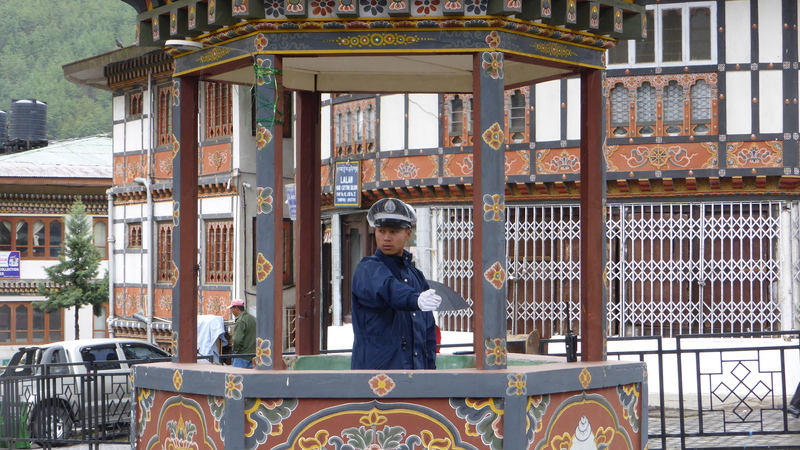 The Dancing Policeman on duty in his pill box in the centre of the main intersection in Thimphu. He was replaced a few years ago by a set of traffic lights but the people of Thimphu didn’t like the change, so in keeping with the country’s Gross National Happiness principles, he was re-instated. Thimphu remains the only capital city in the world without traffic lights. 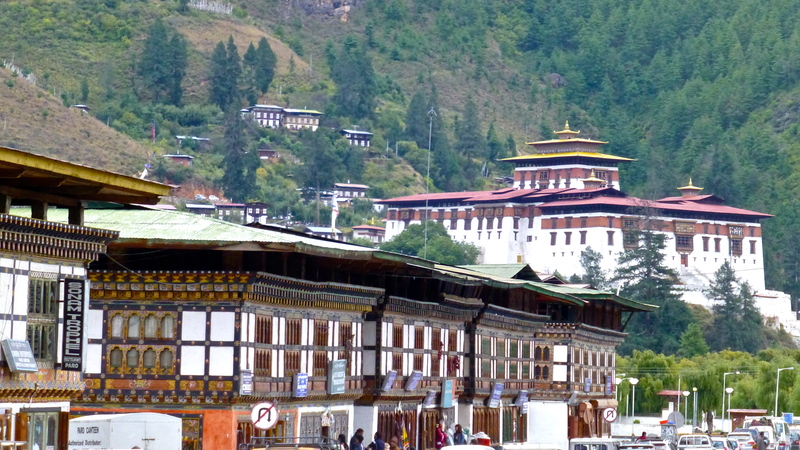 Tashichhodzong, Thimphu Dzong, is located on the northern edge of Thimphu. It is a fortress, a Buddhist monastery and the headquarters of the clergy, the seat of government since 1952 and also contains the Throne of the King. 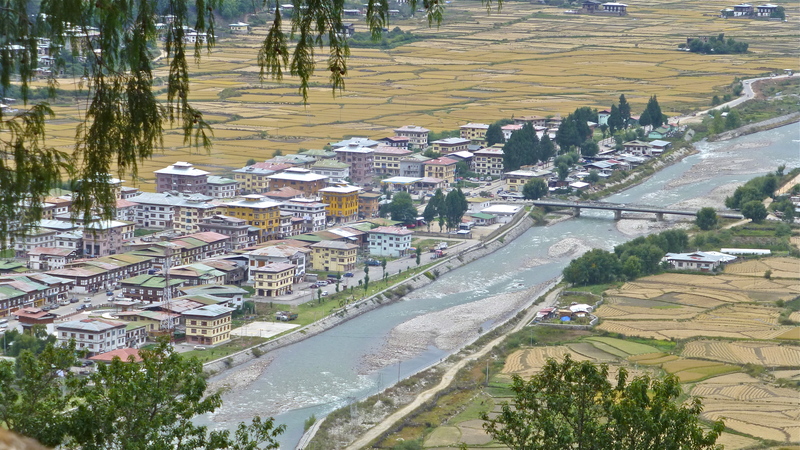 Thimphu stretches along the valley of the Wang Chhu. 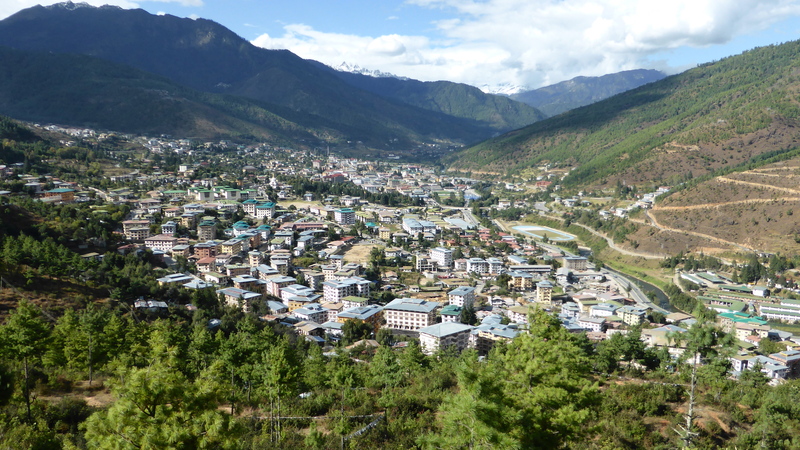 This view of Thimphu is taken from the site where the Buddha Dordenma is being built. 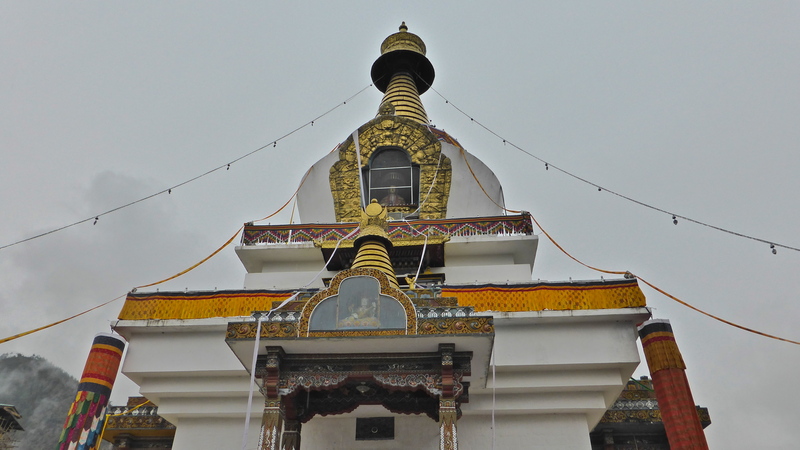 Under construction on a hill above Thimphu is the huge golden ‘Buddha Dordenma’, made of bronze and gilded in gold. 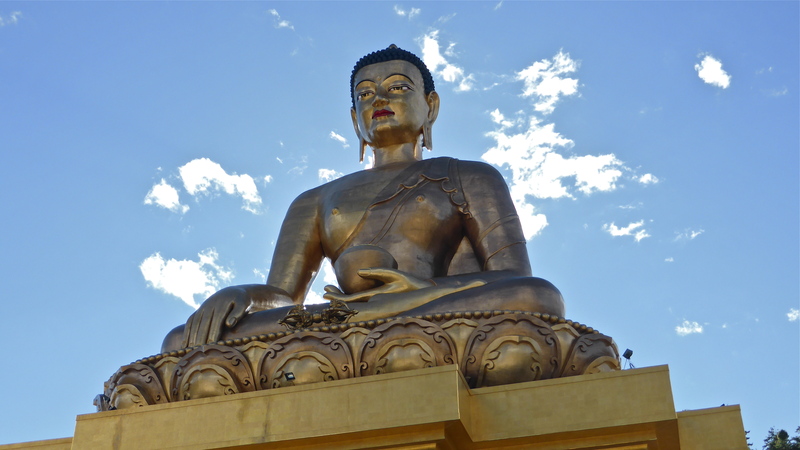 At 169 feet or 51.5 meters in height, it’s one of the largest Buddha rupas in the world. And it’s not just one Buddha! Inside this statue will be placed more than one hundred thousand smaller Buddha statues, each of which will also be made of bronze and gilded in gold. 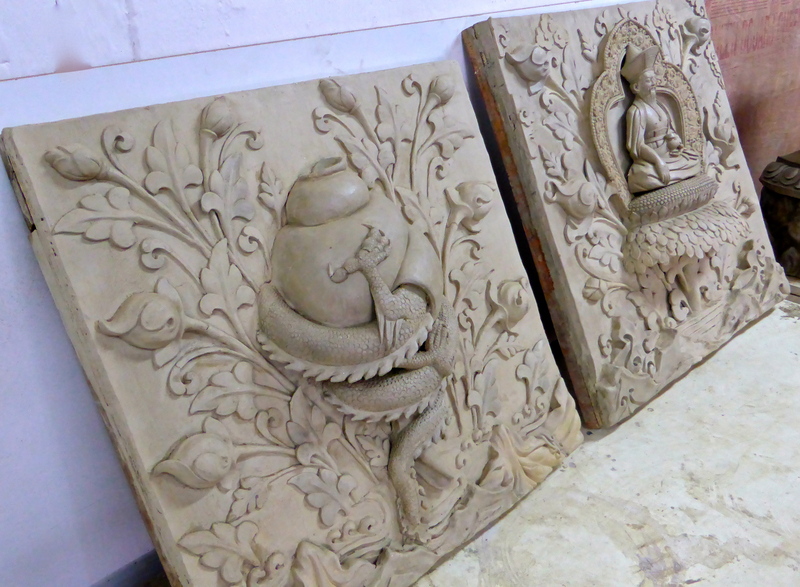 The throne the Buddha sites on will incorporate a large meditation hall. In that hall every sponsor will be named. 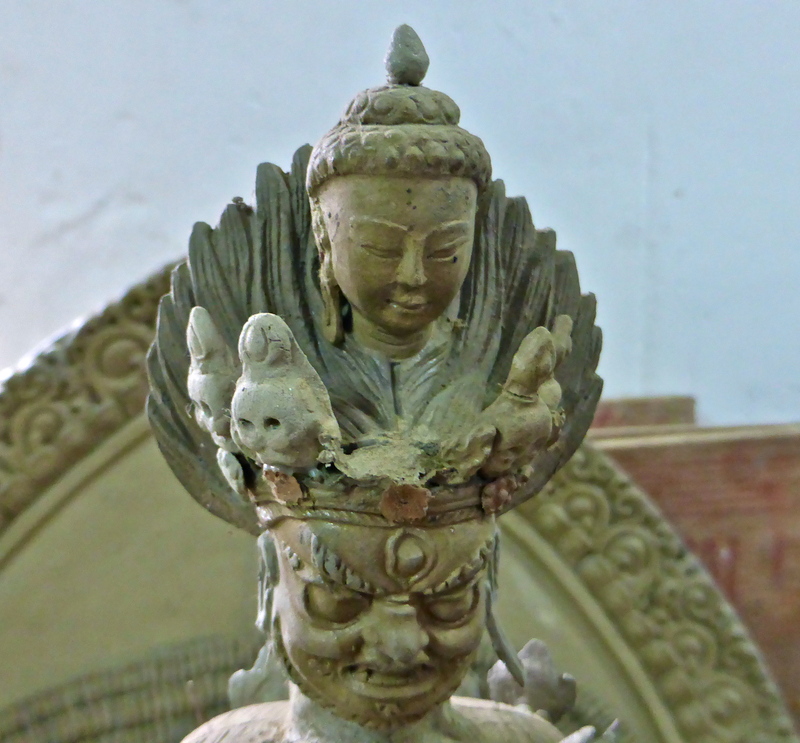 And the cost of this amazing Buddha? Somewhere in the region of US$100 million. This seems a staggering amount to those of us who are not Buddhists but this is a country of devout Buddha followers and for them this is a symbol of hope for peace and happiness in all the world. That, in a country that measures “Gross National Happiness” rather than the usual GDP, is understandable. 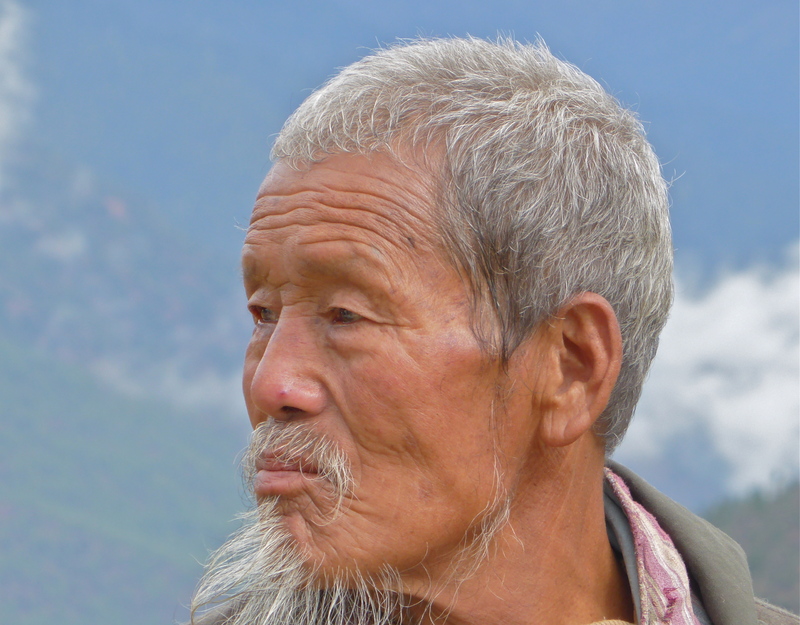 The Bhutanese have a very different mind set, one that we can all do well to learn from. Perhaps this Buddha will indeed be a symbol of the need for peace in our strife ridden world. This Golden Buddha is dedicated to world peace and happiness. May it be so! 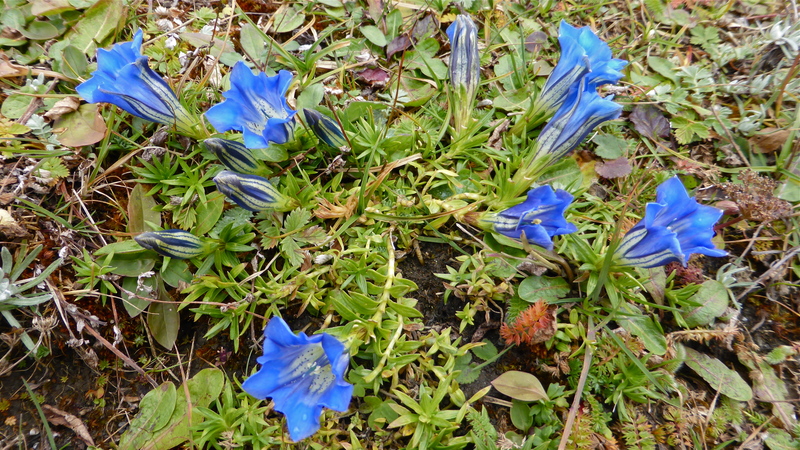 We had just one more day in and around Thimphu. Leave a comment Posted in Bhutan, Travel Tagged Bhutan, Bhutanese mask dancers, Buddha Dordenma, Gross National Happiness, Her Majesty Queen Phuntsho Choden Wangchuck, King Jigme Dorji Wangchuck, Taj Tashi Hotel, Tashichhodzong, The Dancing Policeman, The National Memorial Choeten, Thimphu, Thimphu Dzong, world peace, Zorig Chusun School of Traditional Arts. 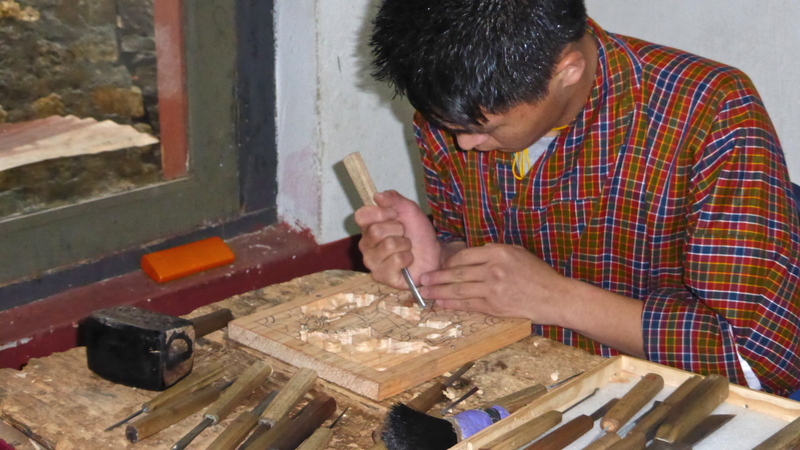 The Zorig Chusum School of Traditional Arts in Thimphu is a teaching institution where the arts and crafts of Bhutan are taught to the next generation of craftspeople. The continuation of this important part of Bhutanese culture is therefore ensured. English is taught in school and is the main language of communication. Learning woodcarving techniques requires time and infinite patience. 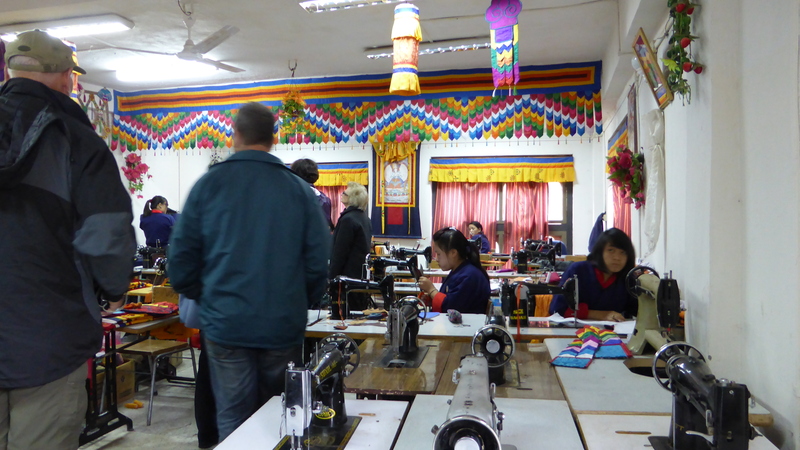 Many sewing machines are used by the students to refine their embroidery techniques. embroidery and each colourful silk hanging. The school room was colourfully decorated with examples og the student’s work. Students in the painting class draw the outlines that will later be painted. 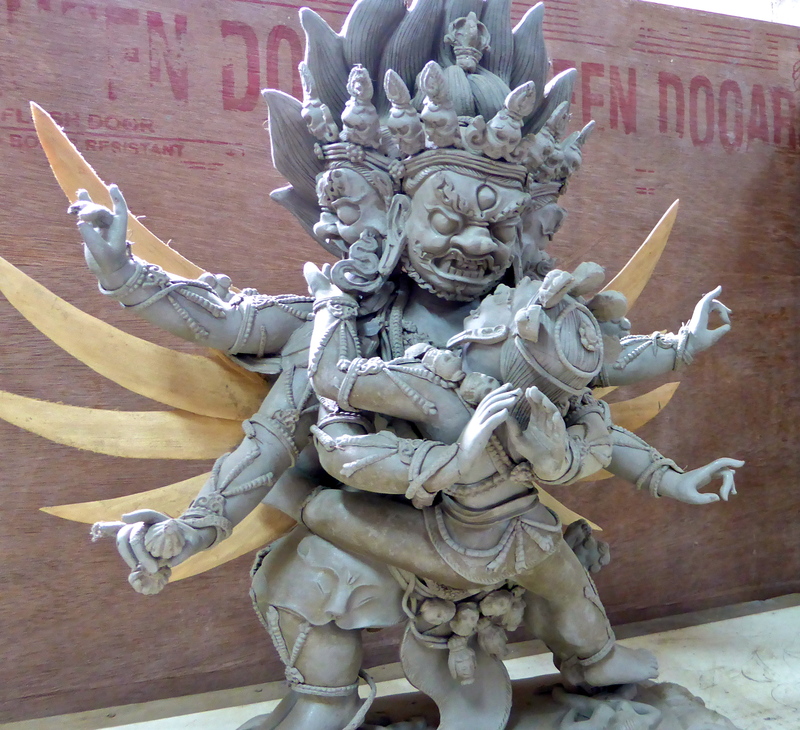 Working with clay is an important part of creating idols used in Buddhist worship. Senior students create very complex and intricate statues. This piece appeared to have been damaged and sent to the school for repair. This finished piece is being painstakingly repaired. Most, if not all the crafts, have a five year apprenticeship. Senior students, like these, have a desk of their own with good window light. 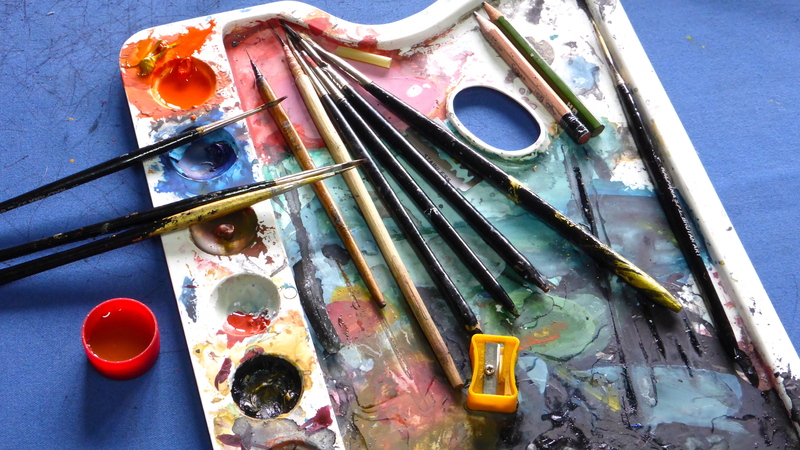 Palettes are generally messy but intriguing and colourful things. These girls are happily working in close proximity to each other. Perhaps they are not very far into their apprenticeship. Extreme concentration is evident in this photo. Note the thimble – made simply from a piece of cardboard. 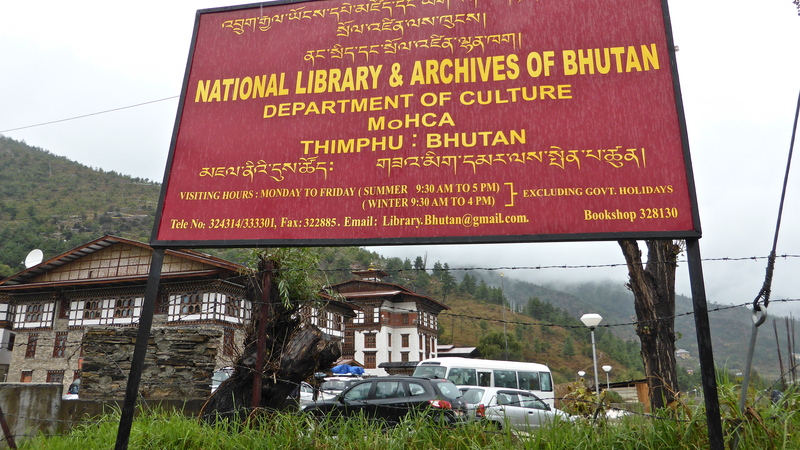 The National Library and Archives of Bhutan is near the Crafts School. 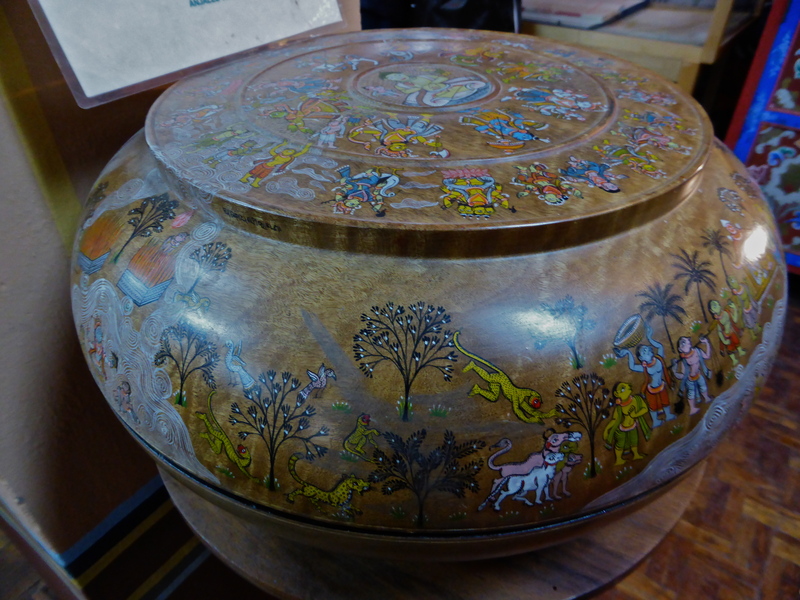 This lidded wooden bowl is intricately painted. It depicts various aspects of Bhutanese culture and the environment. The institution stores many valuable manuscripts including these Bhuddist mantras. Carefully wrapped in silk cloth, the parchments are held between outer wooden protective boards. 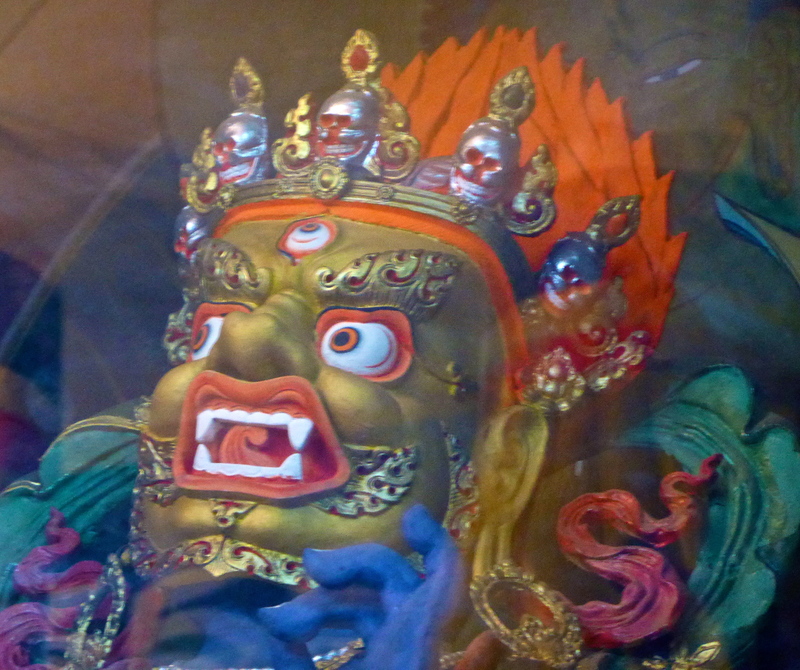 Taking photographs of statues of the various Buddhist deities are forbidden in temples. However, in the museum this was allowed. the intricate detail of the statues could be seen. Scholars at the Craft school aim to be able to make intricate works of art like this one. 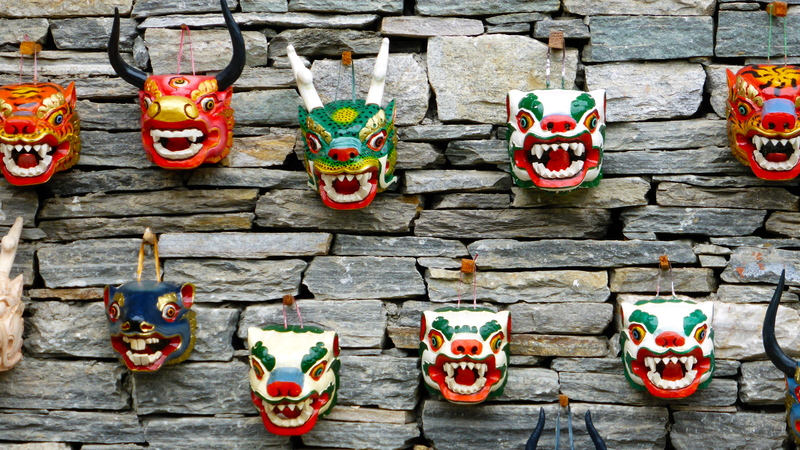 Some of the colourful and grotesque masks made for the tourist trade. 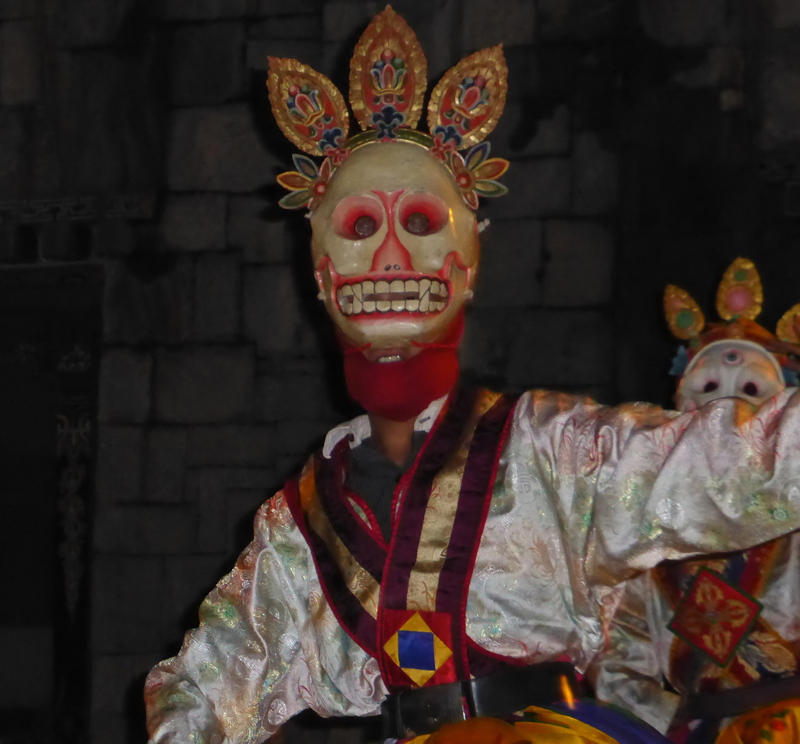 Full-sized masks are used in many of the dances performed on festival days. 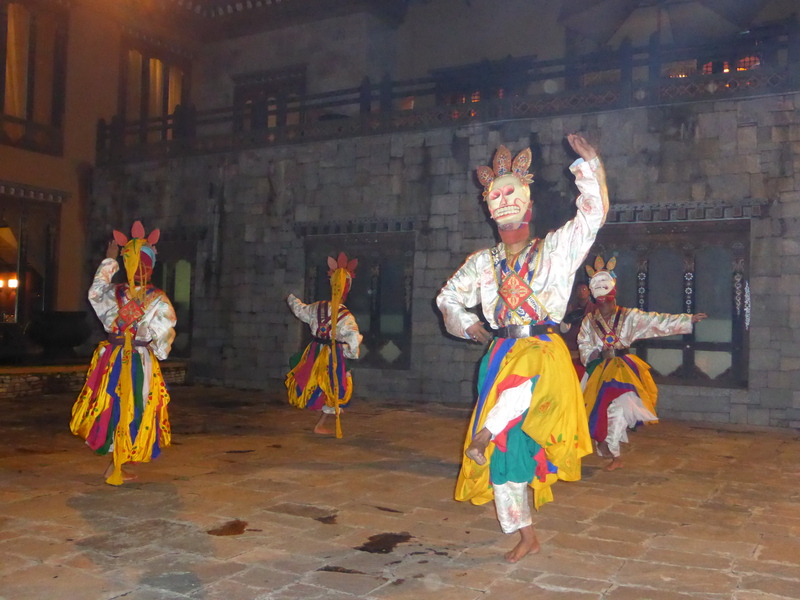 It was good to experience some of this Bhutanese dancing and music. 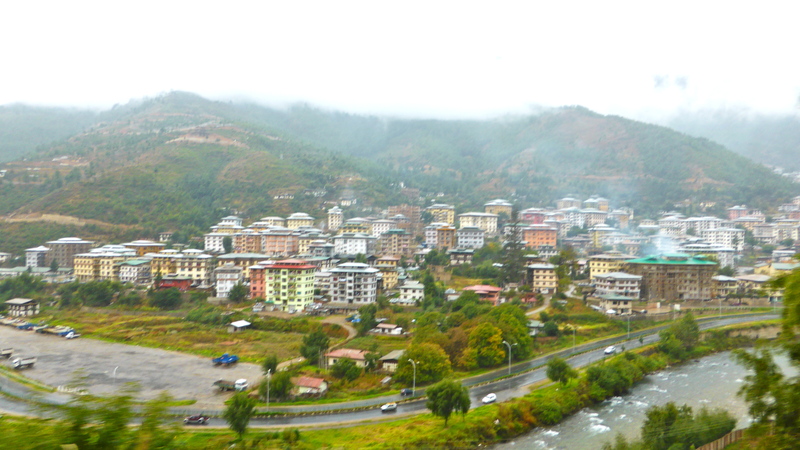 Arriving in the capital, Thimphu, was a slightly different experience to my previous arrival ten years earlier. Many, many more buildings. That’s to be expected in a developing country, but all those shiny corrugated iron roofs was a bit of a surprise. As I understood the building code of ten years ago, construction of anything other than traditional looking buildings was prohibited. That meant in particular, shingle covered roofs were obligatory. You could have a corrugated iron roof ten years ago, but it had to be disguised with shingles laid over the top. 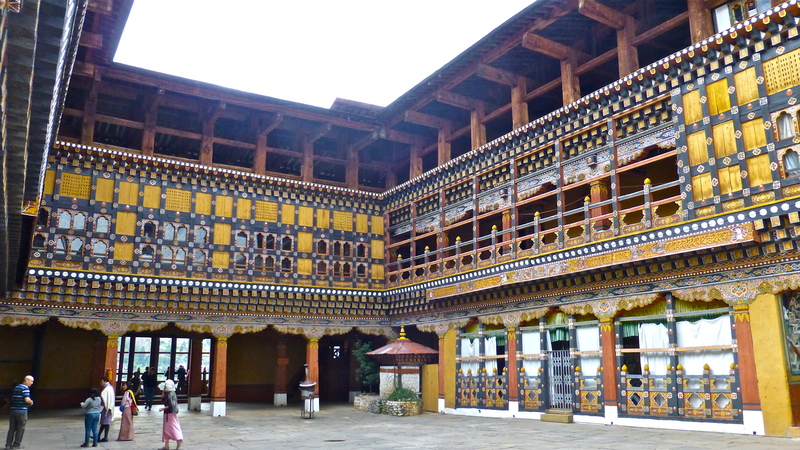 This really did preserve the truly Bhutanese style. Nowadays, the shingles seem to have gone – progress perhaps? – or maybe even availability. But buildings are still limited in height and still exhibit the ‘chunkiness’ and colours I remember. 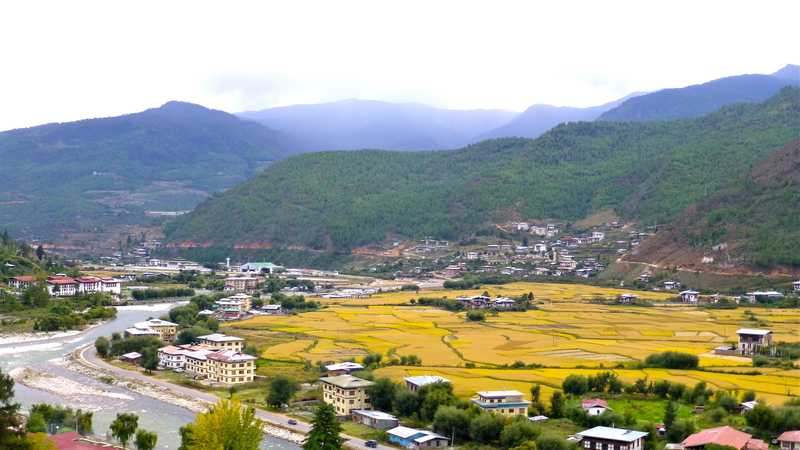 Thimphu is still very much Thimphu! 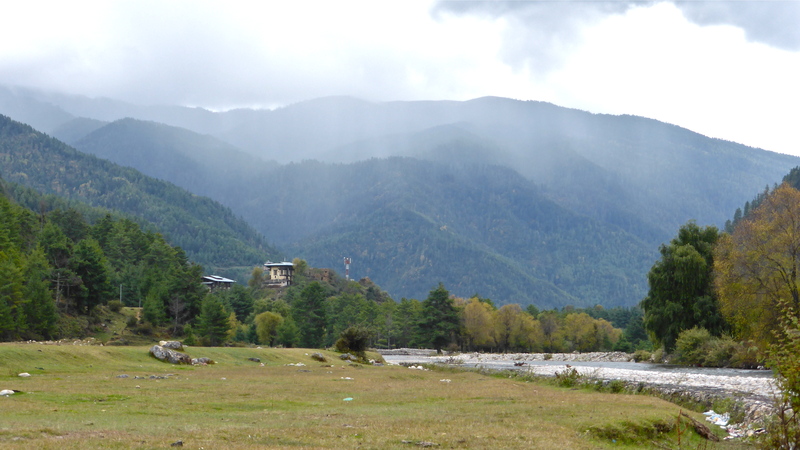 Thimphu is one of the very few capital cities that does not have an airport, rather it is served by the airport at Paro some 54km (34ml) away. This is because the country only has one valley long enough for a runway. Pilots must possess a special license to land at Paro as arriving planes must first negotiate a high pass and then be guided up the twisting valley to the runway. It is quite an experience to land at Paro. On looking out the windows of the plane there are mountain slopes at the wingtips on both sides of the aircraft. 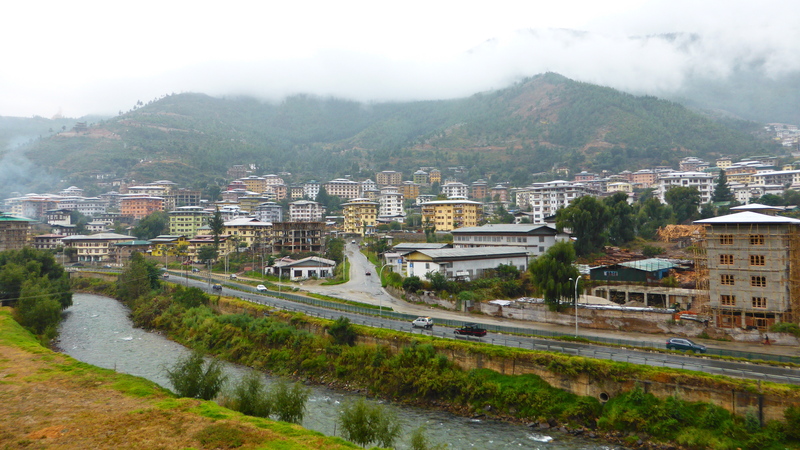 The Wang Chuu and colourful city buildings of Thimphu. Buildings are limited to 5 stories in height. 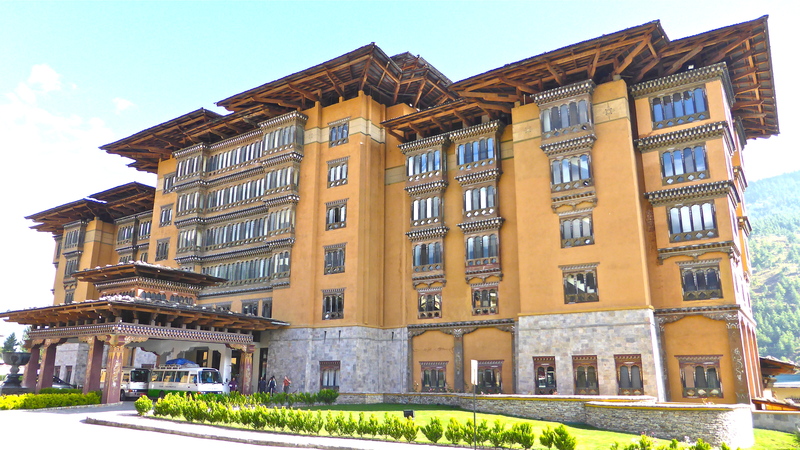 Our rather grand hotel in Thimphu, the Taj Tashi Hotel. The rather dramatic foyer of the Taj Tashi Hotel, Thimphu. 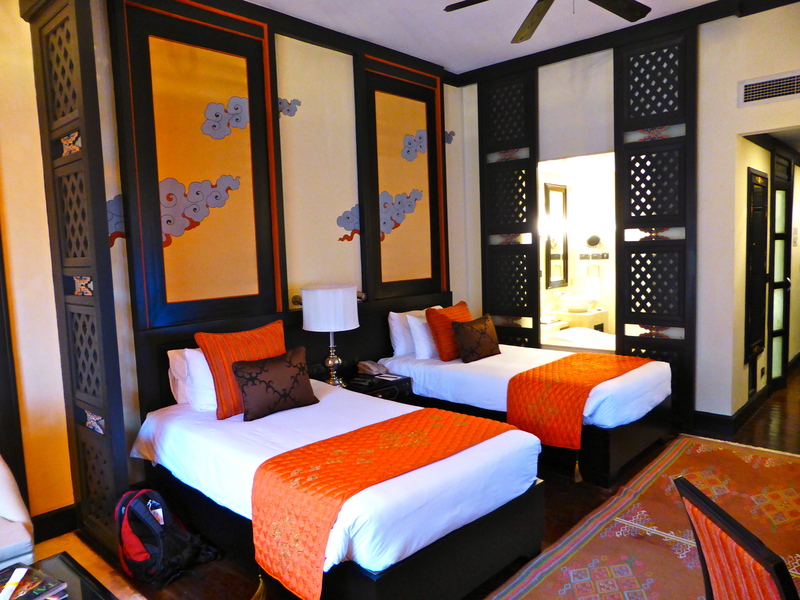 Our bedroom decorated in typical Bhutanese style and colours. 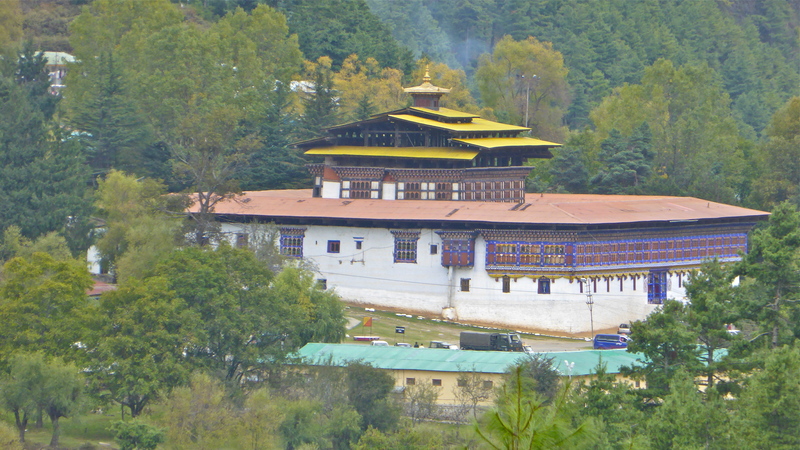 Tashichho Dzong. 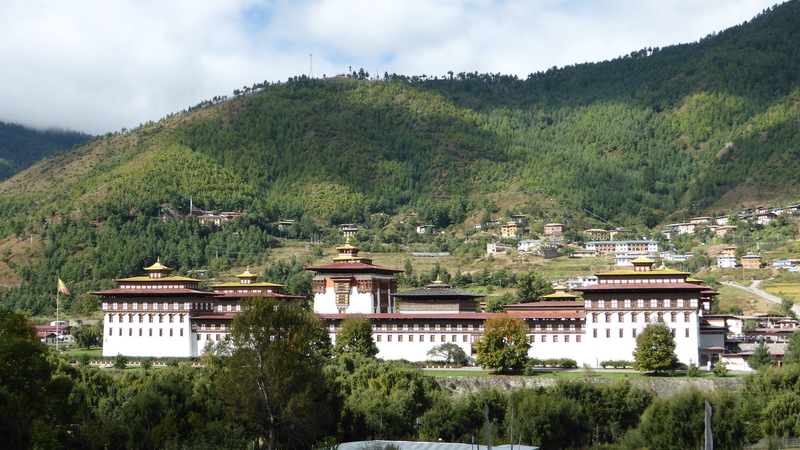 The dzong is the seat of the Bhutanese government and houses some ministeries, the throne room and offices of the king. 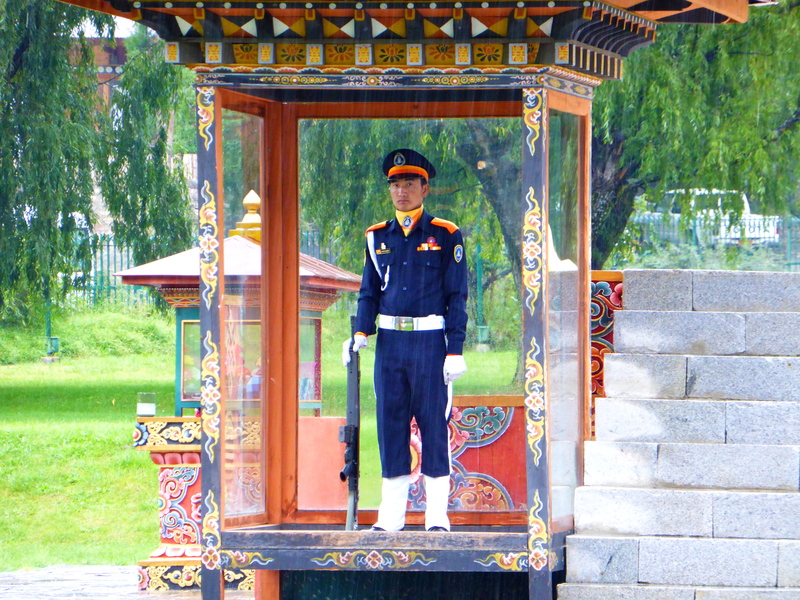 A guard at the Tashichho Dzong. This post actually overlooks the nearby king’s residence, Dechencholing Palace. No photographs in the opposite direction are allowed. 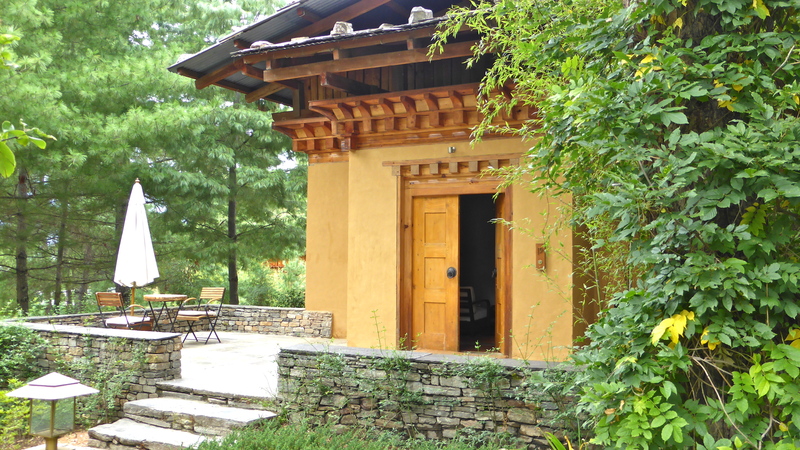 A courtyard within the Tashichho Dzong. It was raining but this monk still makes a water offering. Woebetide any unsuspecting tourist beneath, tradition and the gods come first! 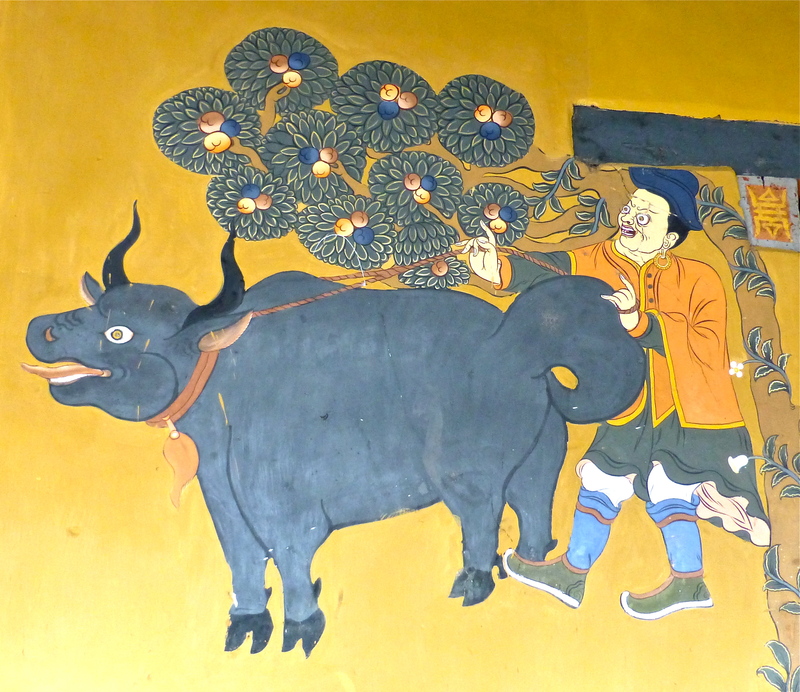 Colourful murals depict Buddhist stories on most walls. 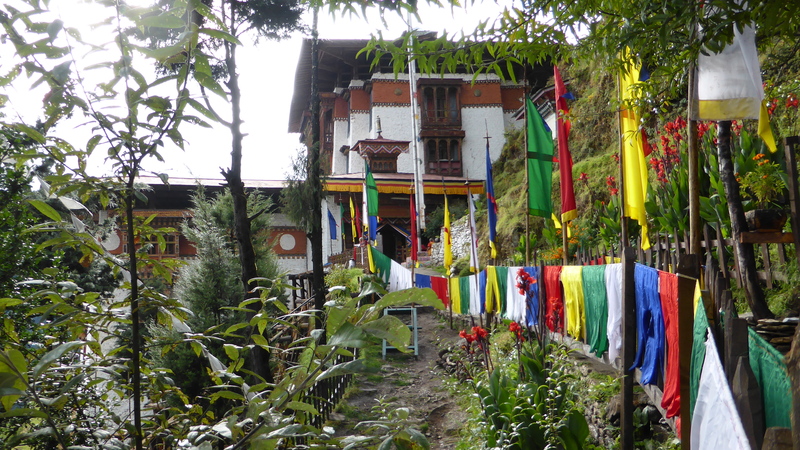 Colourful silk hangings adorn the dzong. 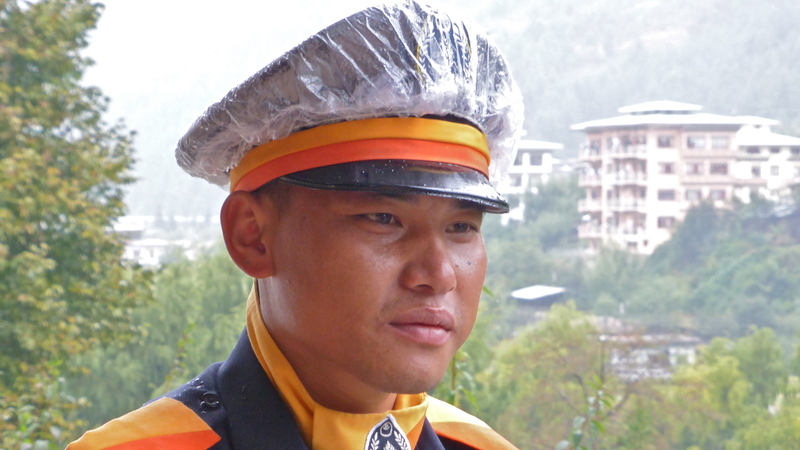 Another guard at the dzong.